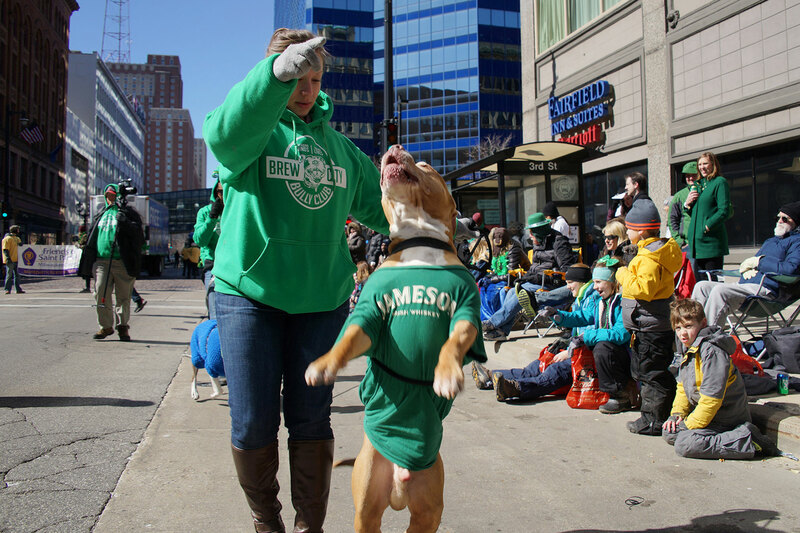 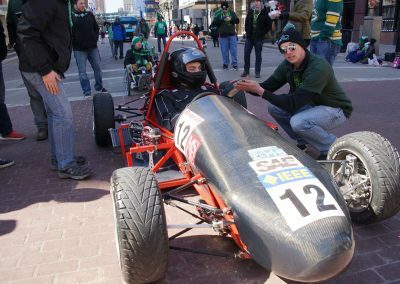 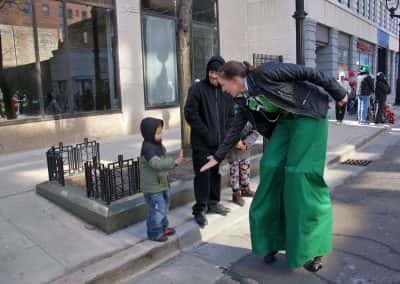 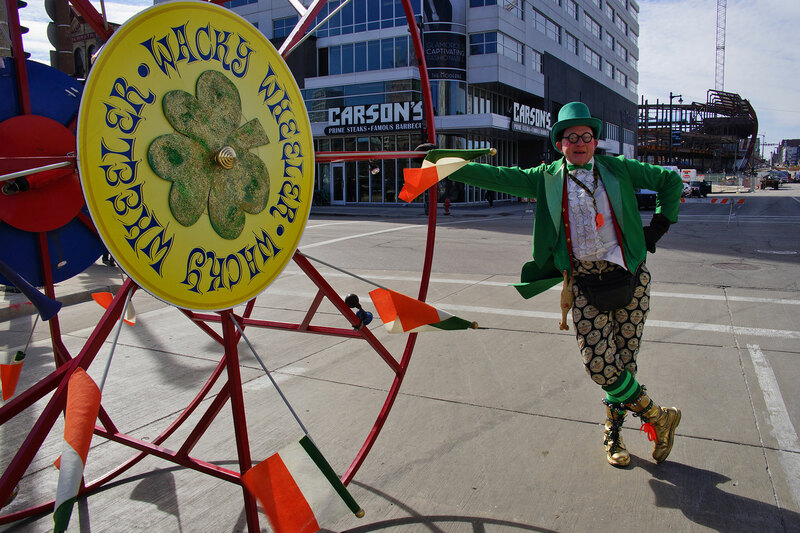 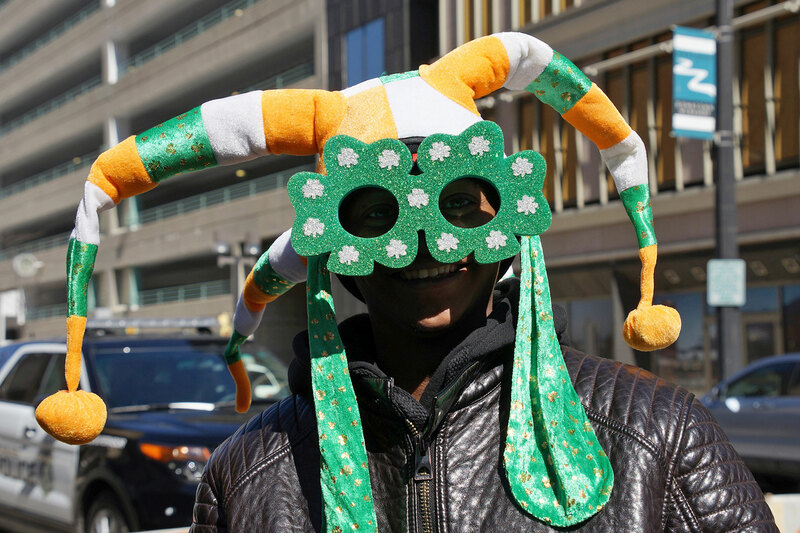 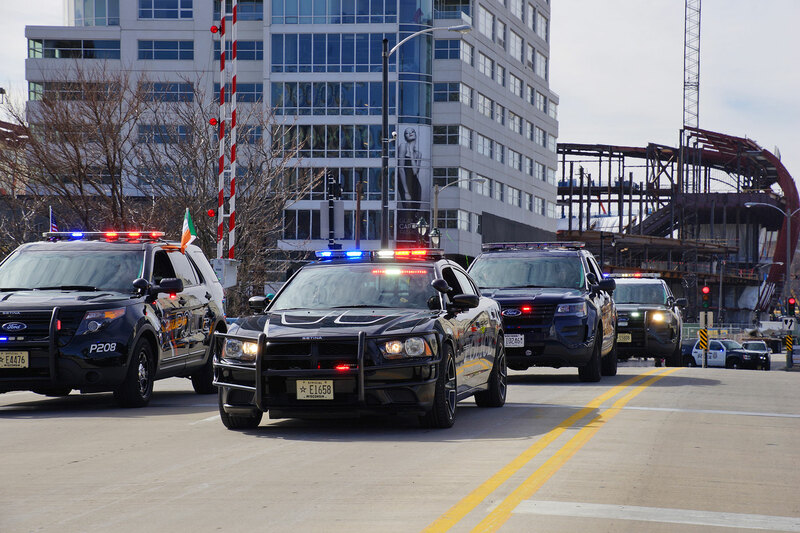 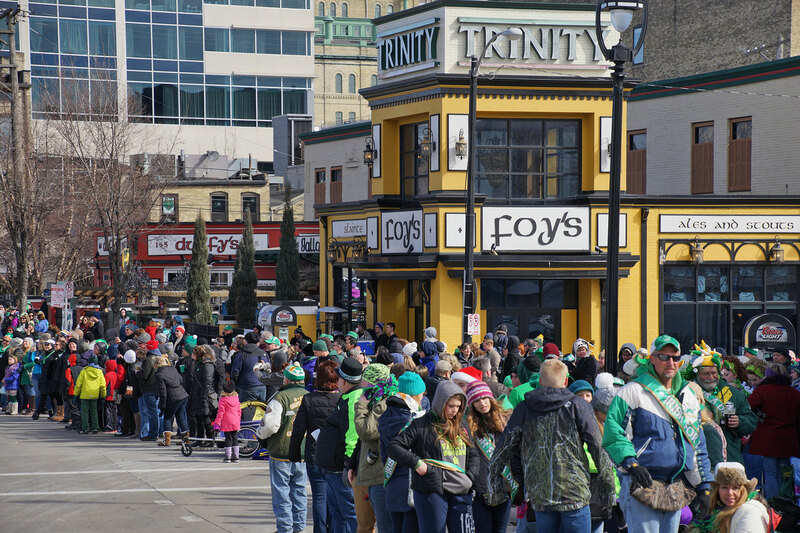 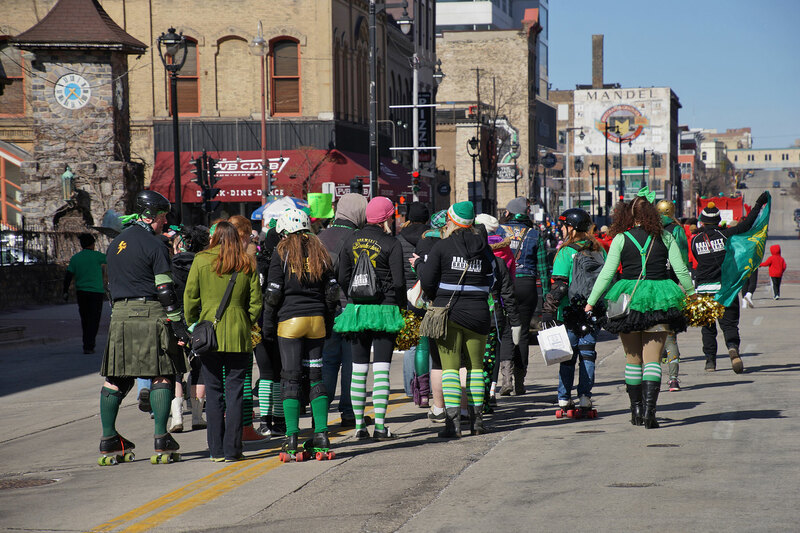 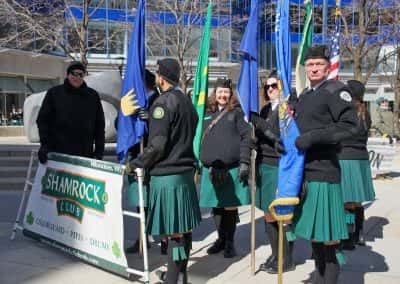 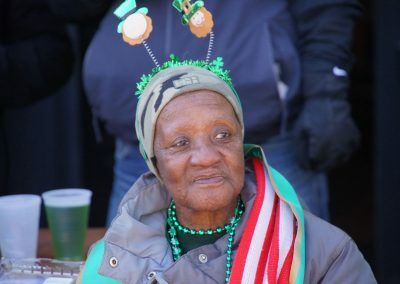 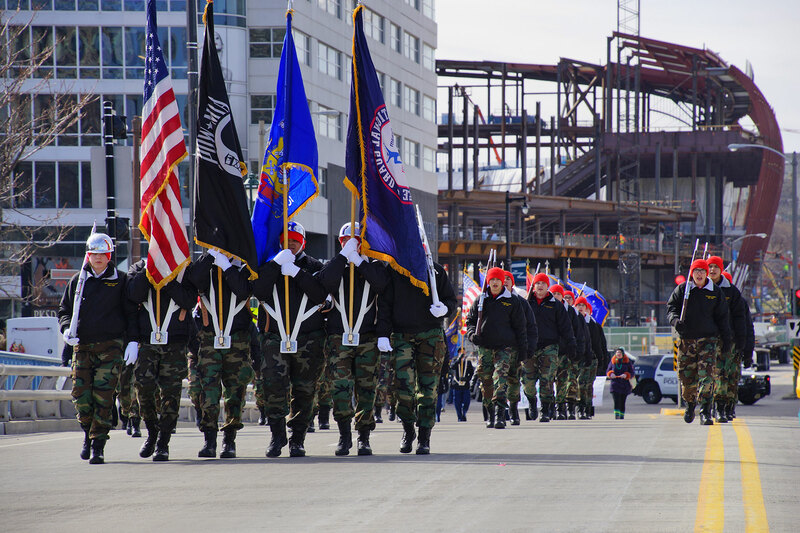 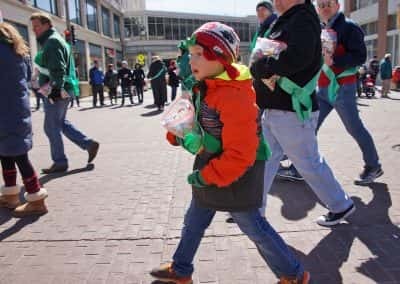 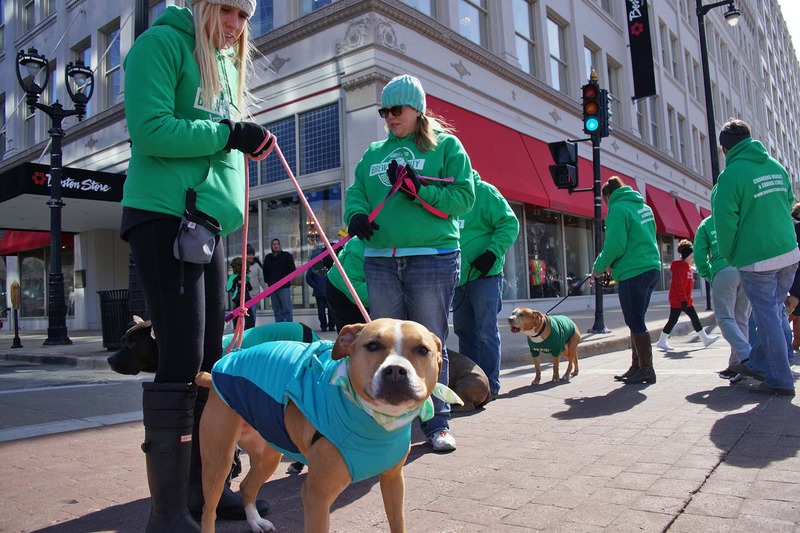 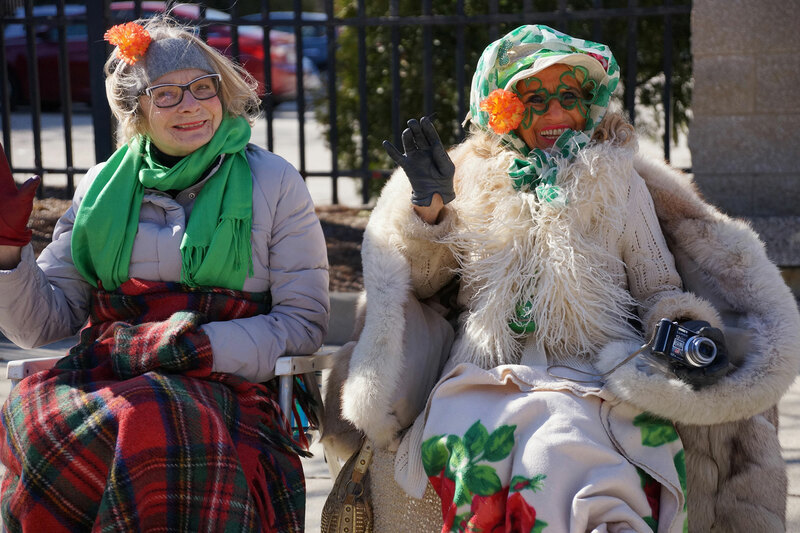 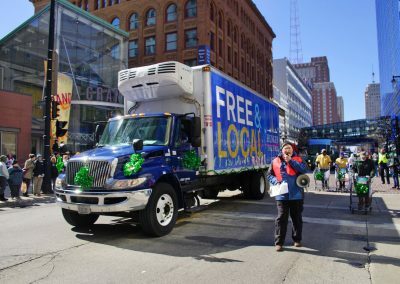 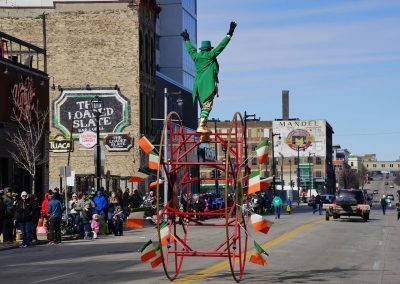 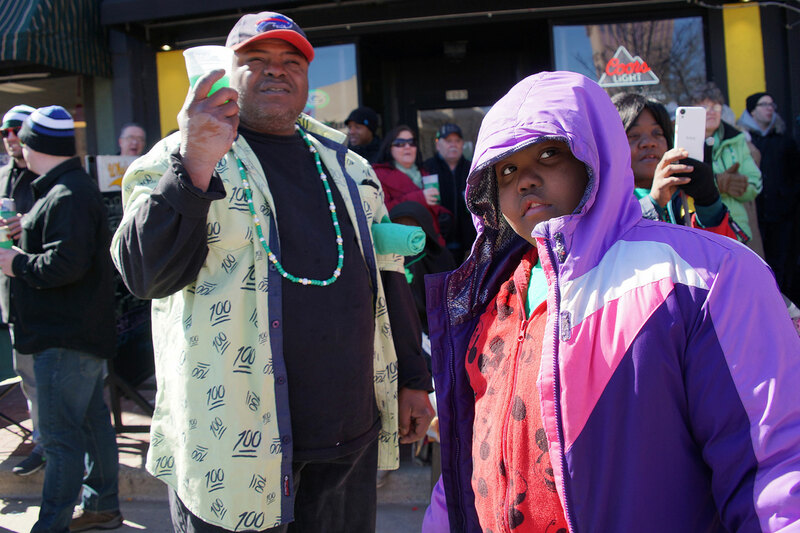 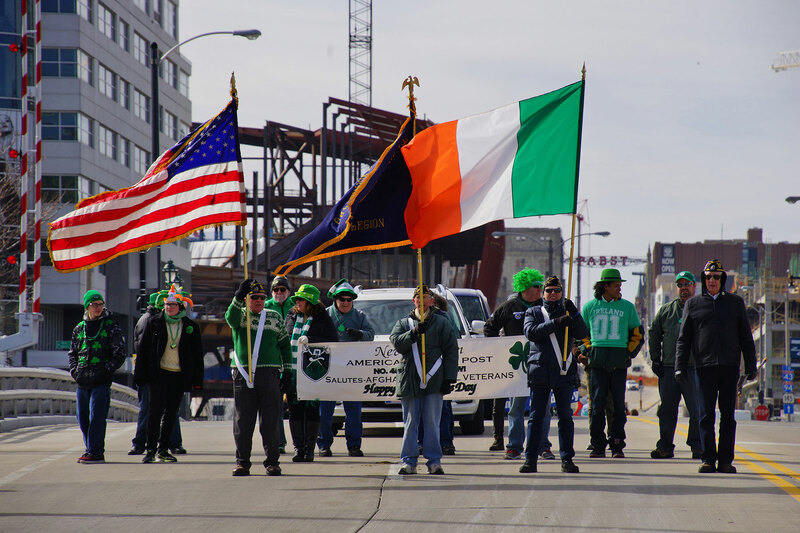 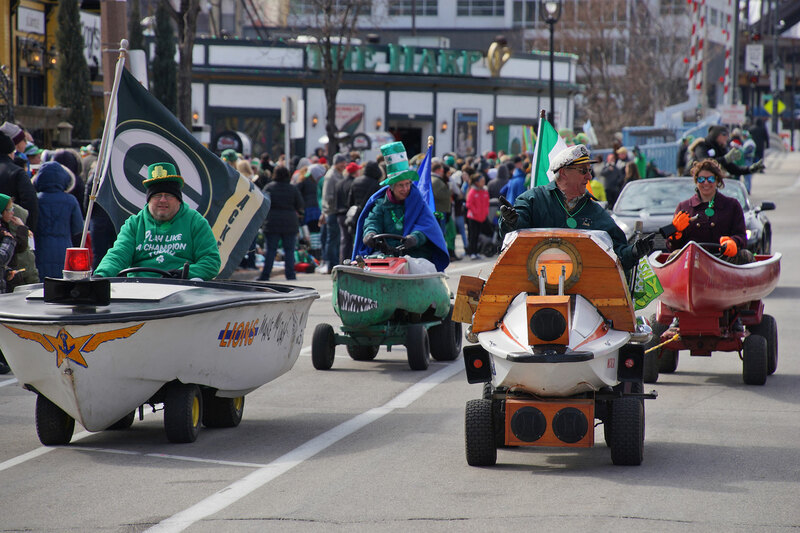 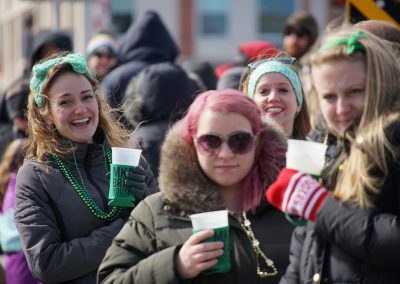 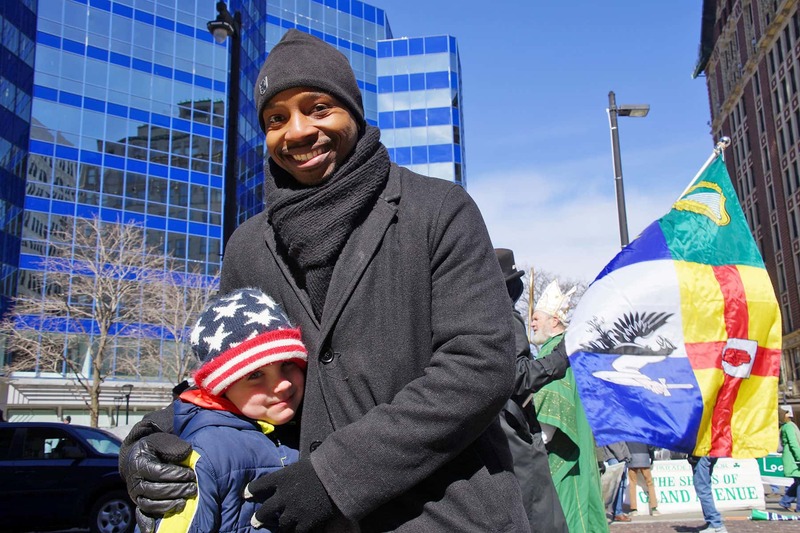 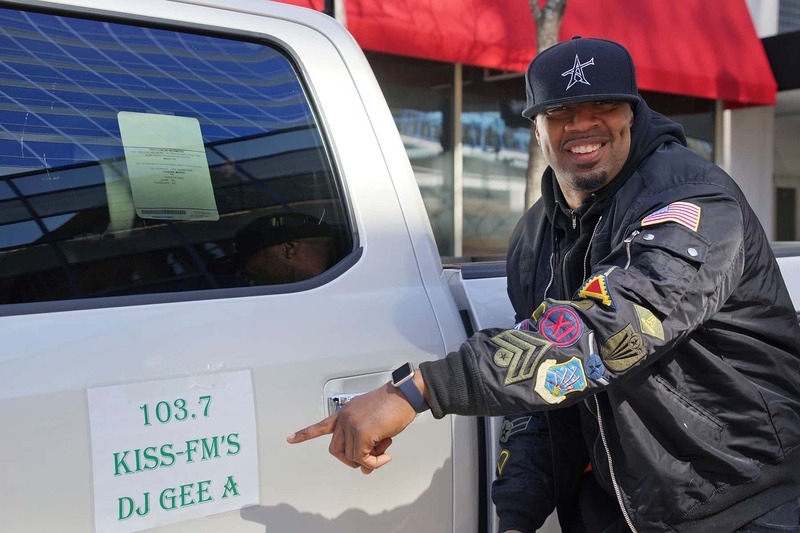 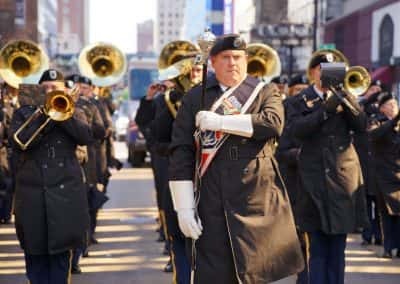 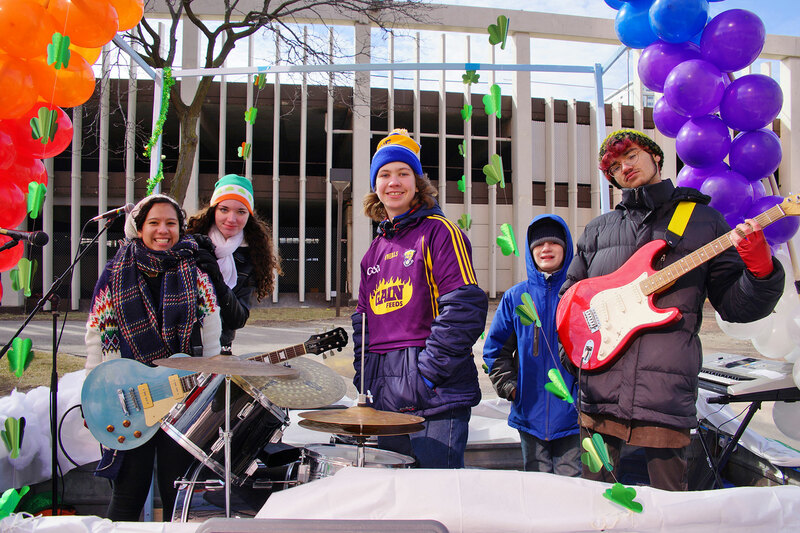 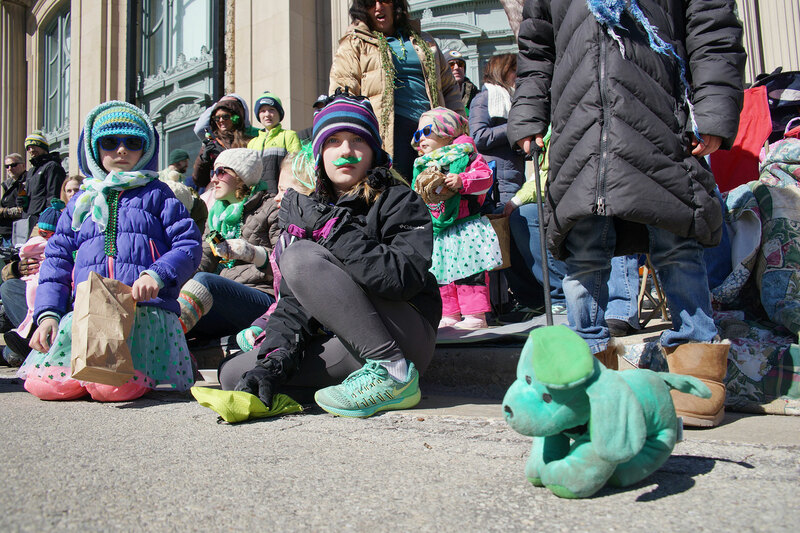 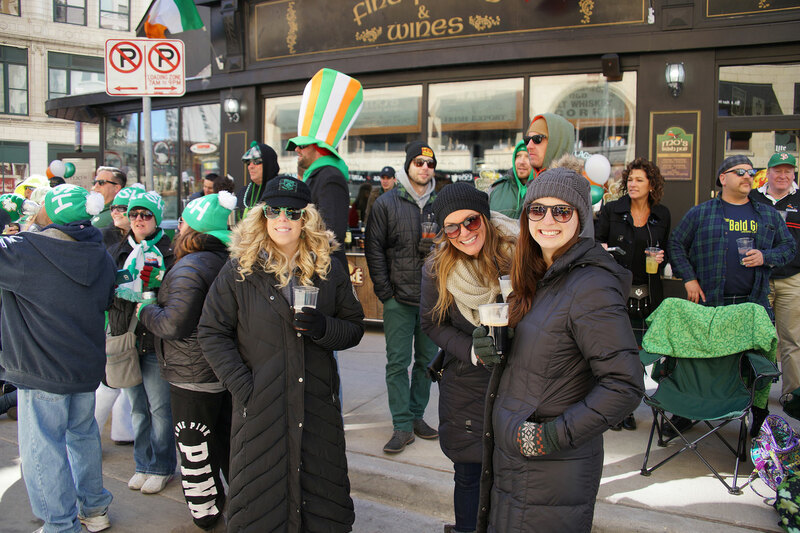 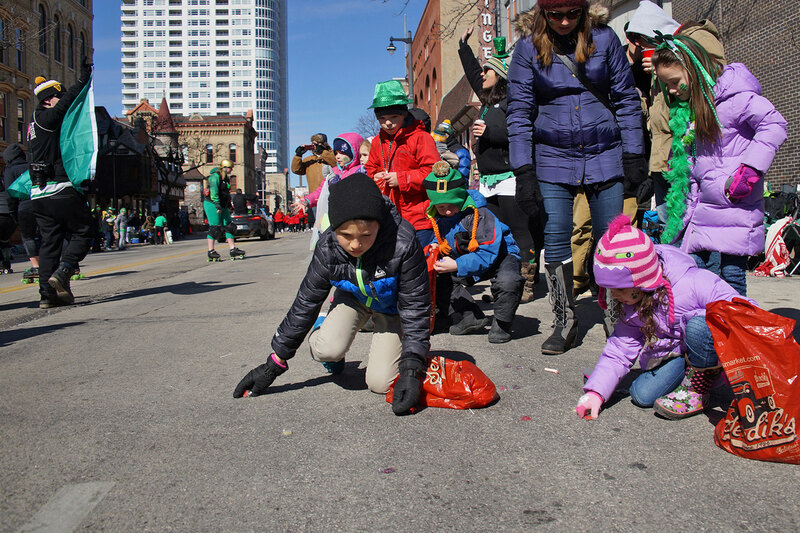 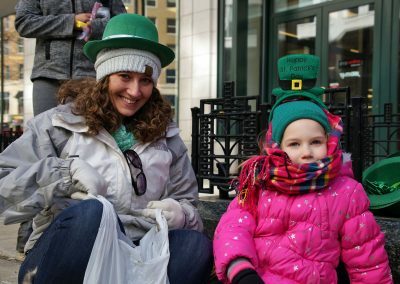 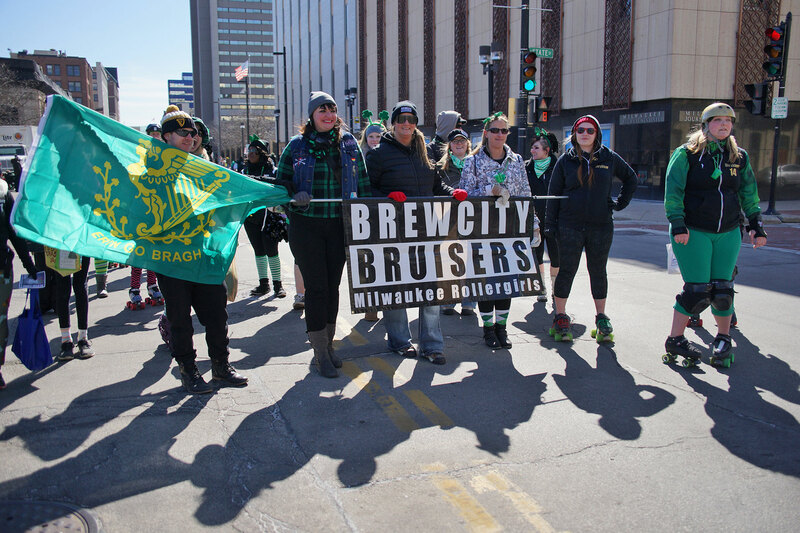 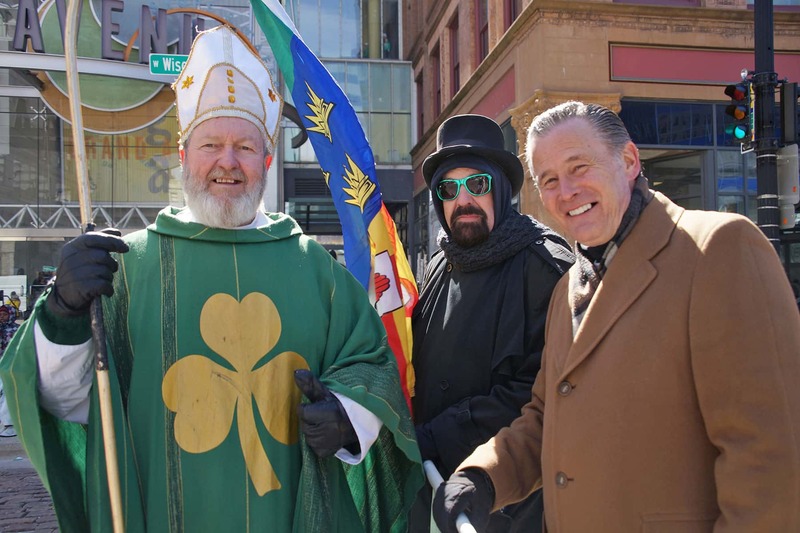 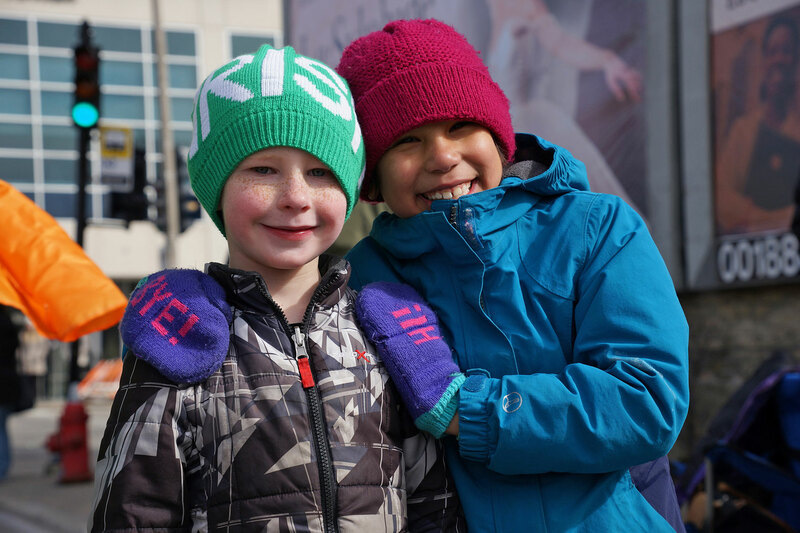 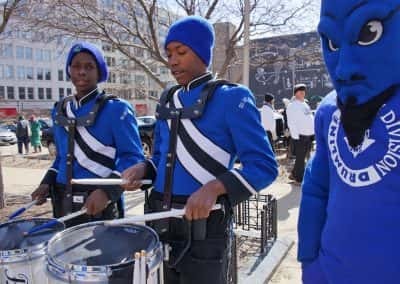 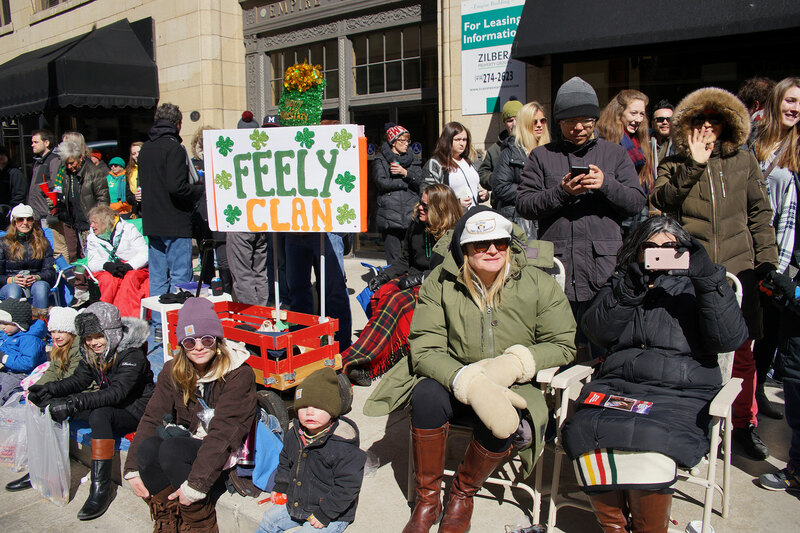 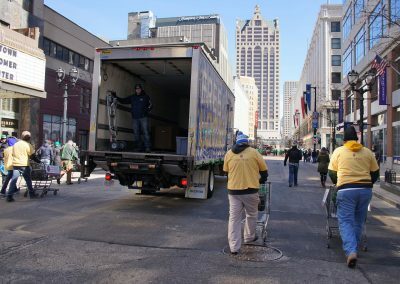 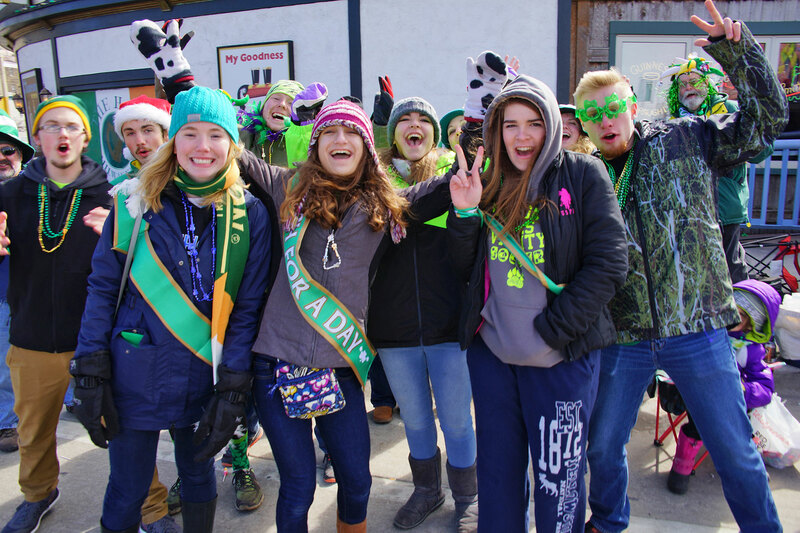 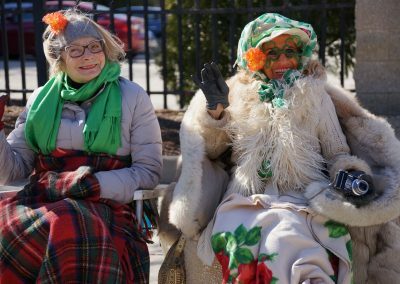 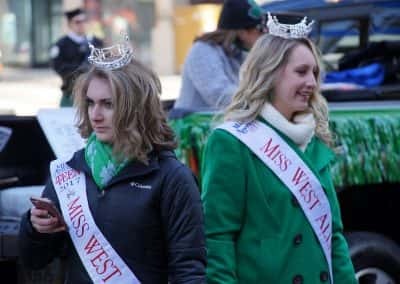 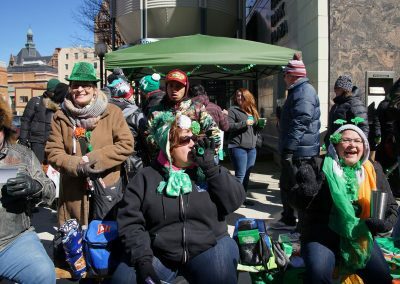 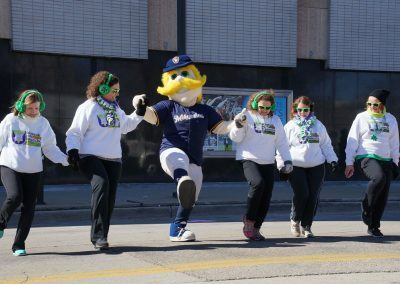 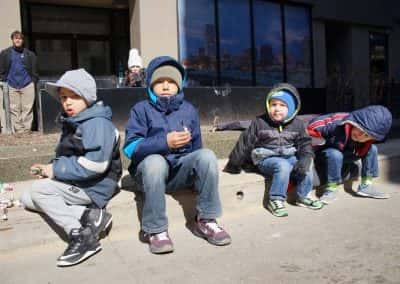 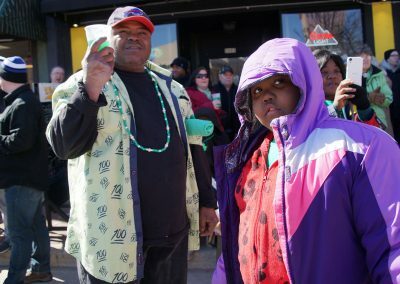 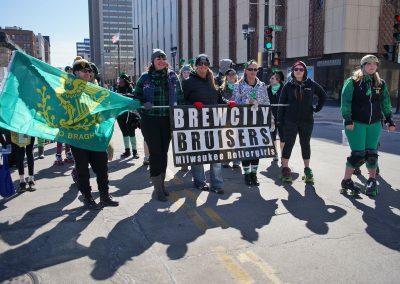 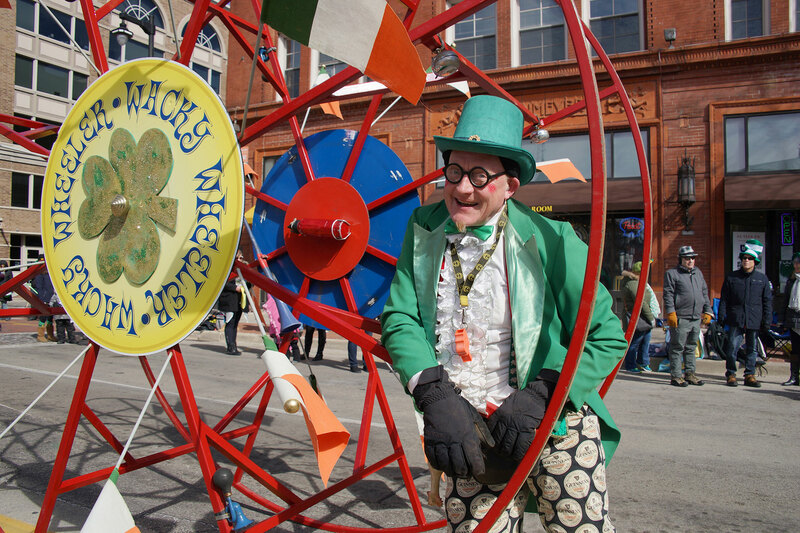 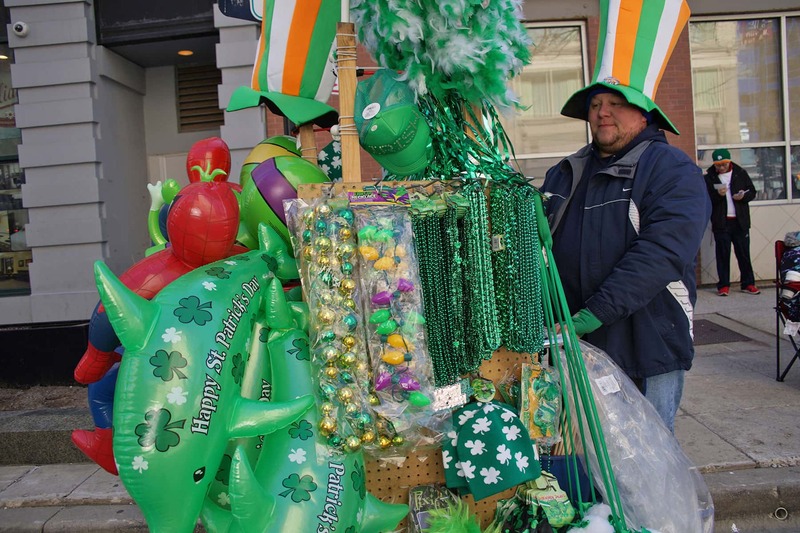 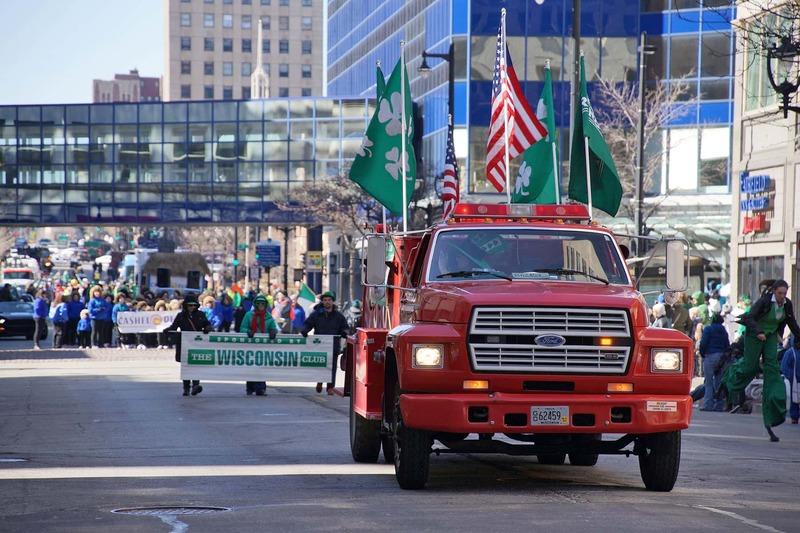 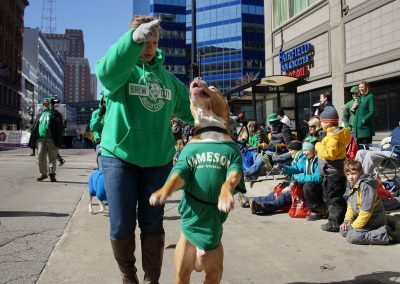 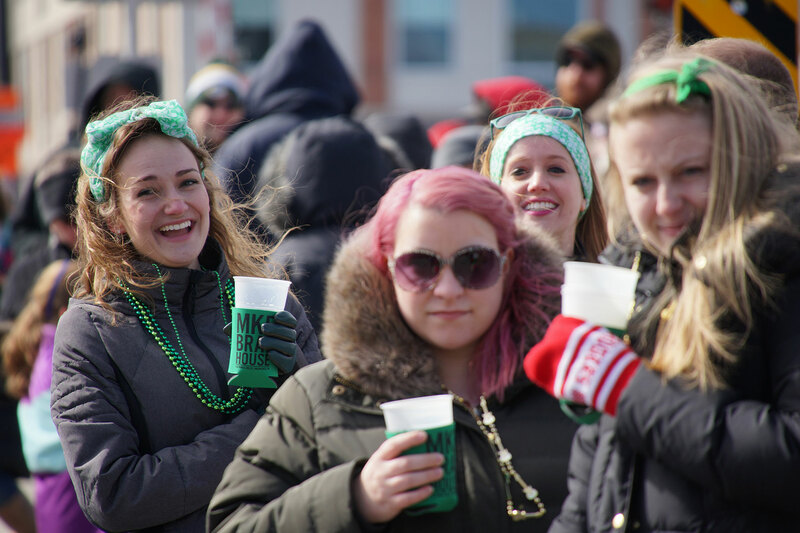 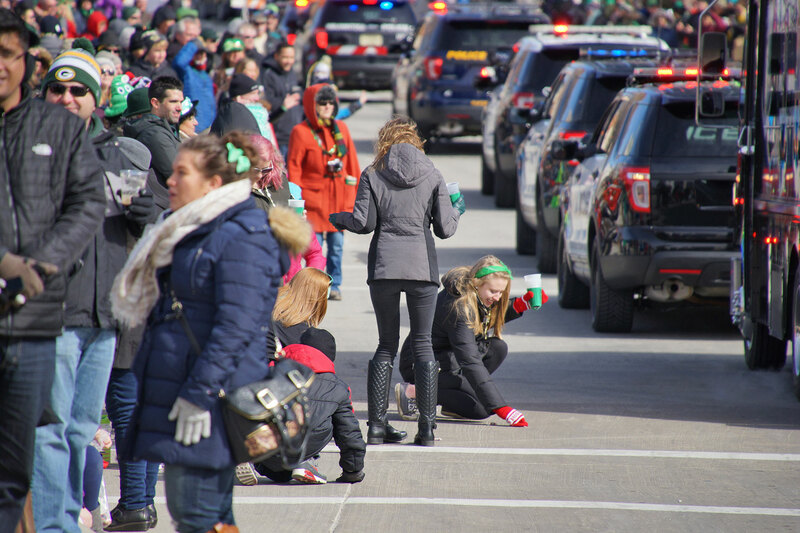 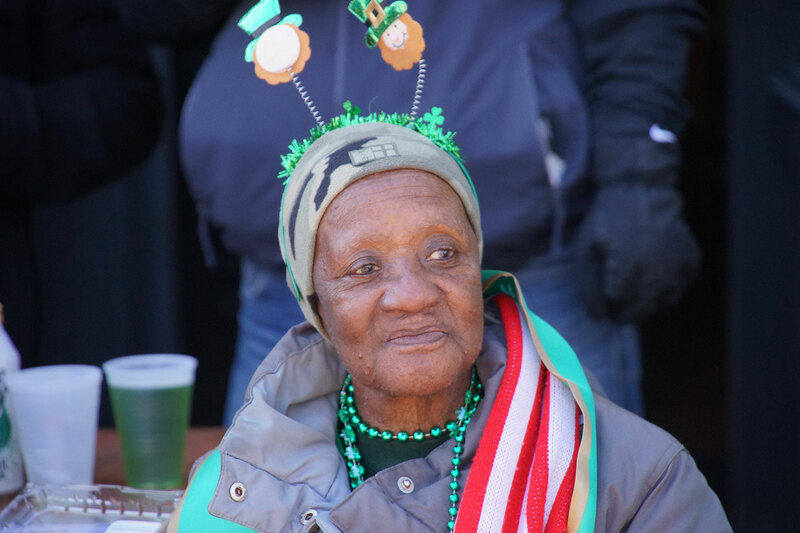 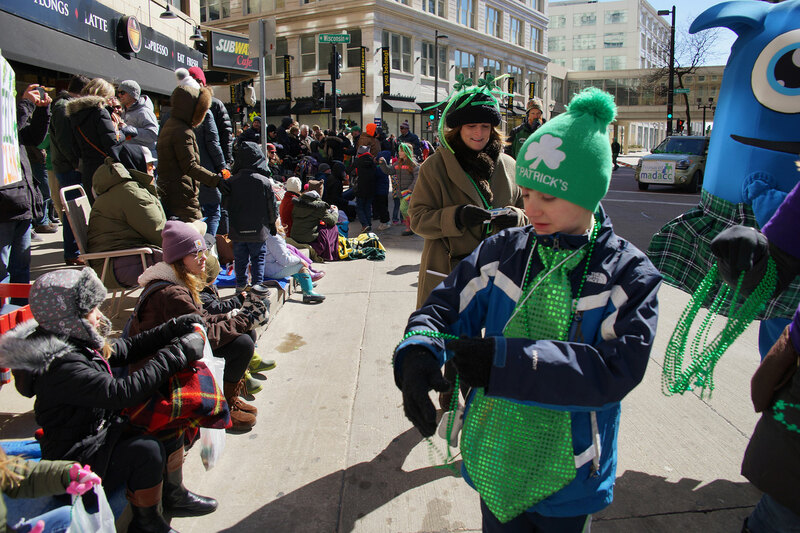 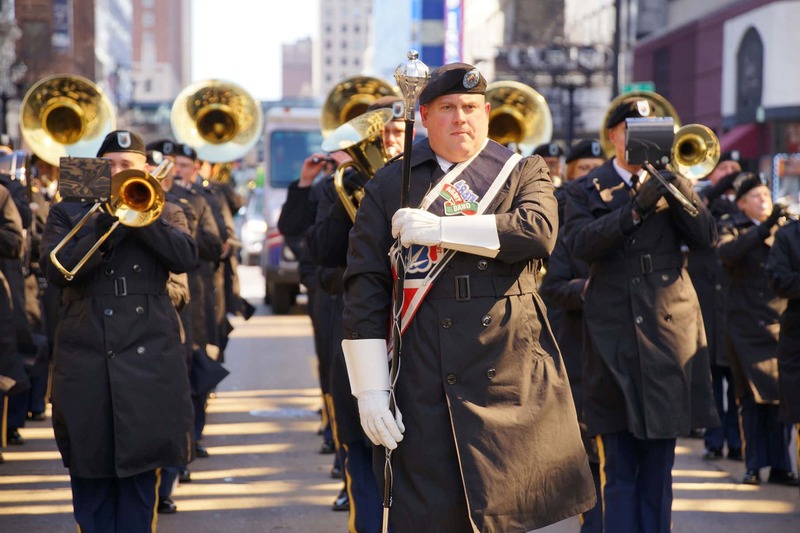 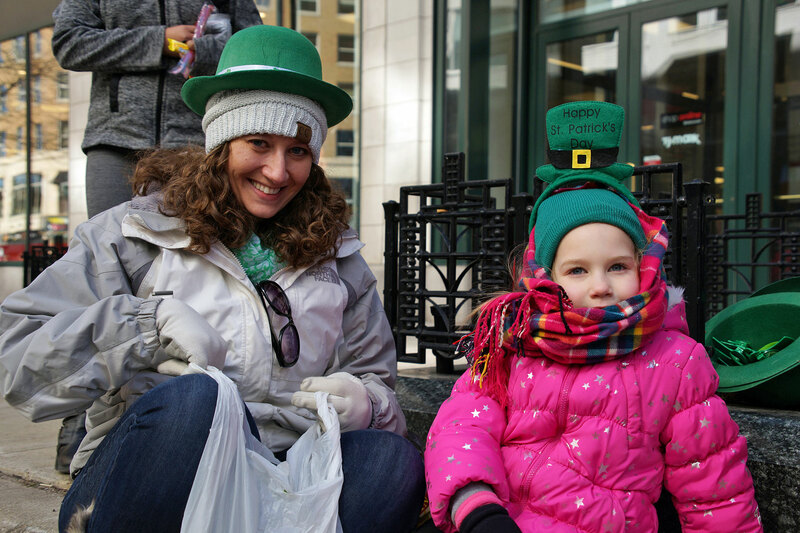 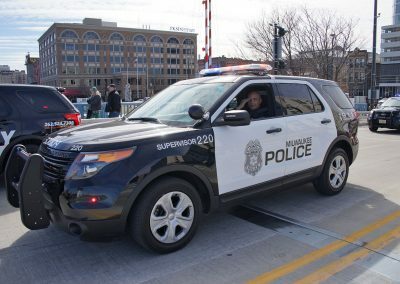 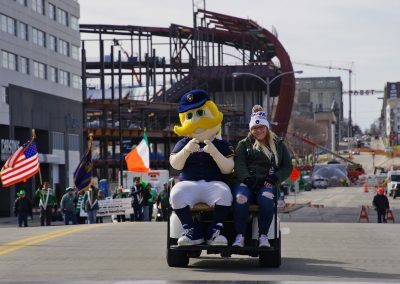 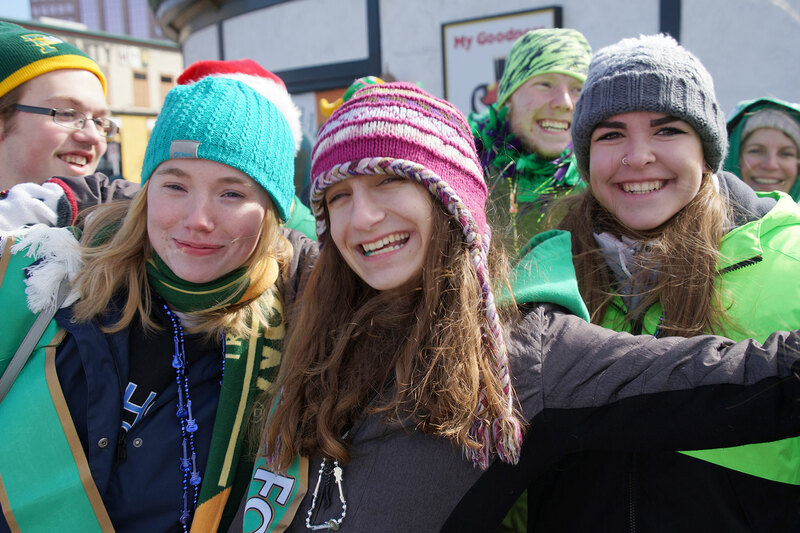 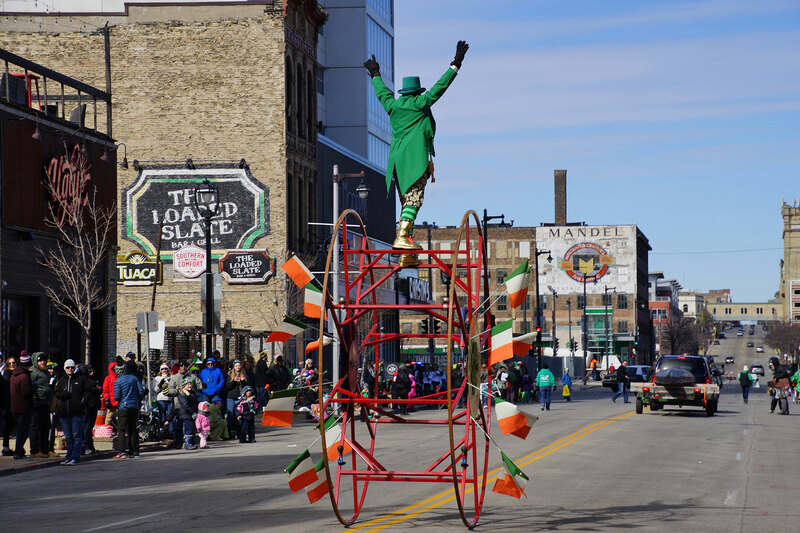 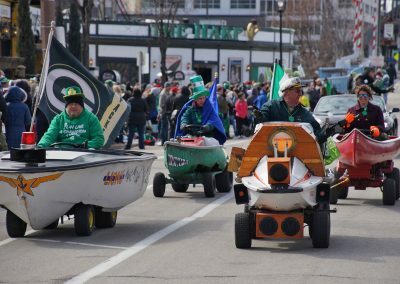 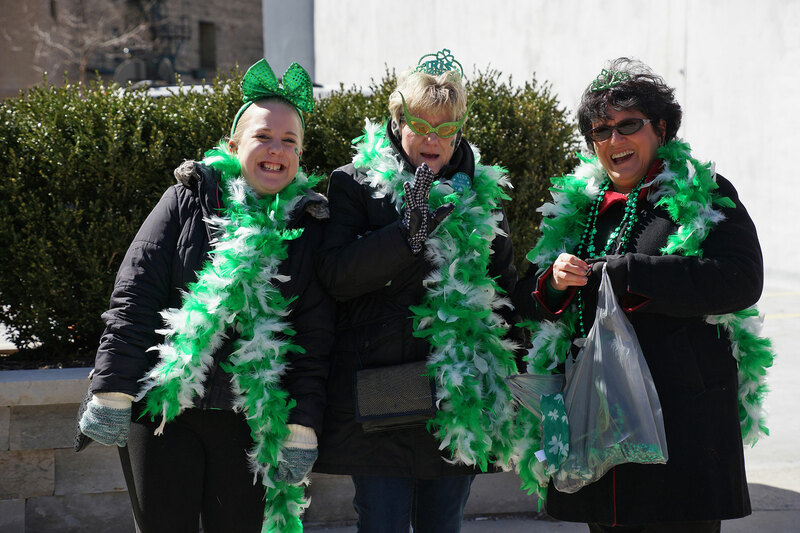 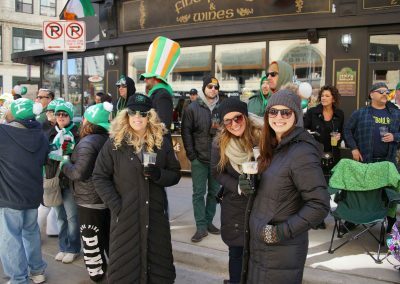 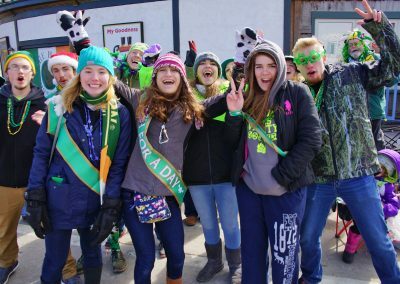 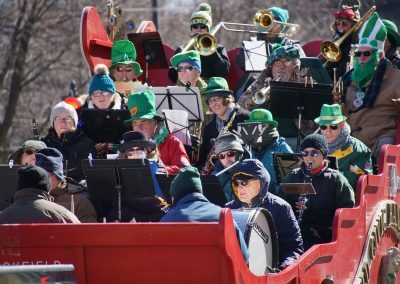 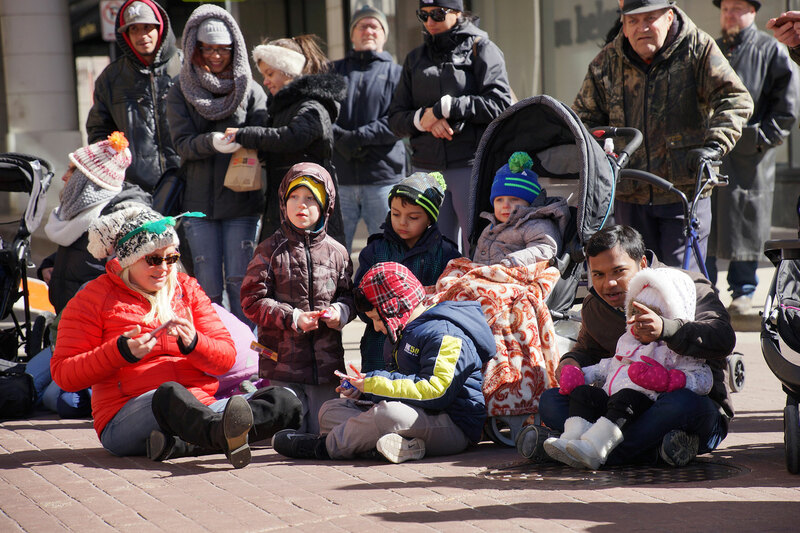 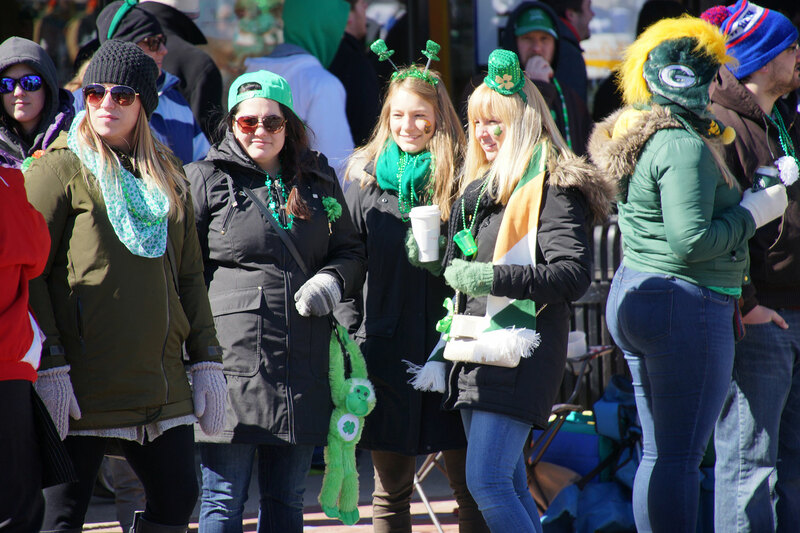 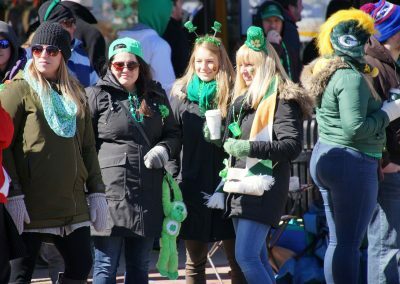 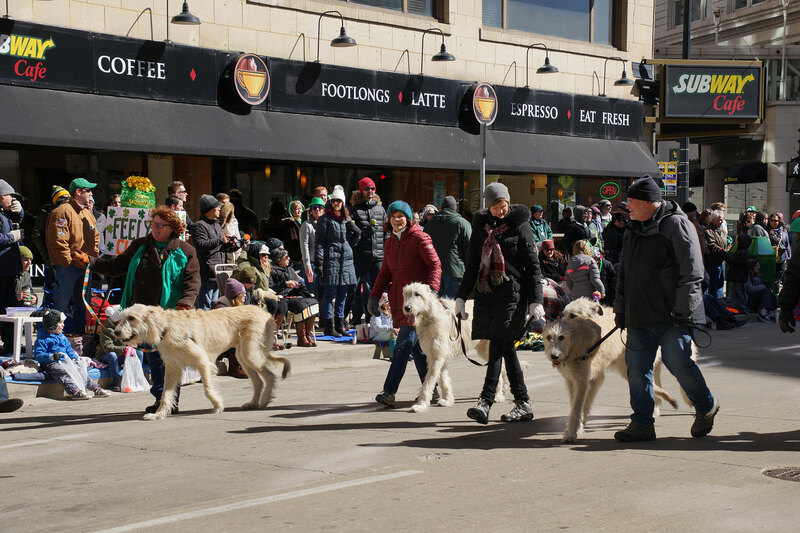 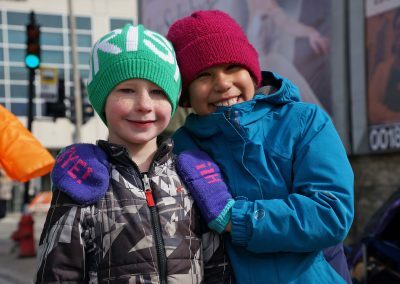 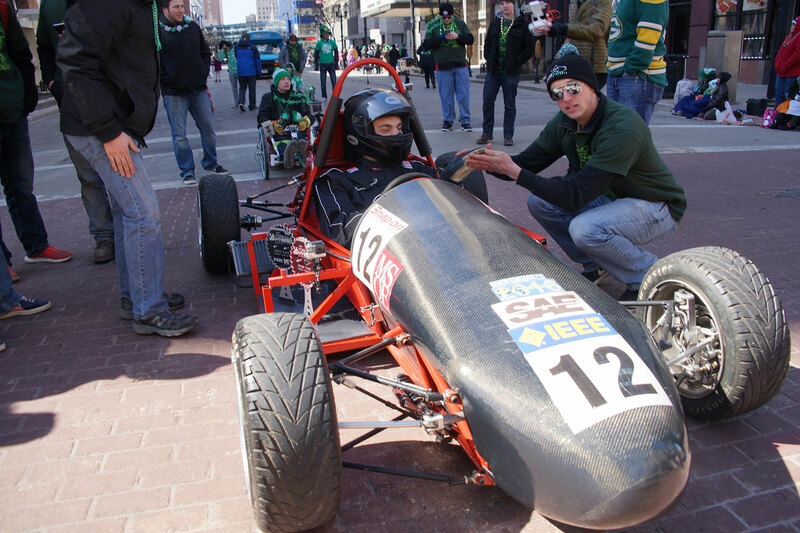 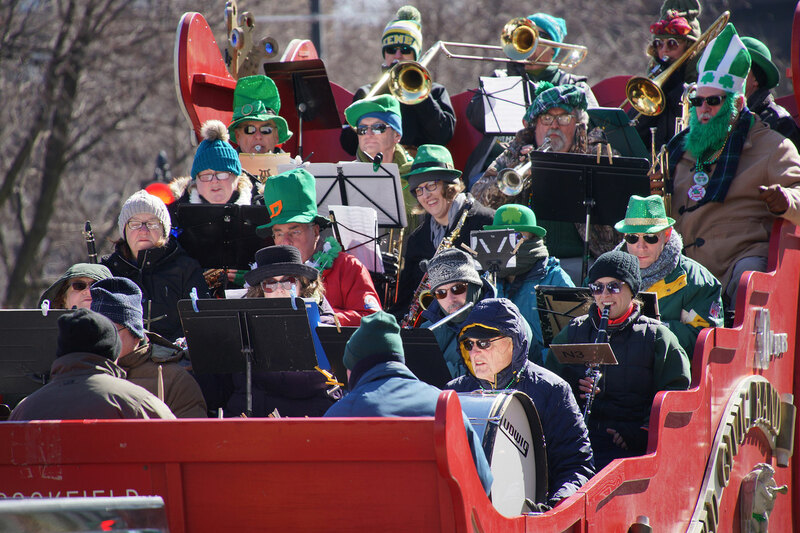 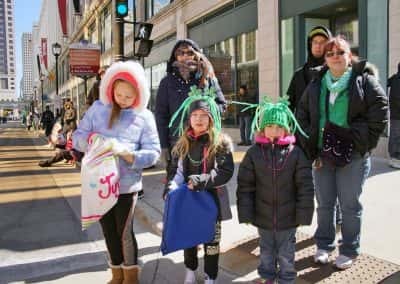 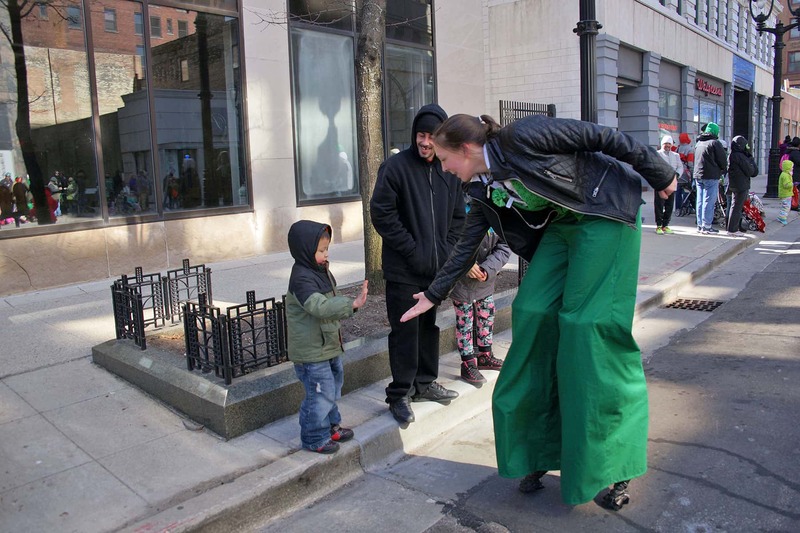 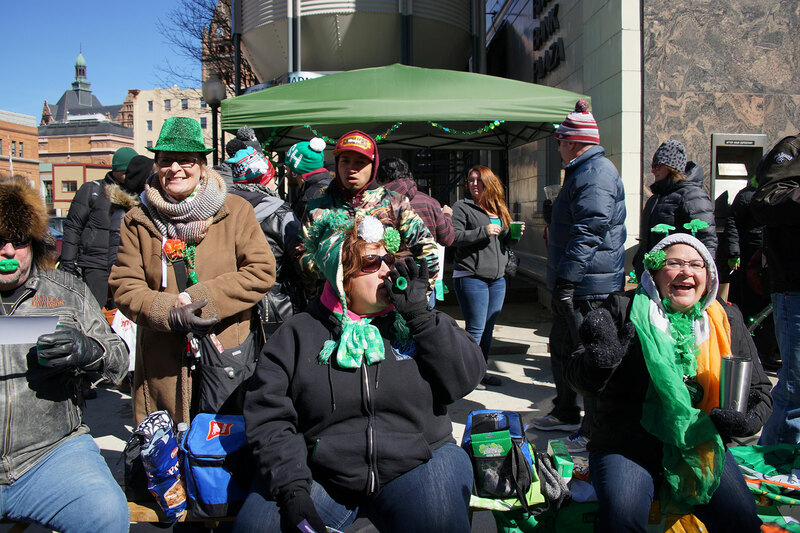 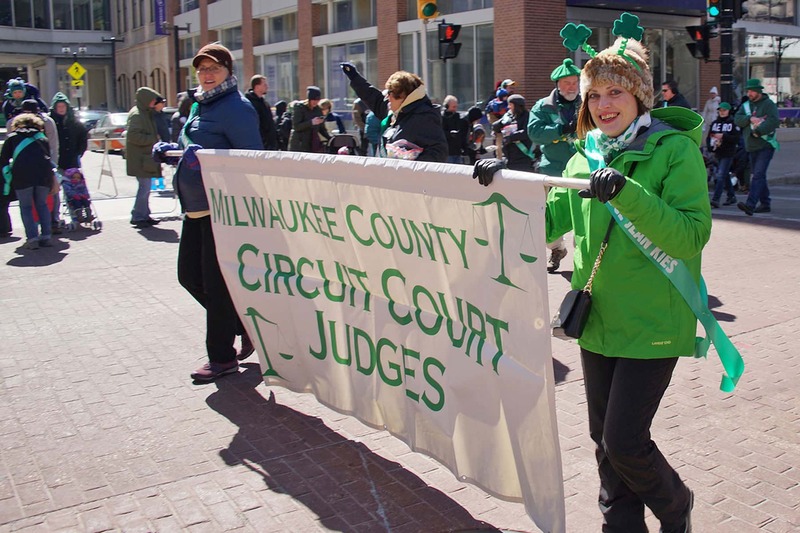 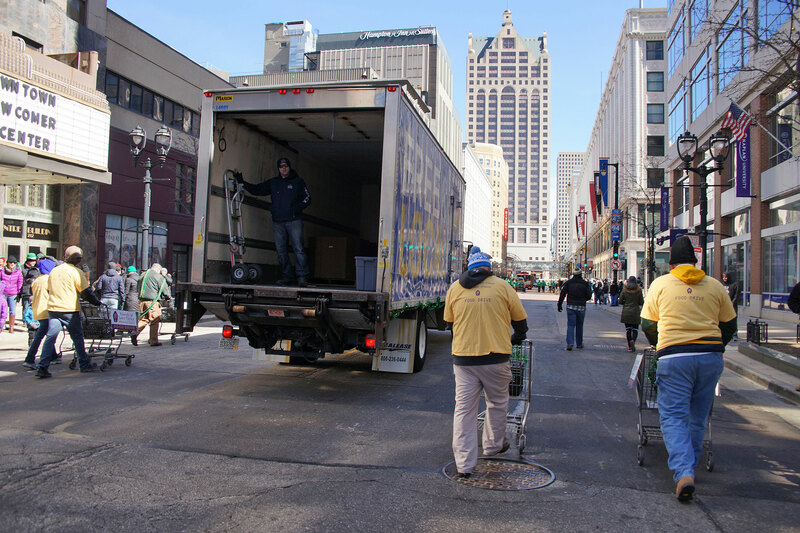 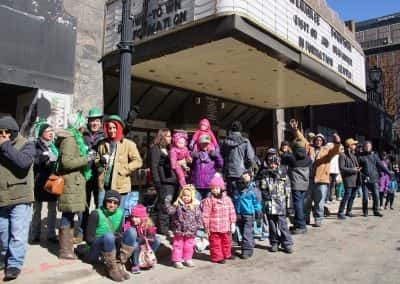 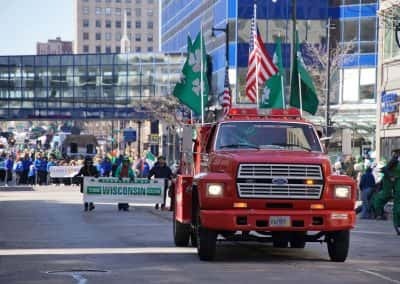 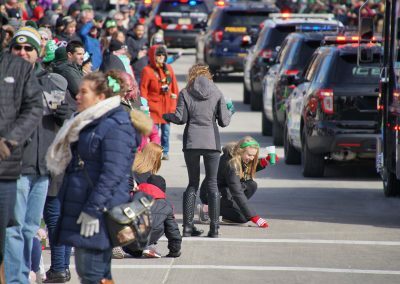 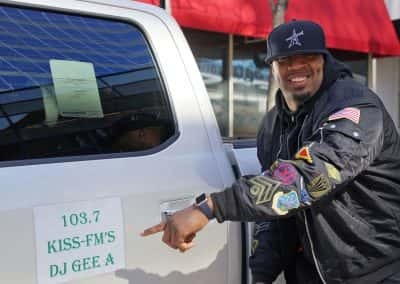 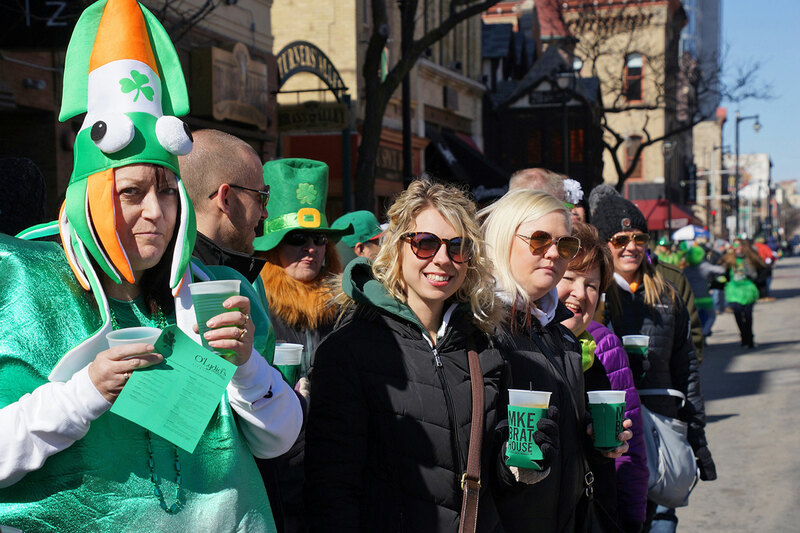 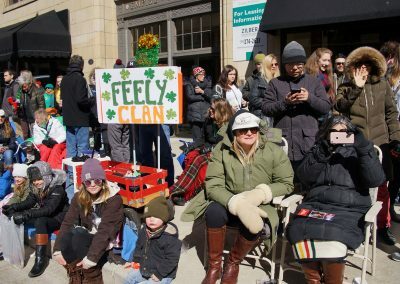 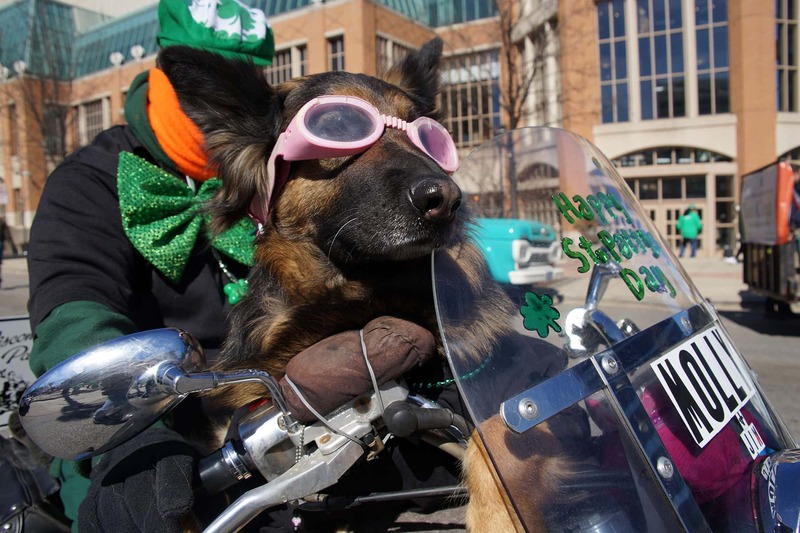 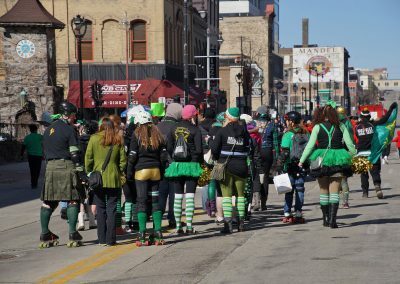 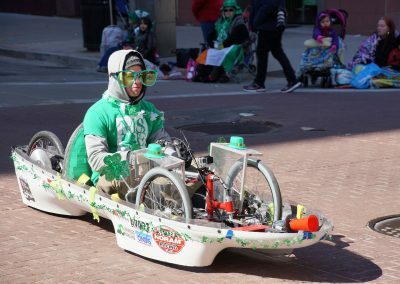 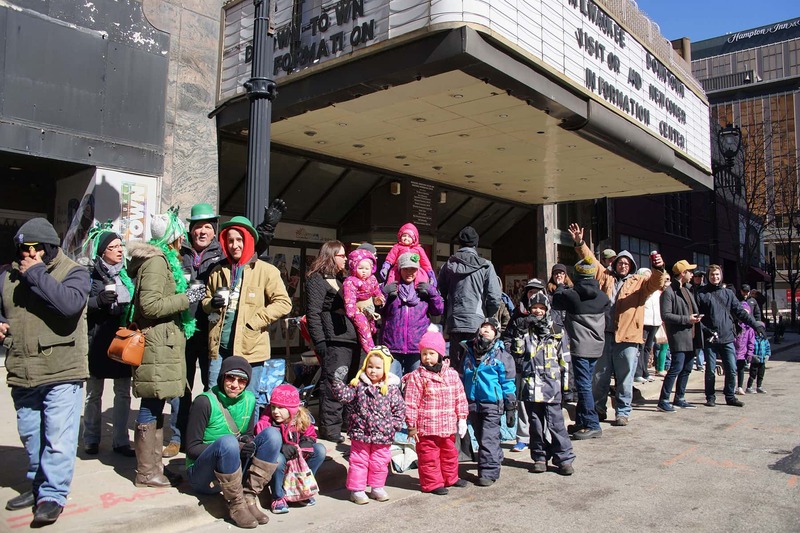 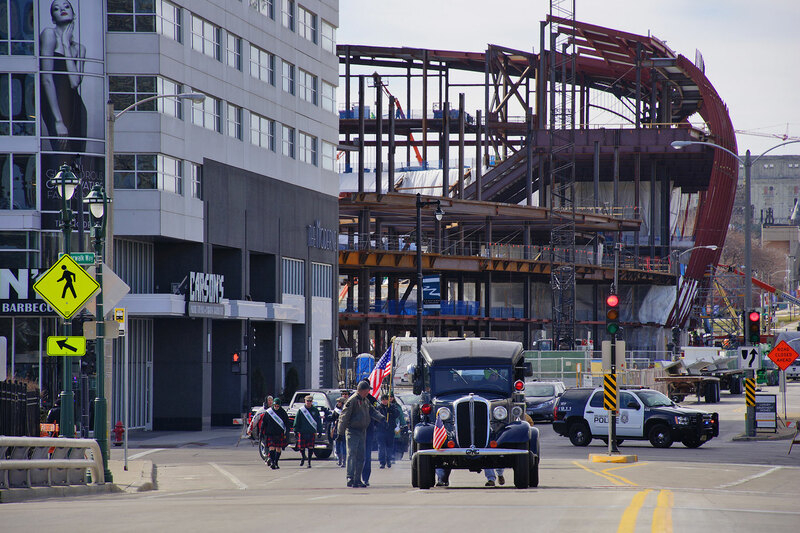 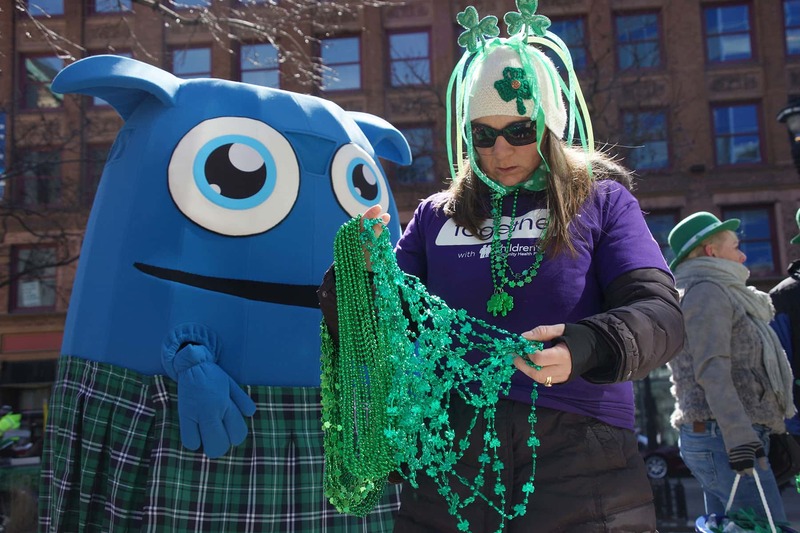 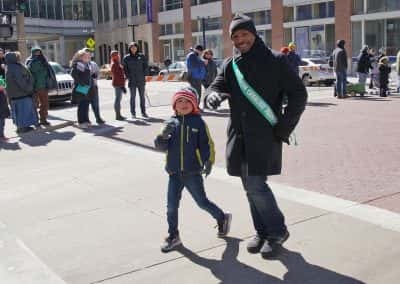 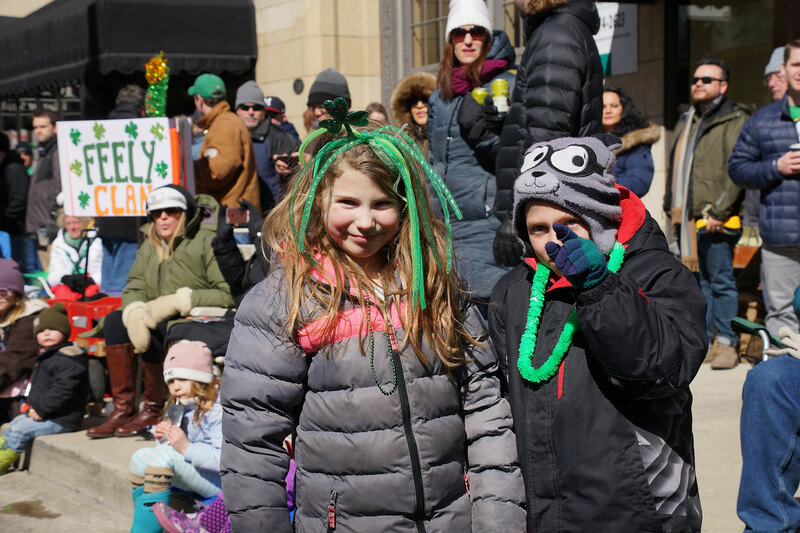 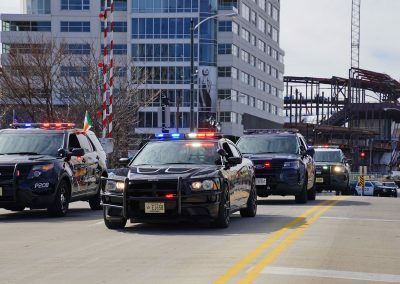 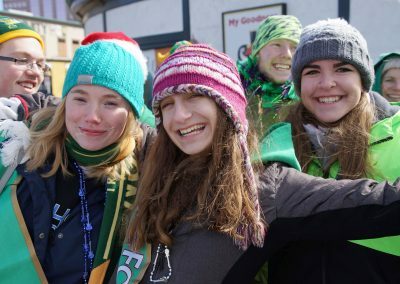 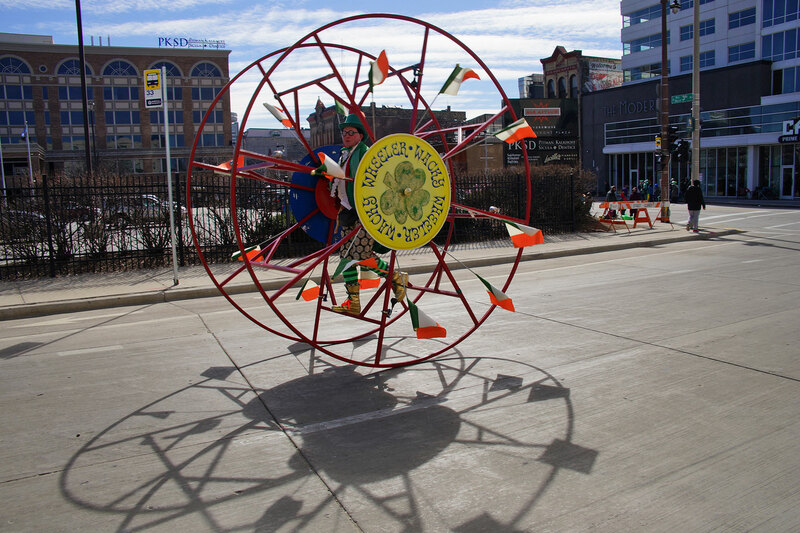 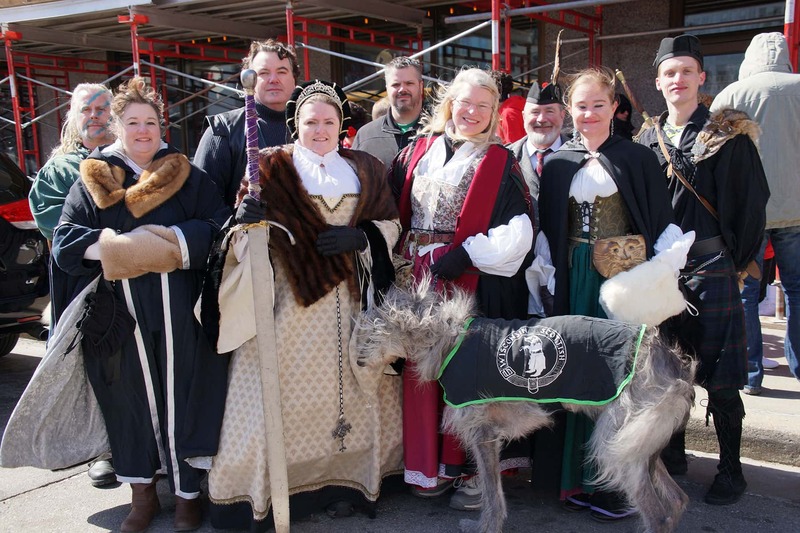 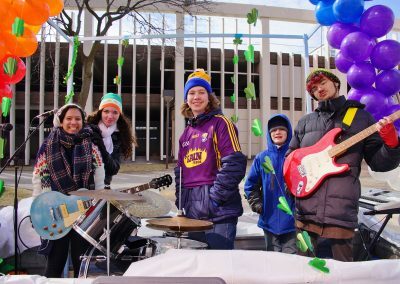 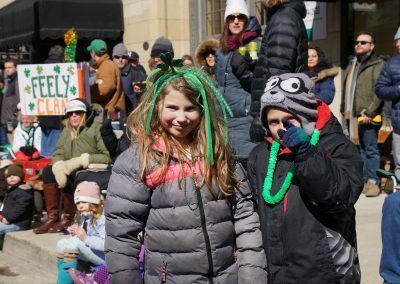 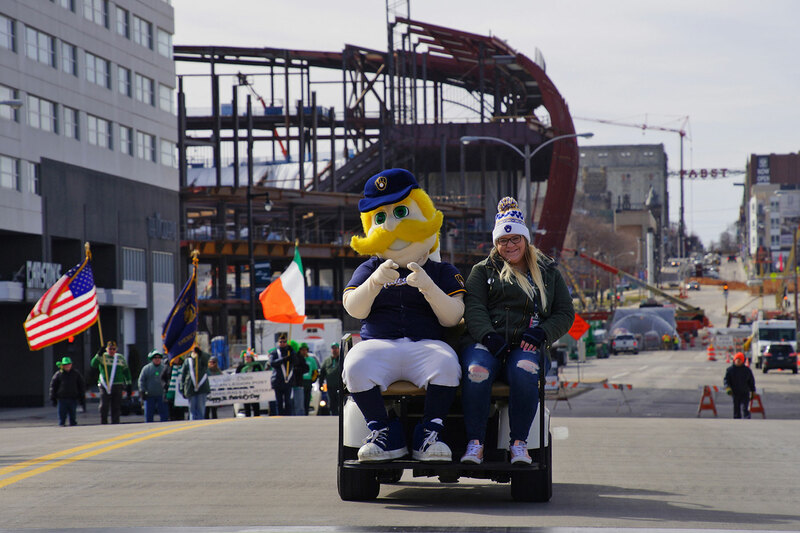 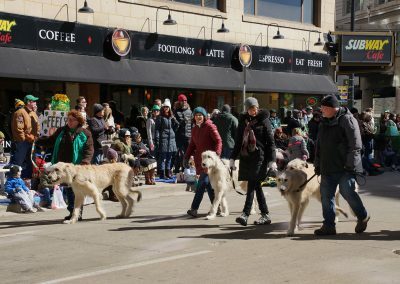 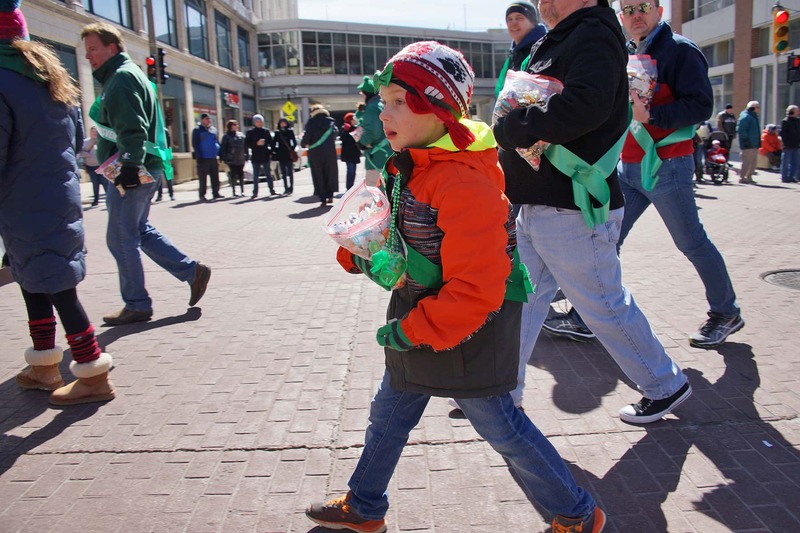 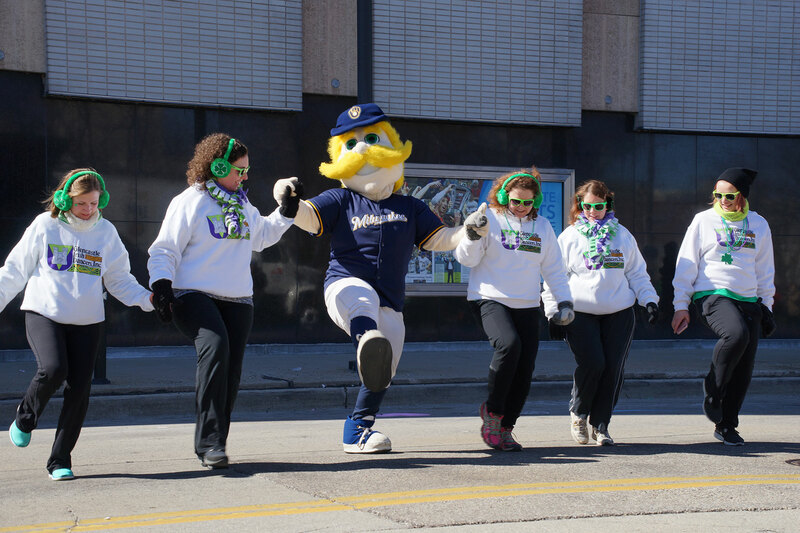 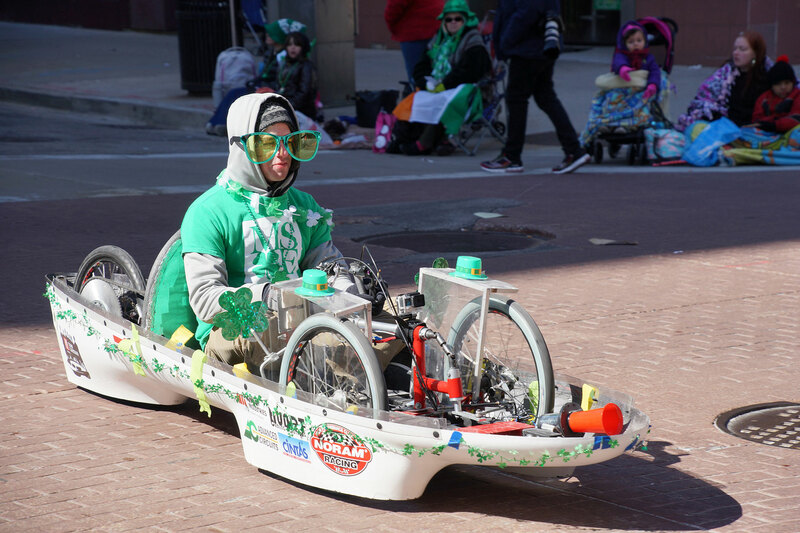 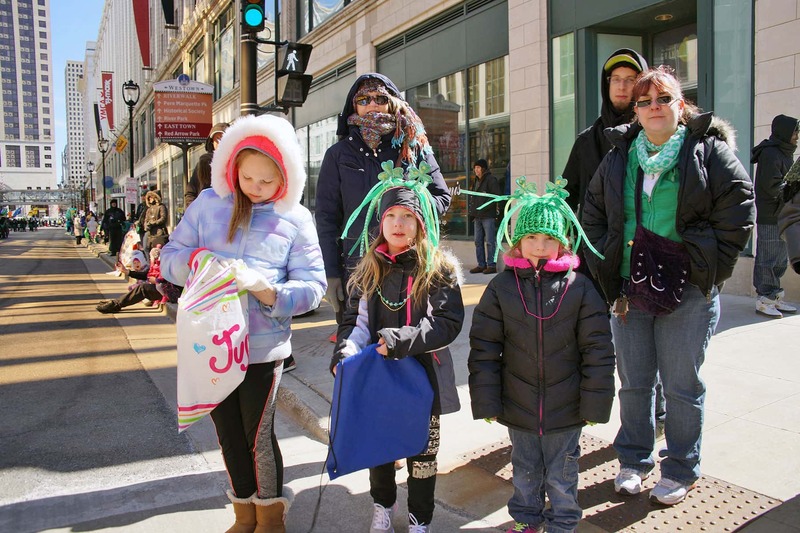 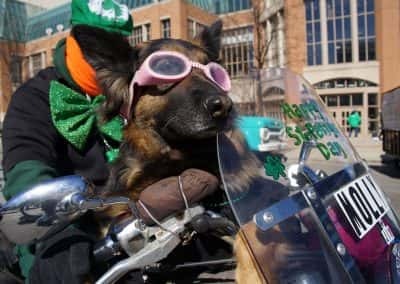 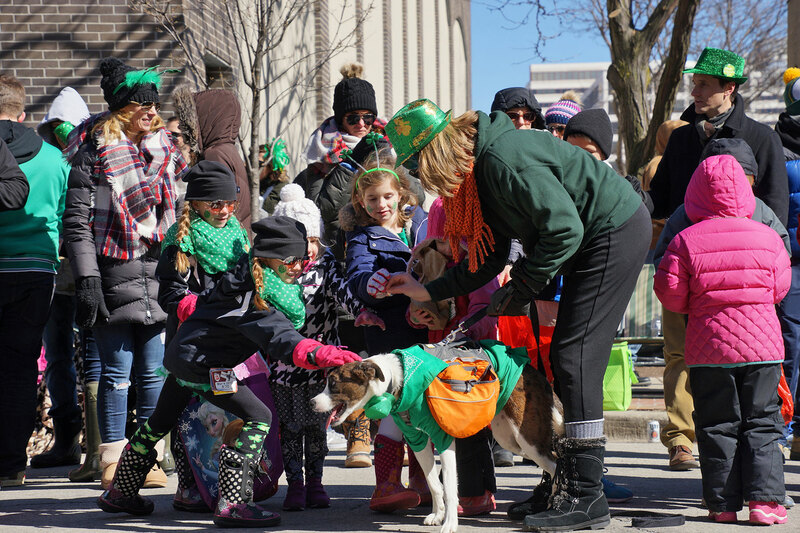 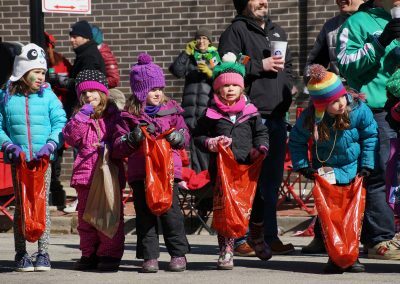 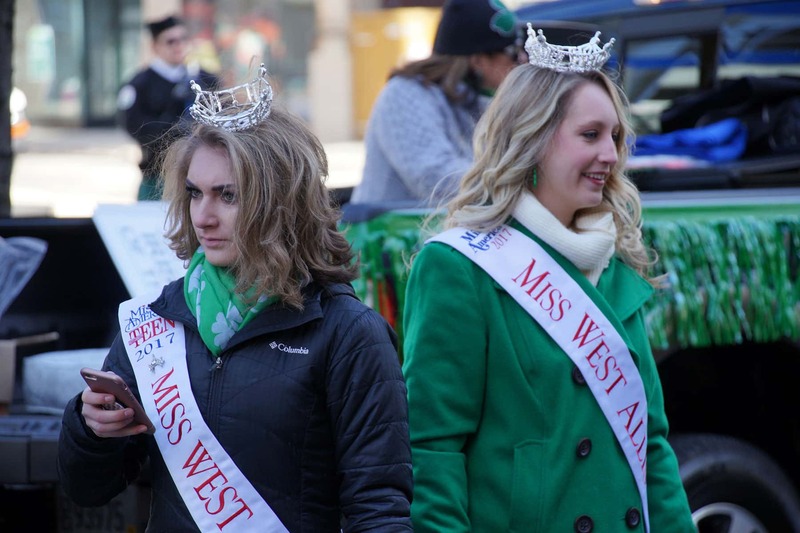 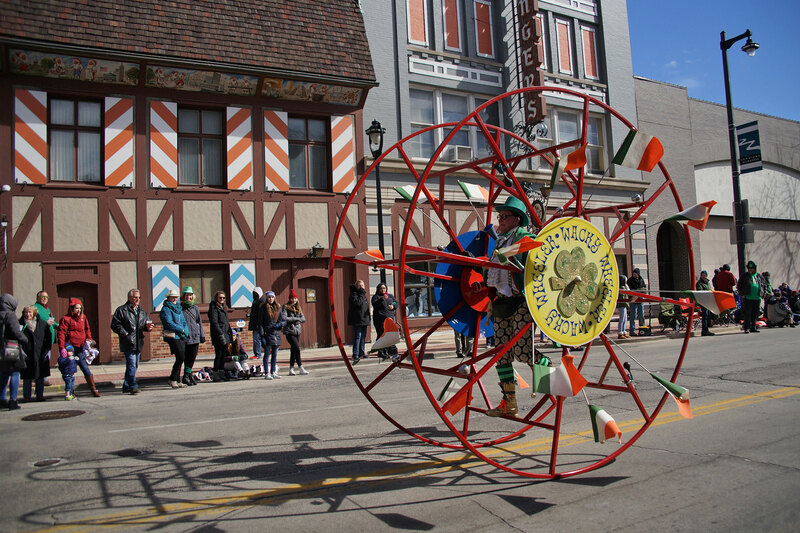 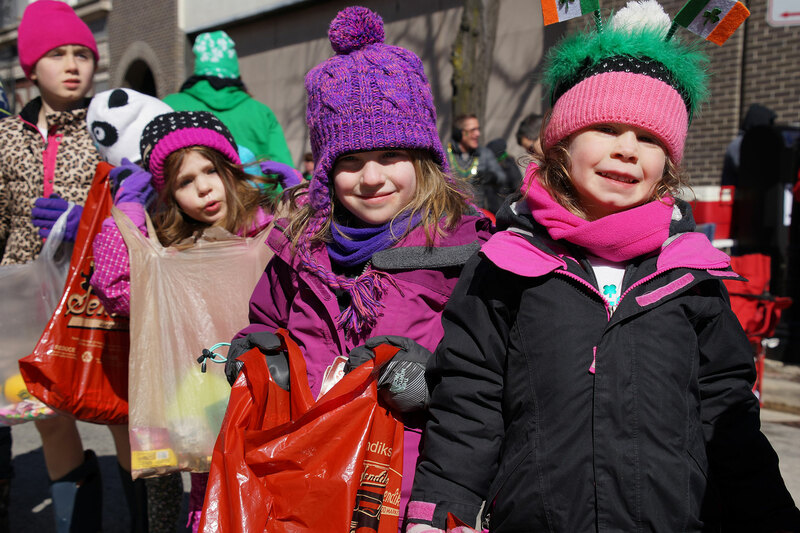 The Shamrock Club of Wisconsin’s 51st Annual St. Patrick’s Day Parade rolled through the frigid streets of Milwaukee’s Westown on March 11. 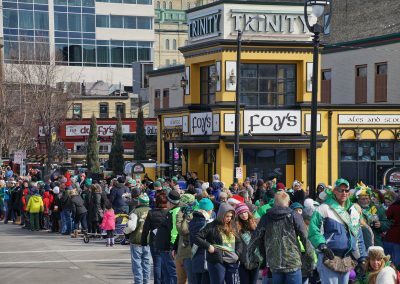 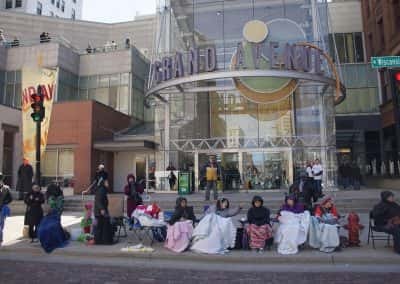 Crowds of families and green beer enthusiasts braved the high winds and unseasonal temperatures that started at 14° before gaining ten more. 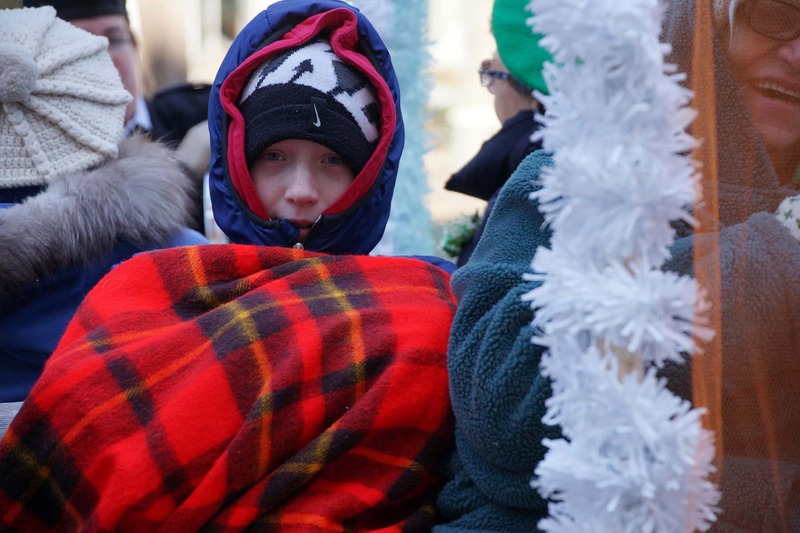 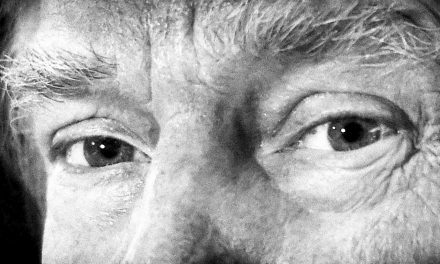 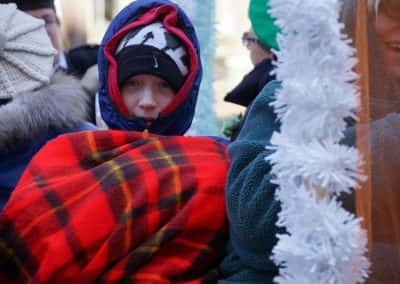 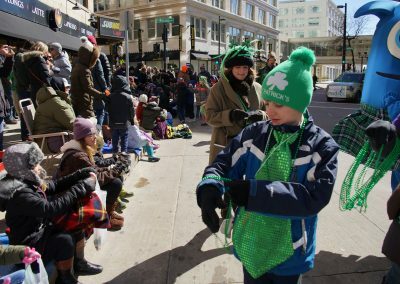 The weather was a vast change from the 60° of 2016’s parade. 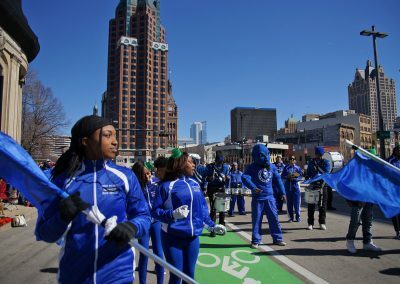 The 2017 route stretched a mile and a quarter. 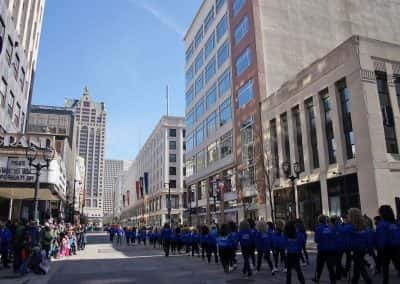 Beginning at 3rd Street and Wisconsin Avenue, it traveled north on Plankinton Avenue to Kilbourn Avenue, west to Old World Third Street, north to Juneau Avenue over the bridge, and then to Water Street where it ended at Highland Avenue. 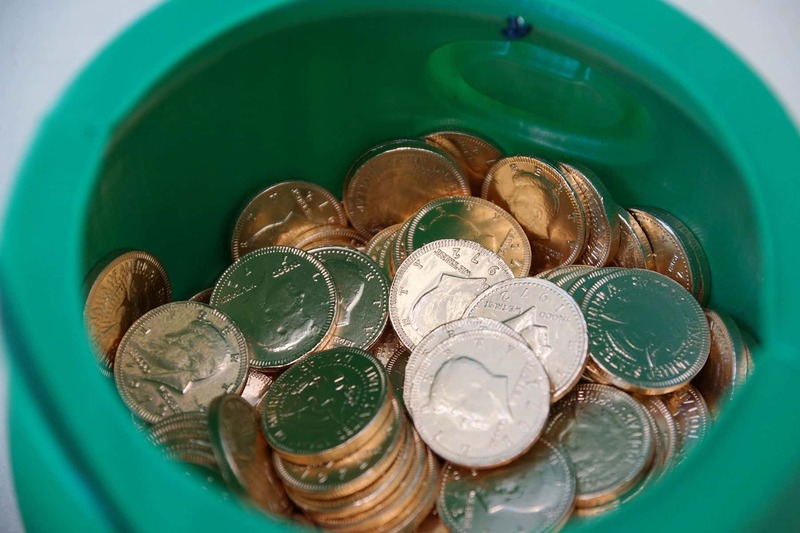 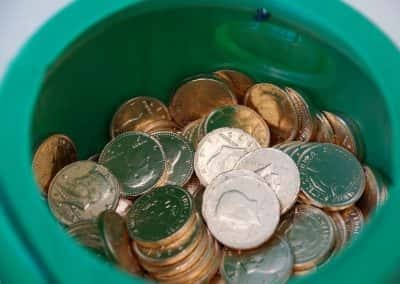 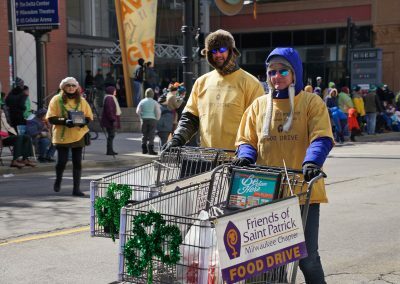 Supporting its charity efforts for the community, the Friends of Saint Patrick partnered again this year with Hunger Task Force. 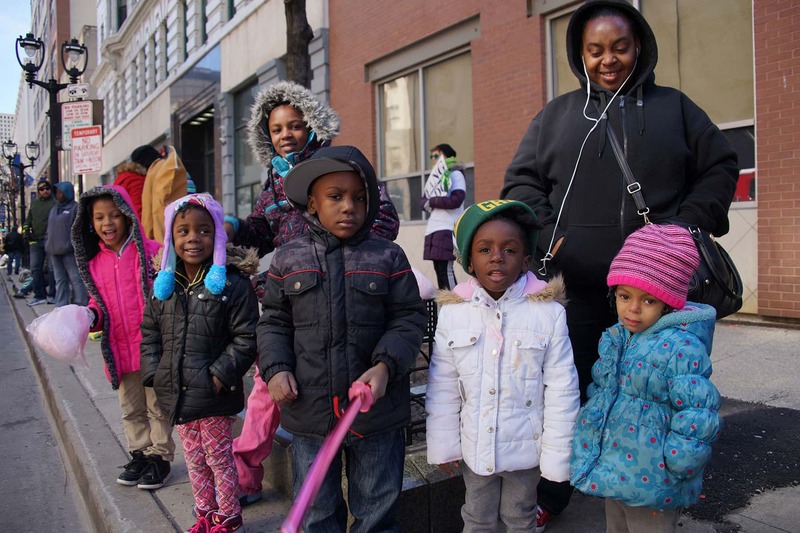 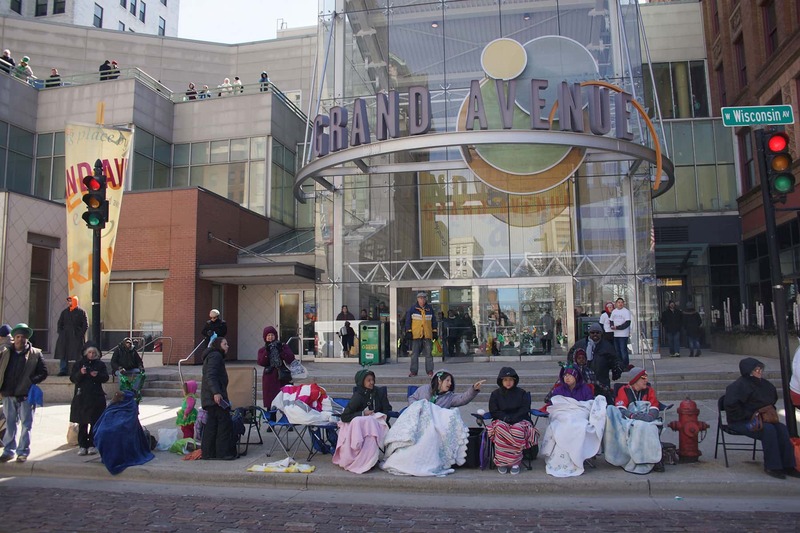 Four out of ten children in Milwaukee go to bed hungry every night. 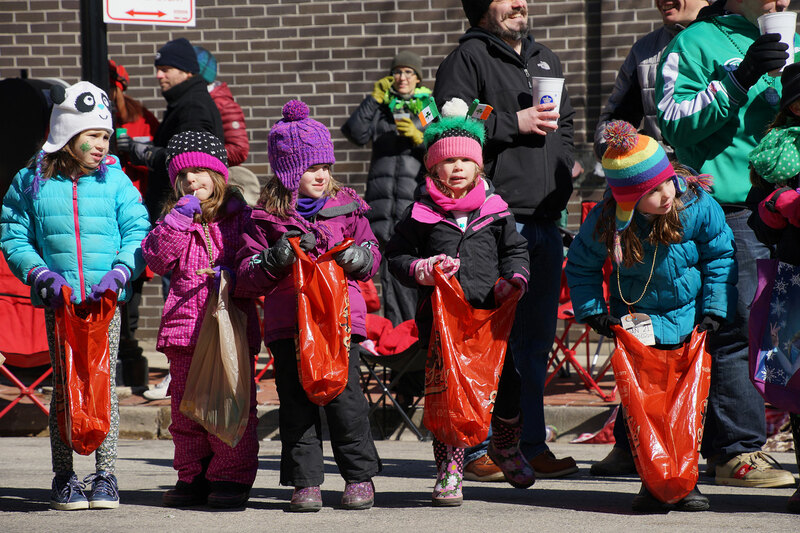 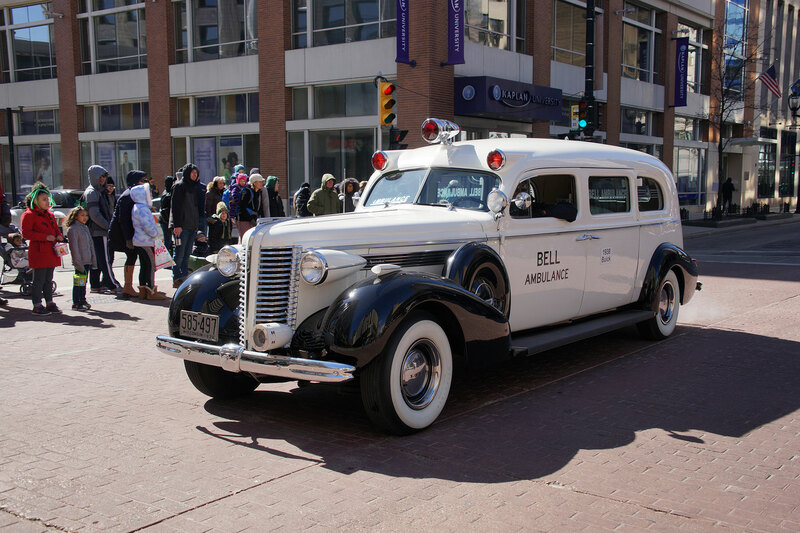 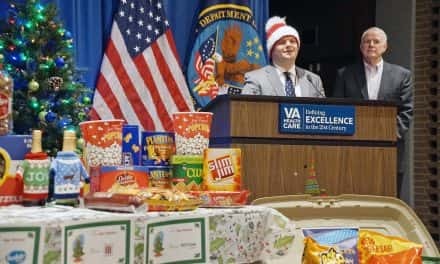 Spectators were encouraged to bring non-perishable food items to the parade event. Volunteers walked the route with grocery carts collecting donations and contributions. 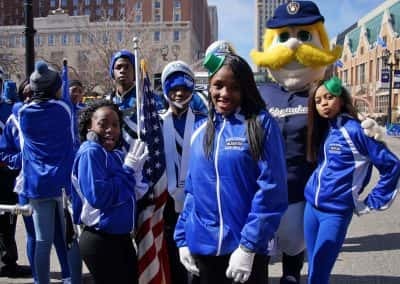 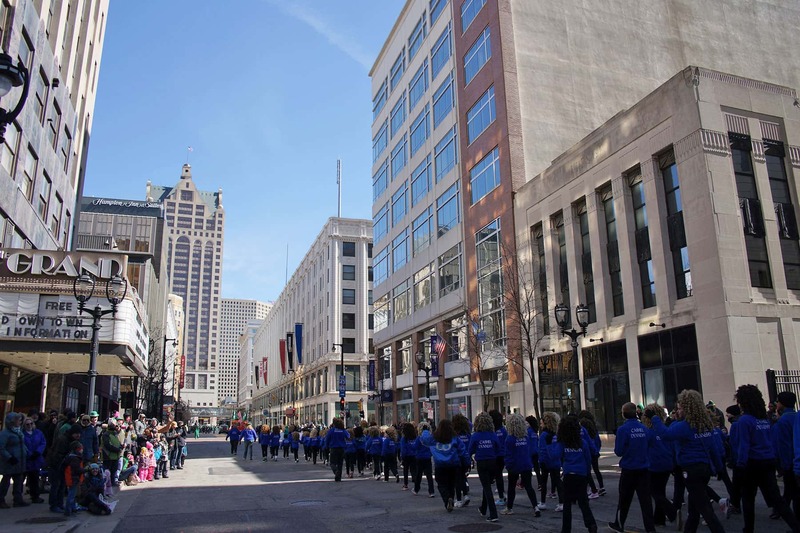 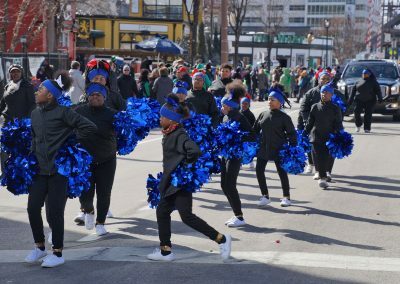 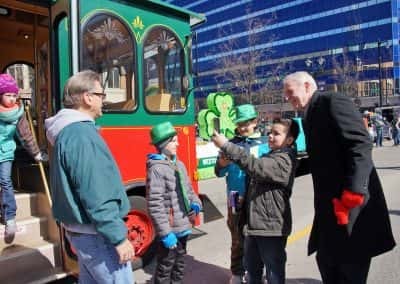 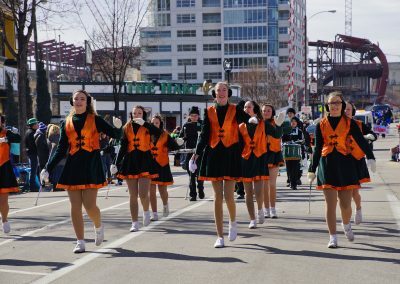 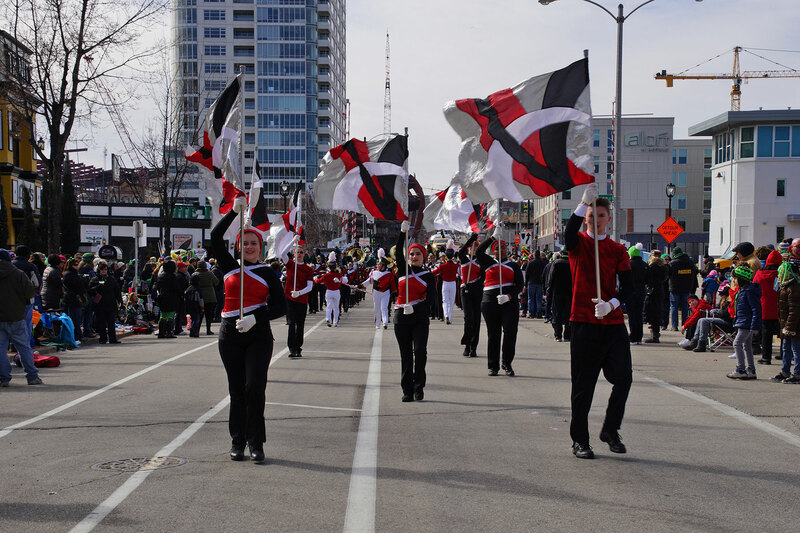 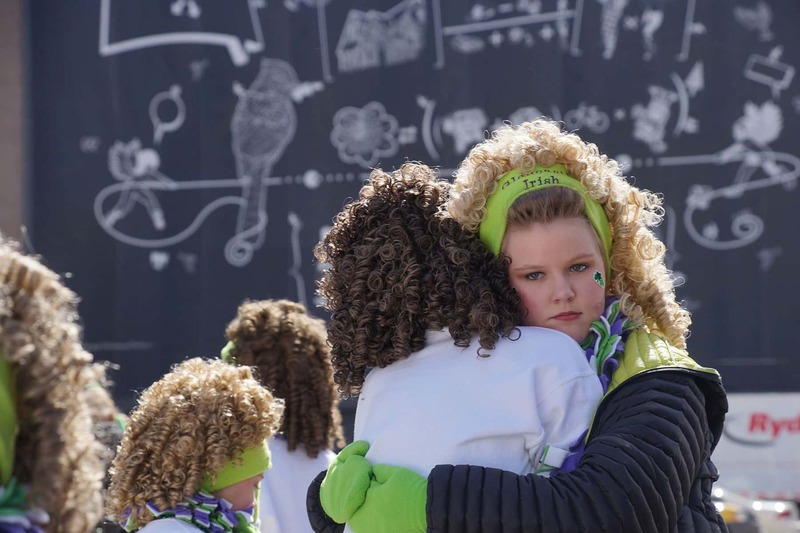 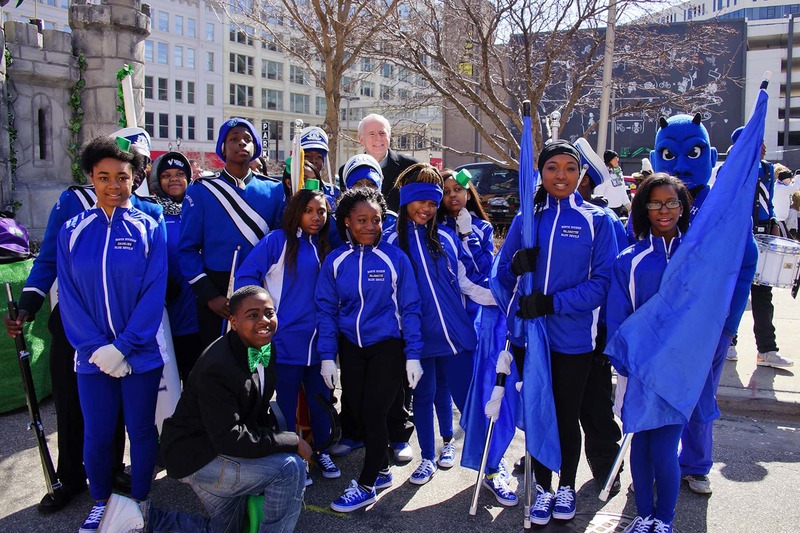 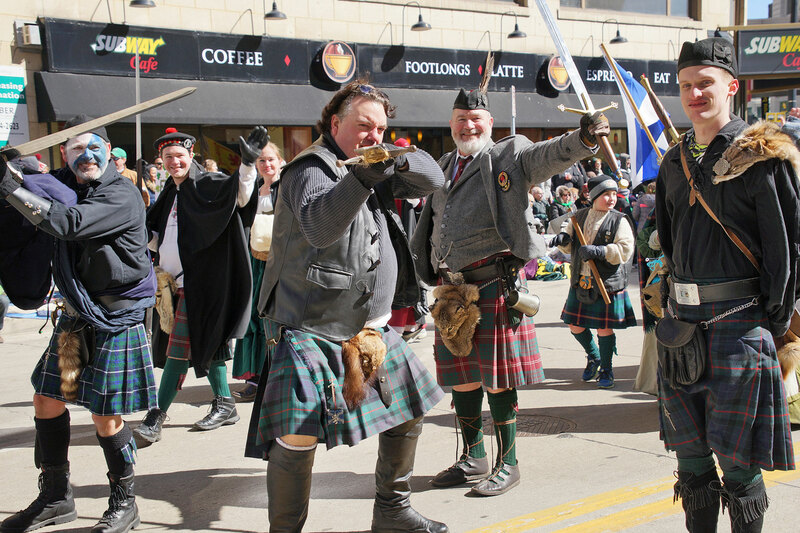 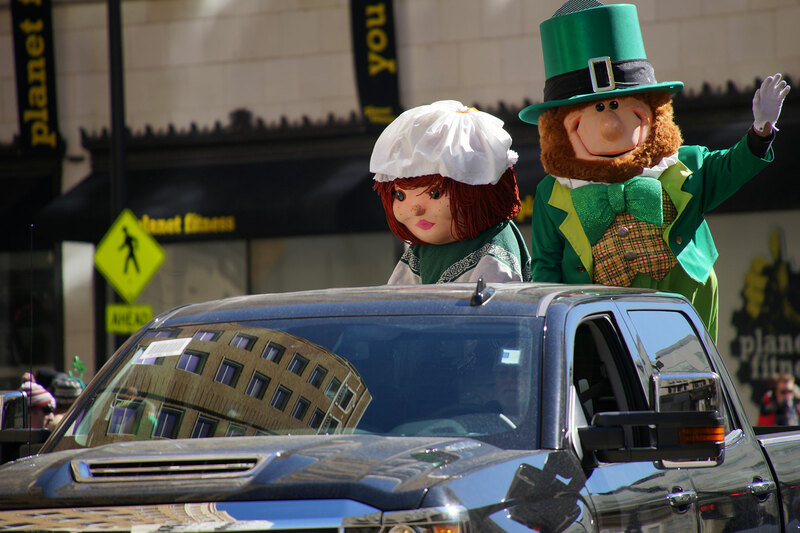 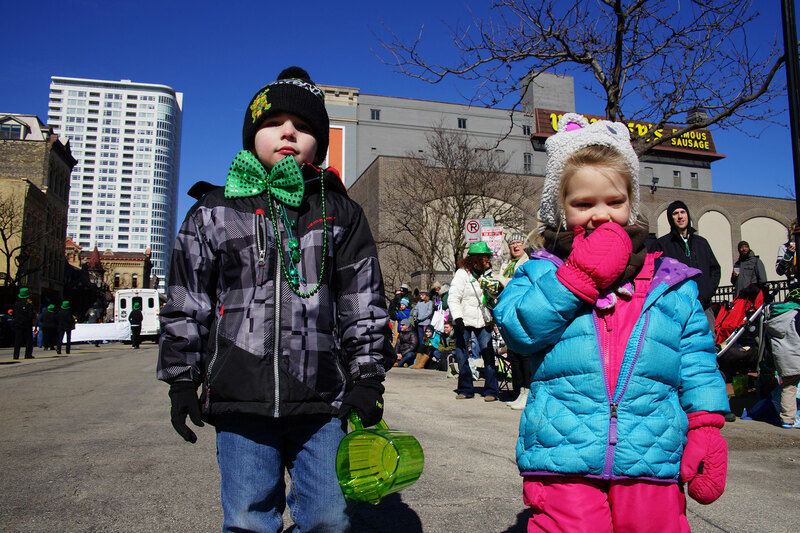 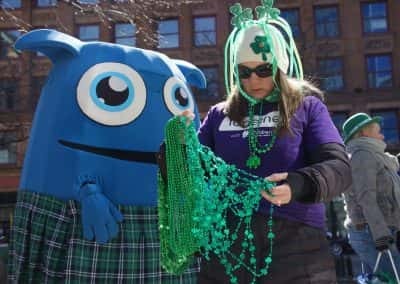 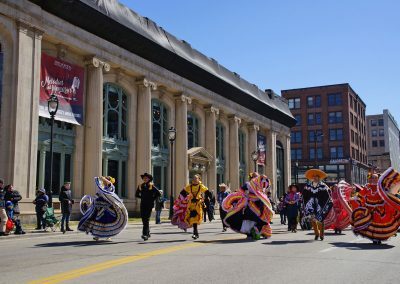 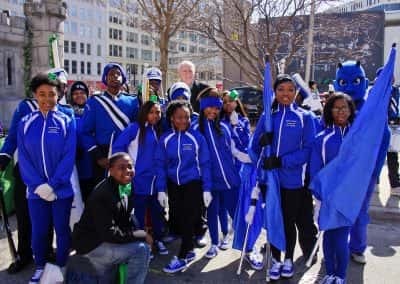 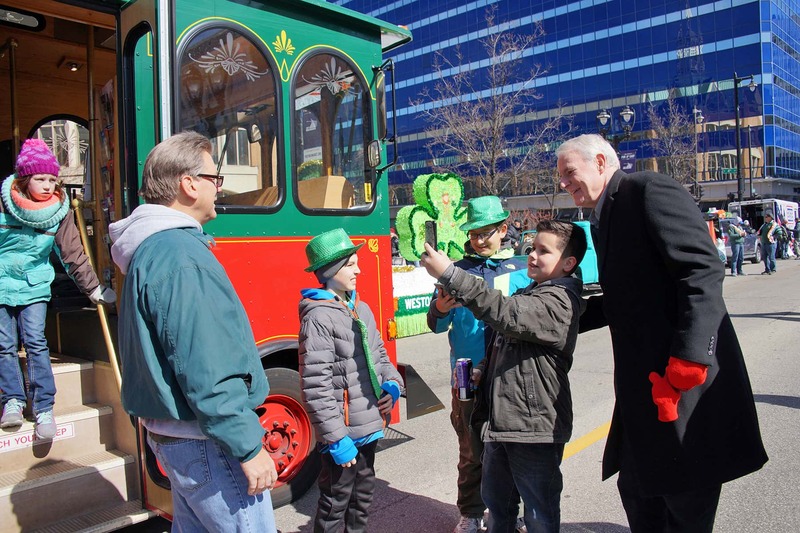 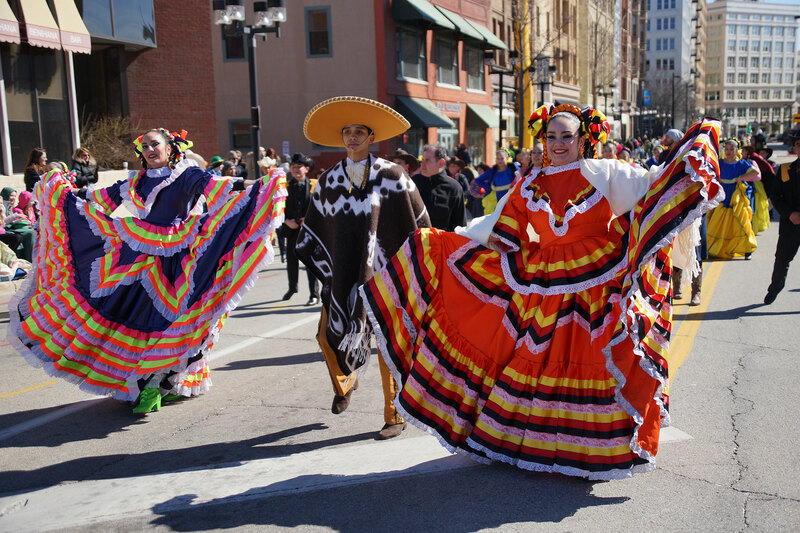 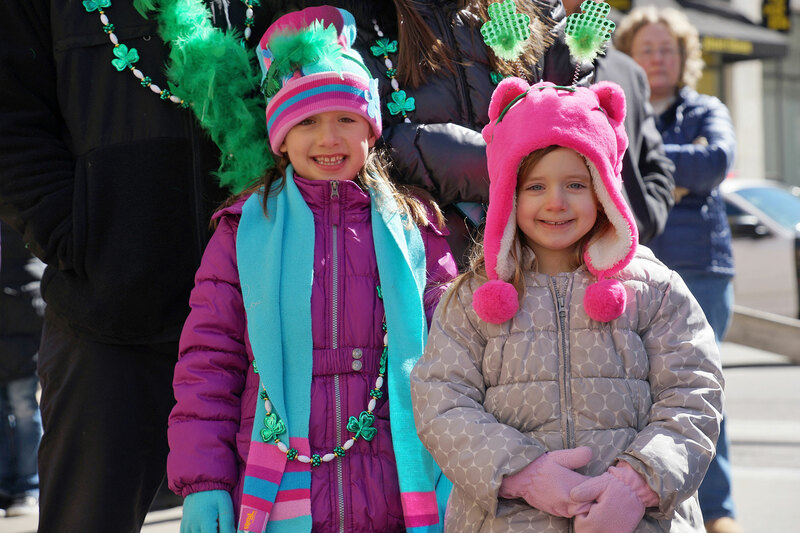 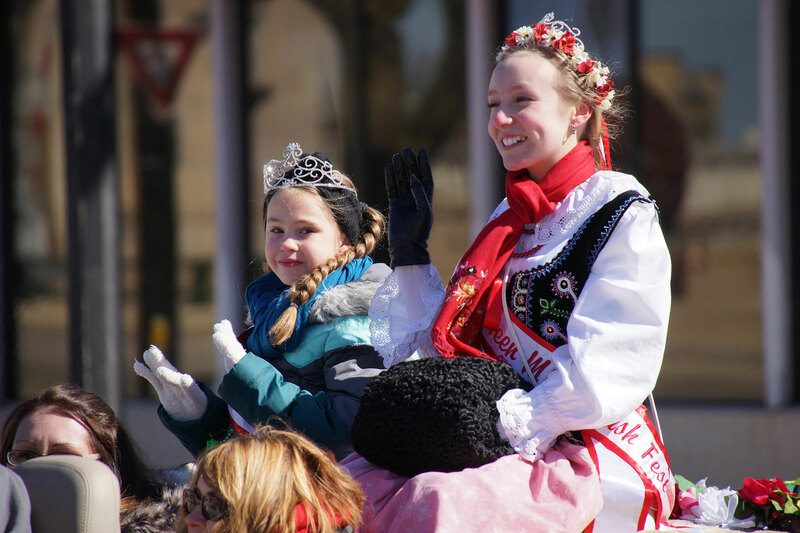 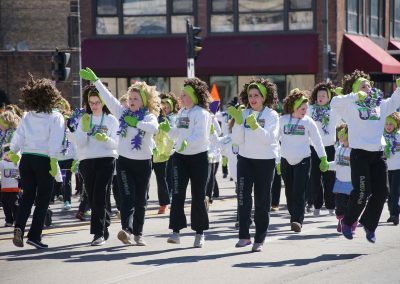 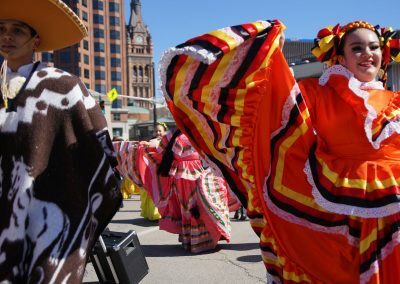 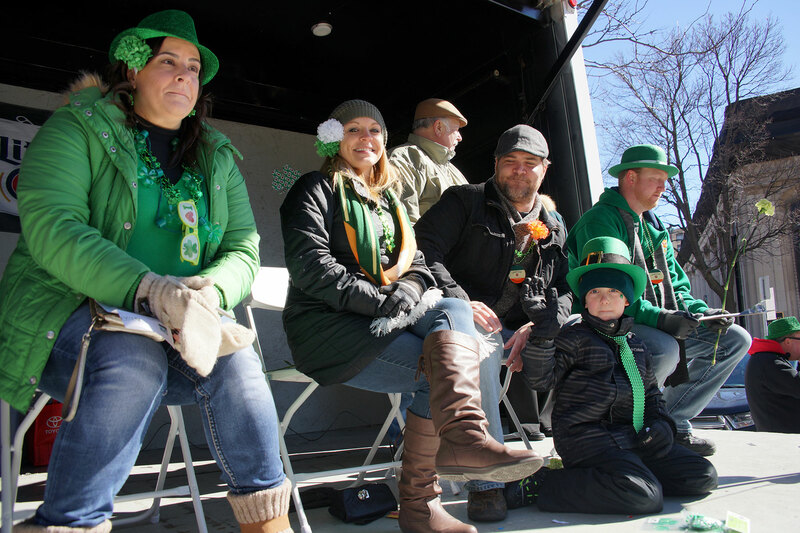 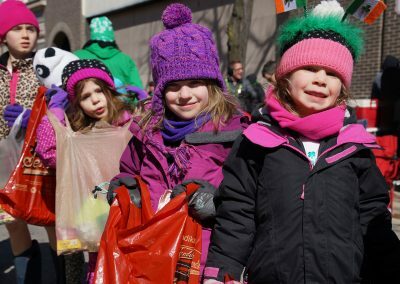 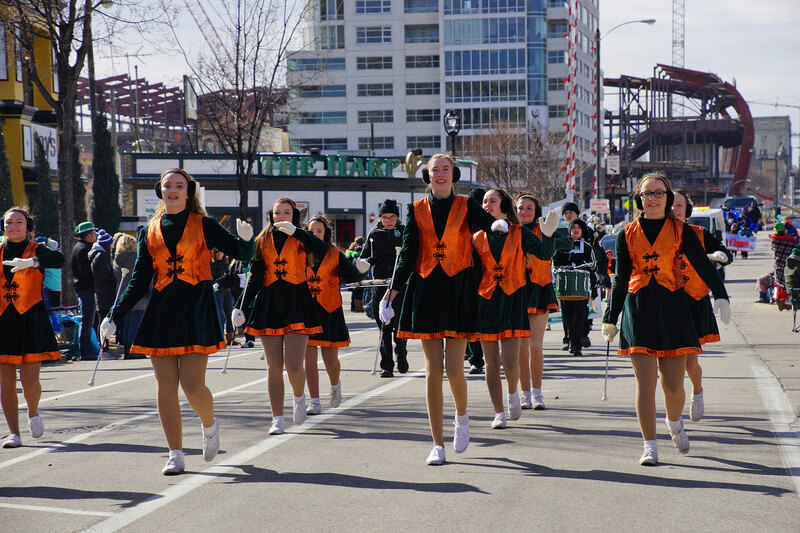 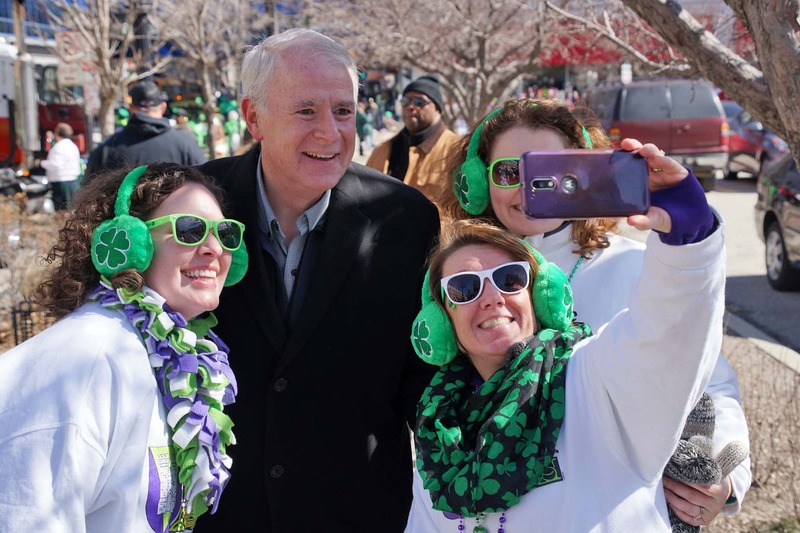 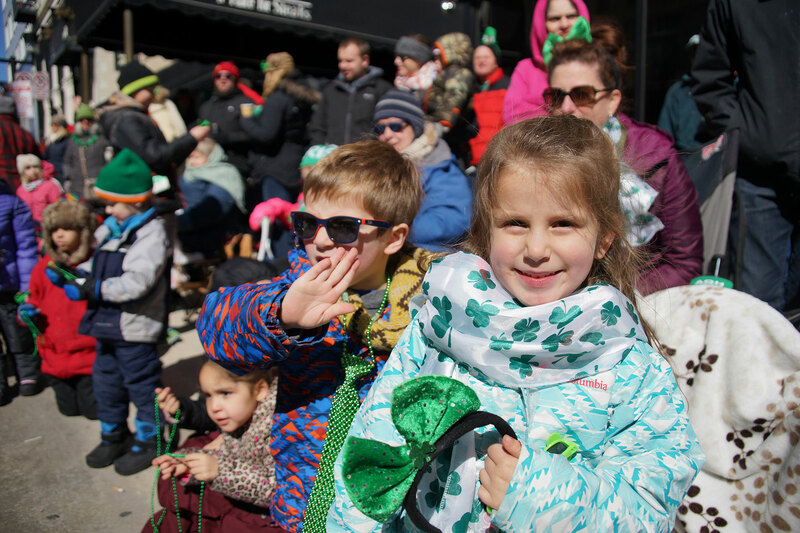 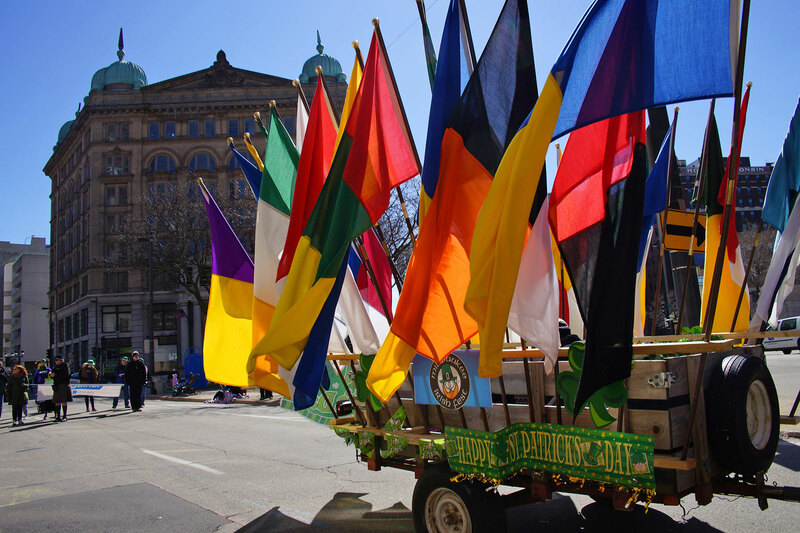 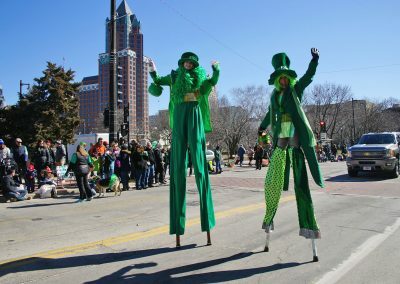 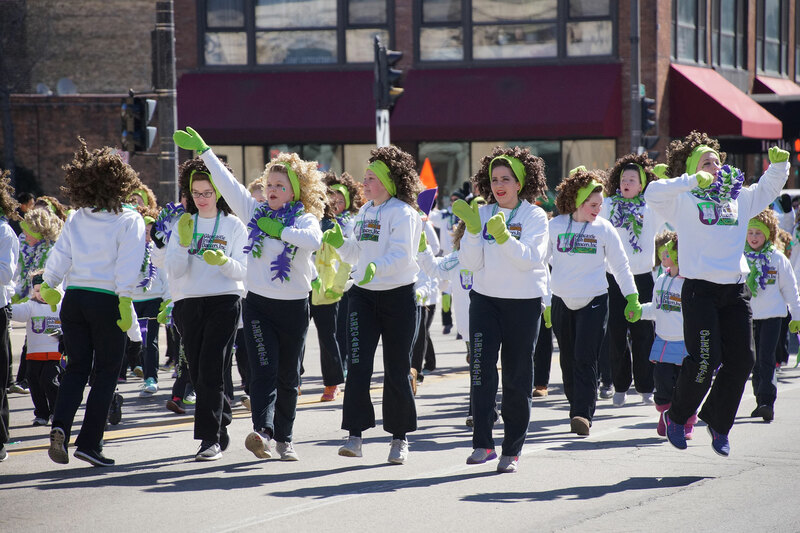 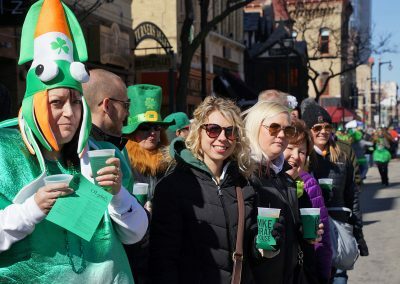 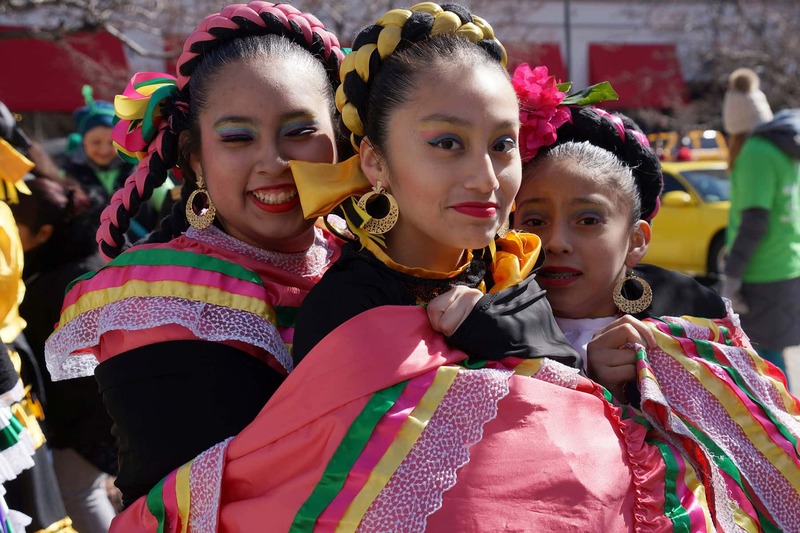 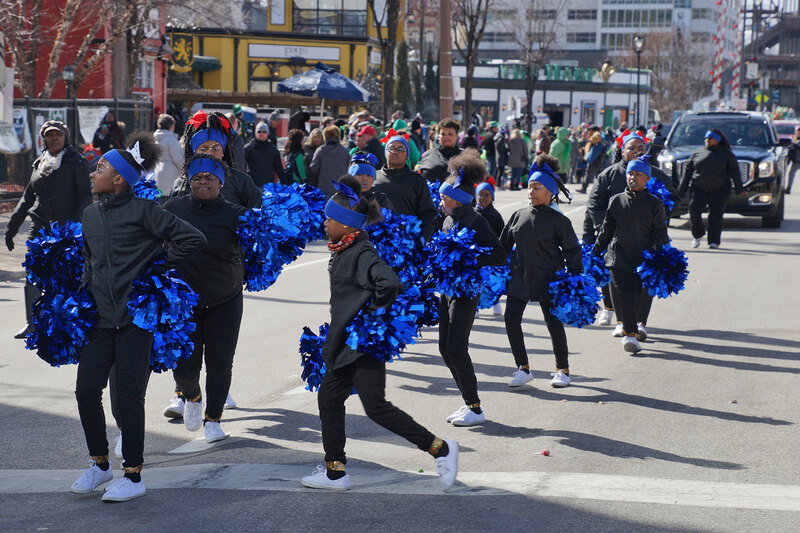 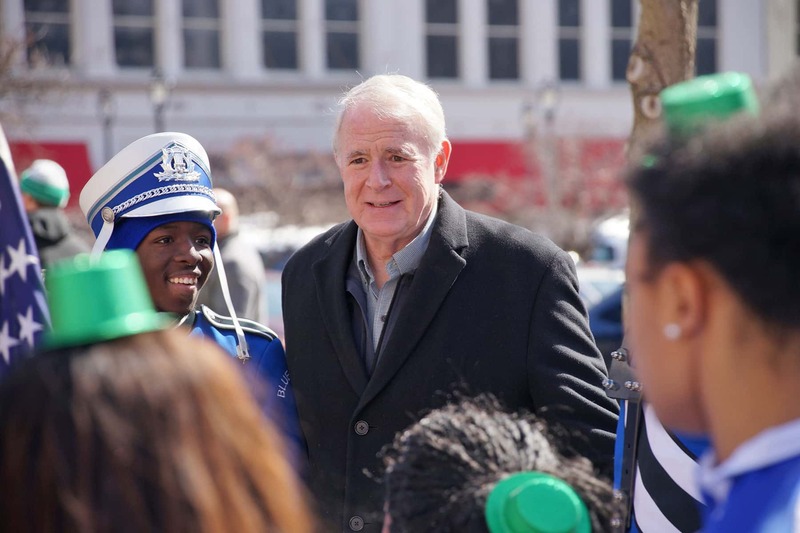 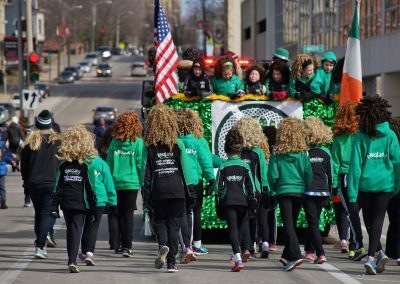 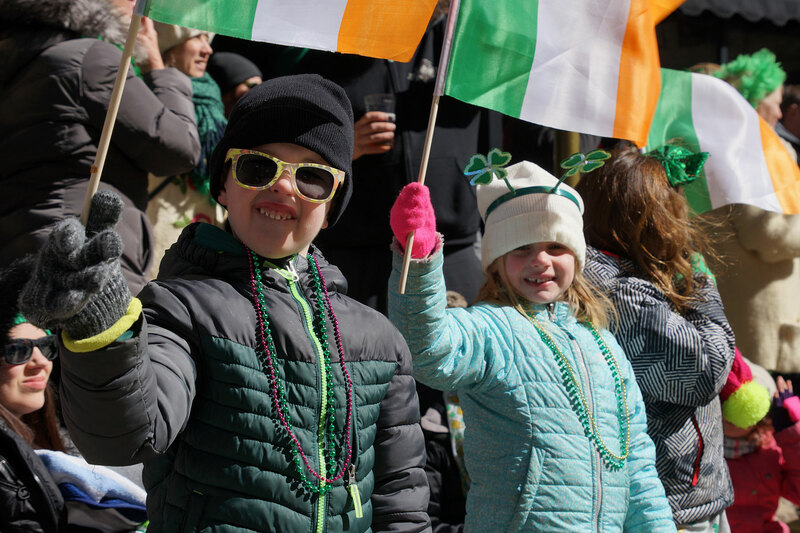 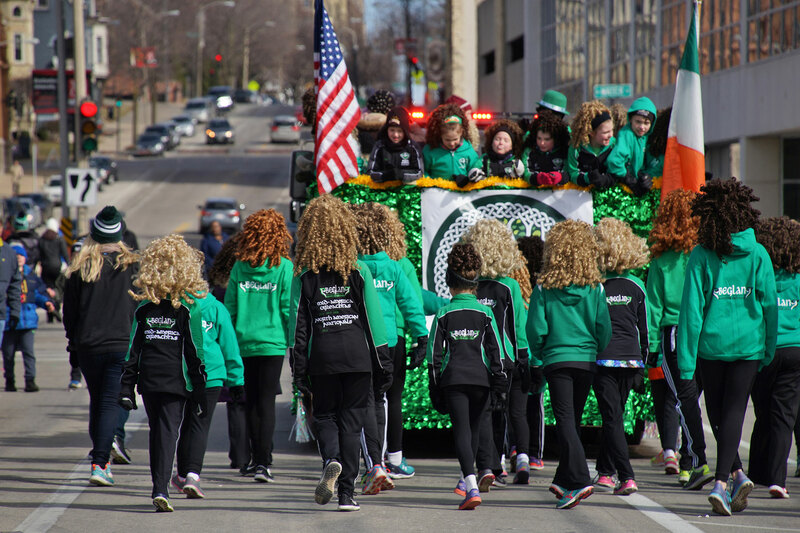 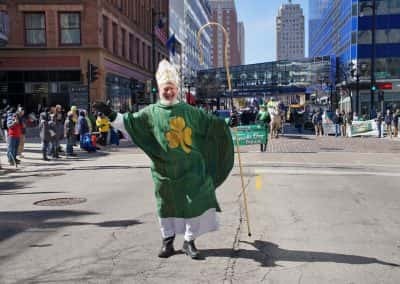 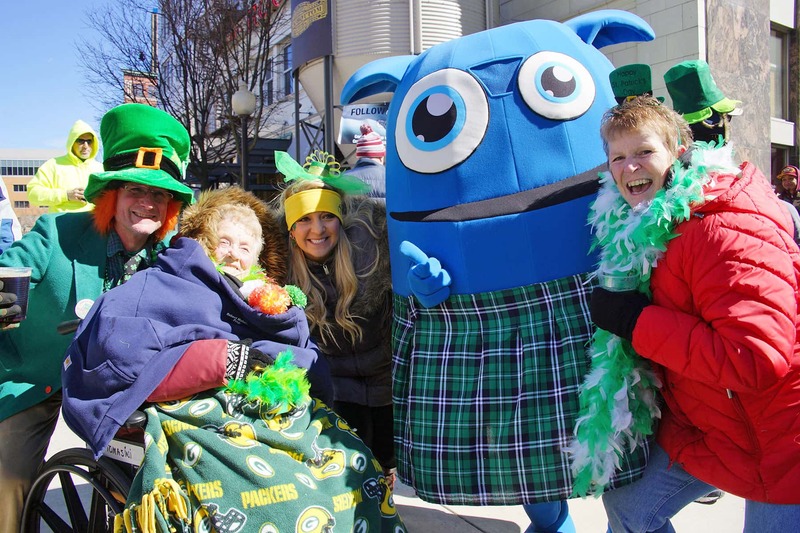 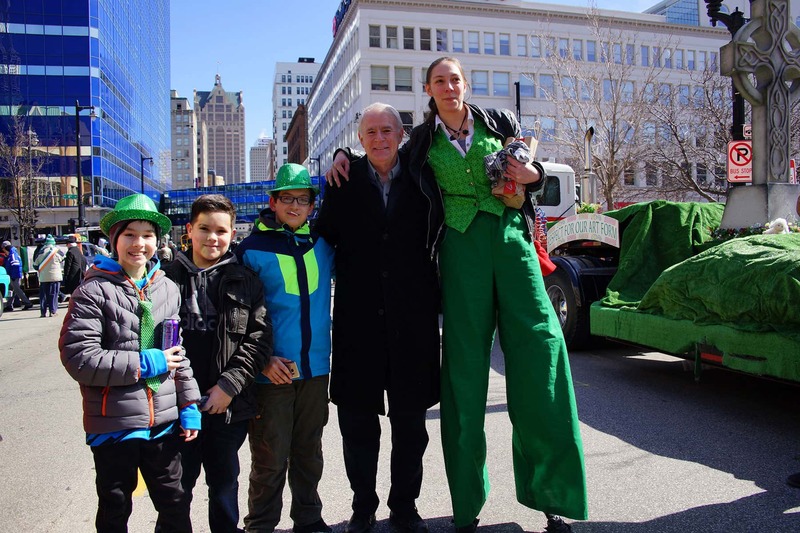 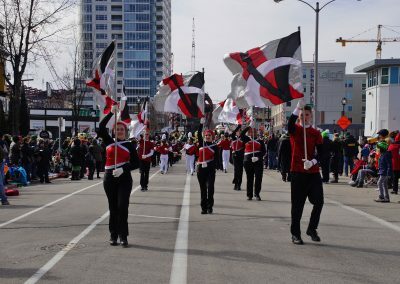 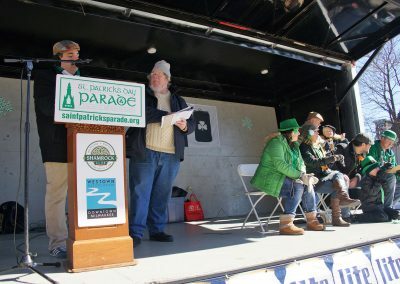 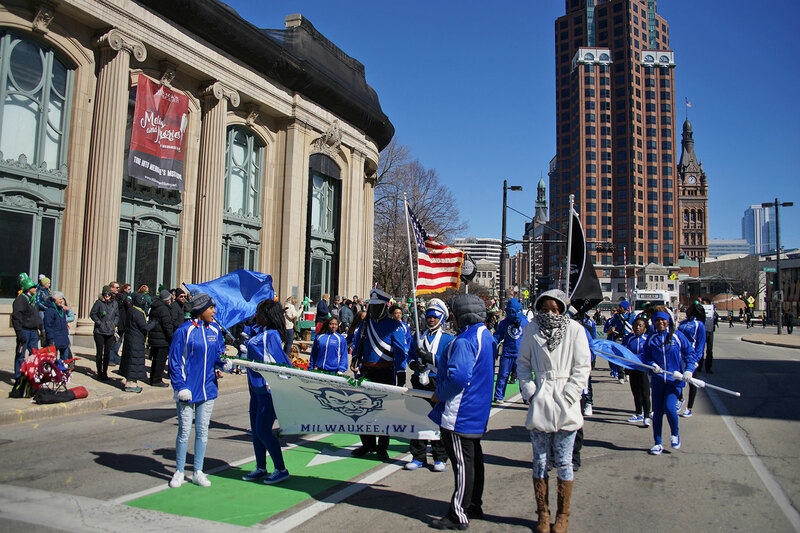 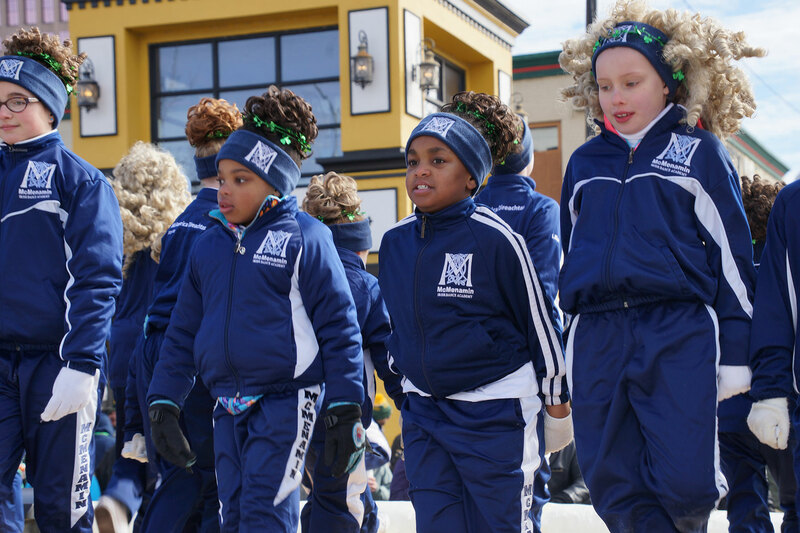 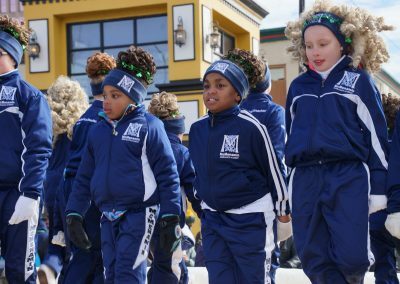 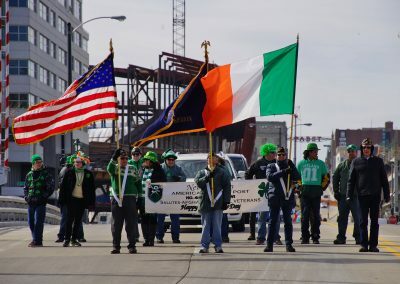 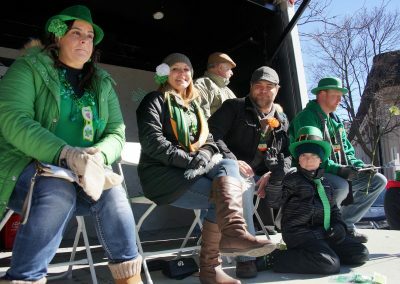 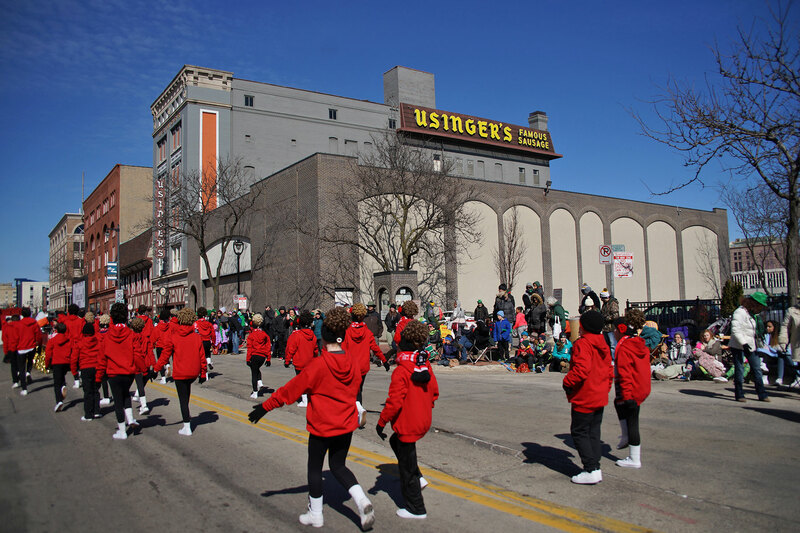 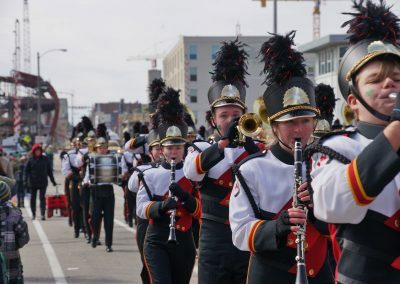 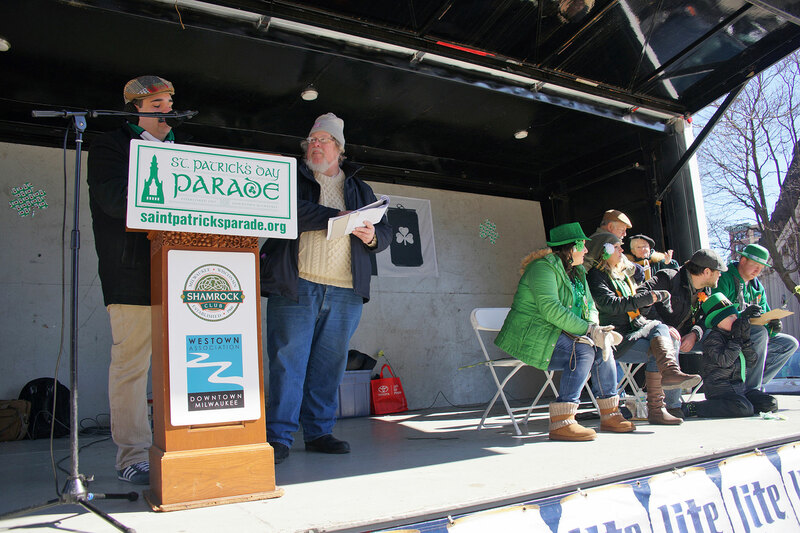 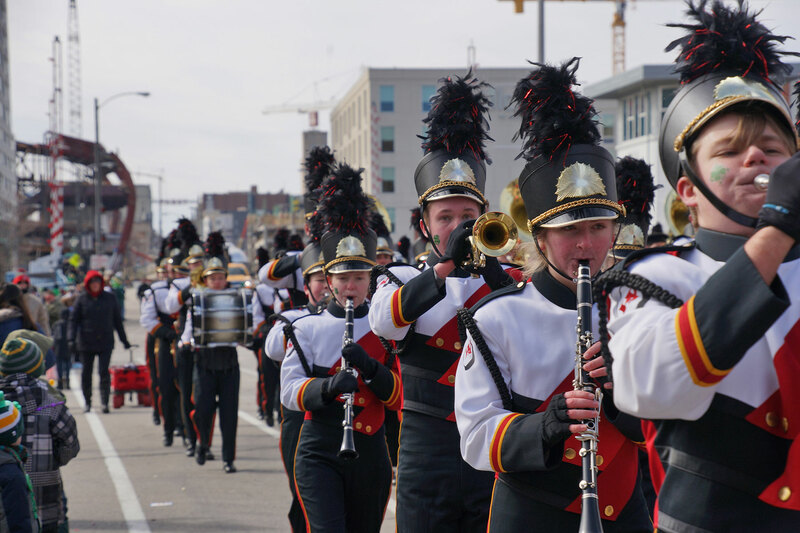 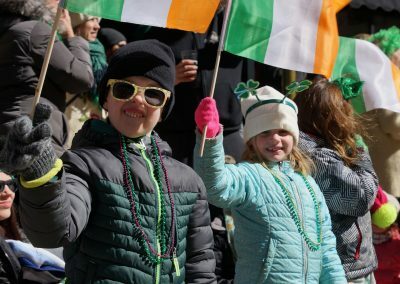 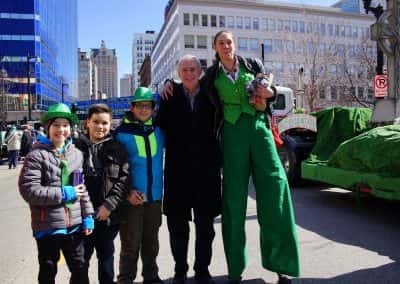 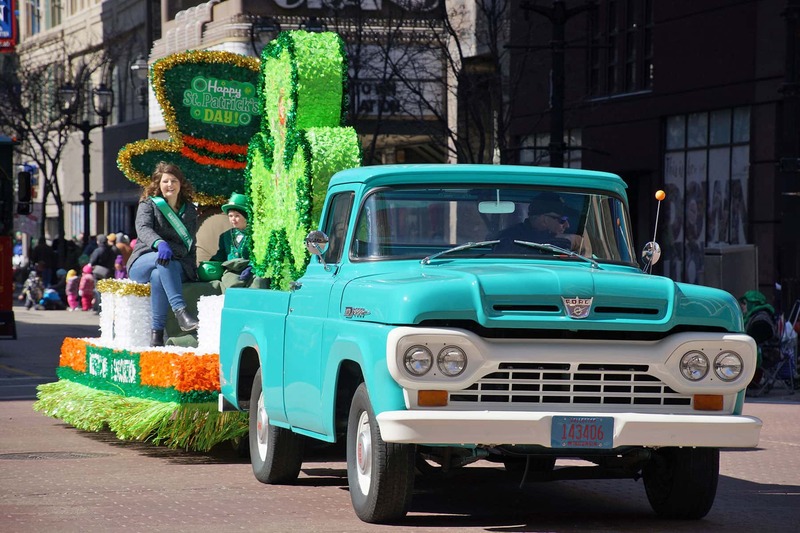 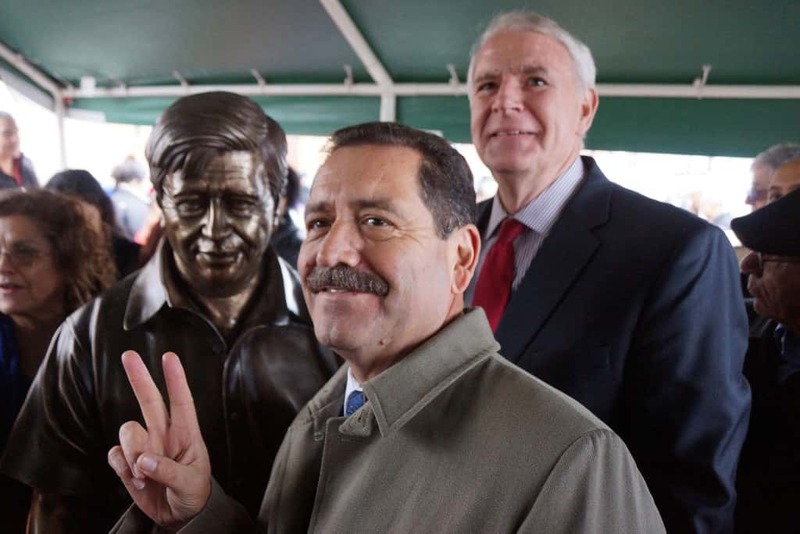 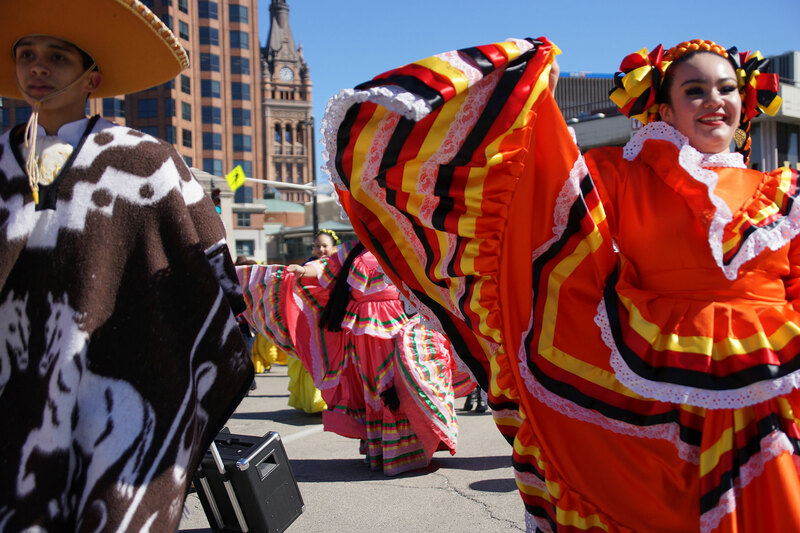 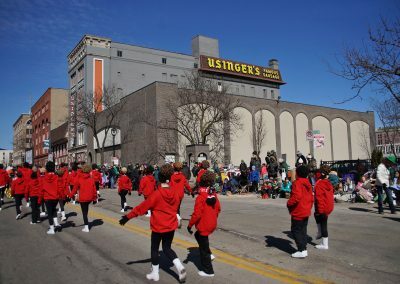 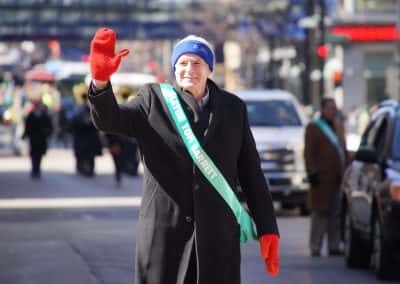 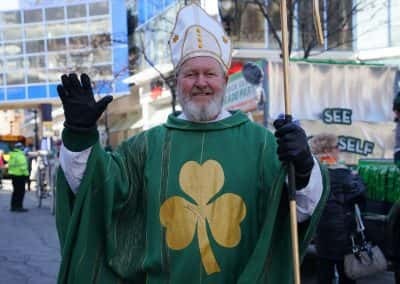 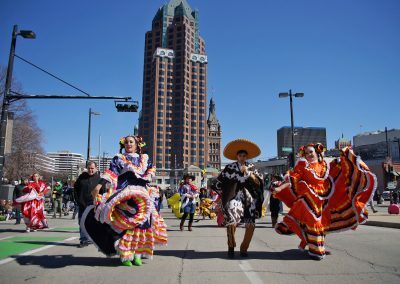 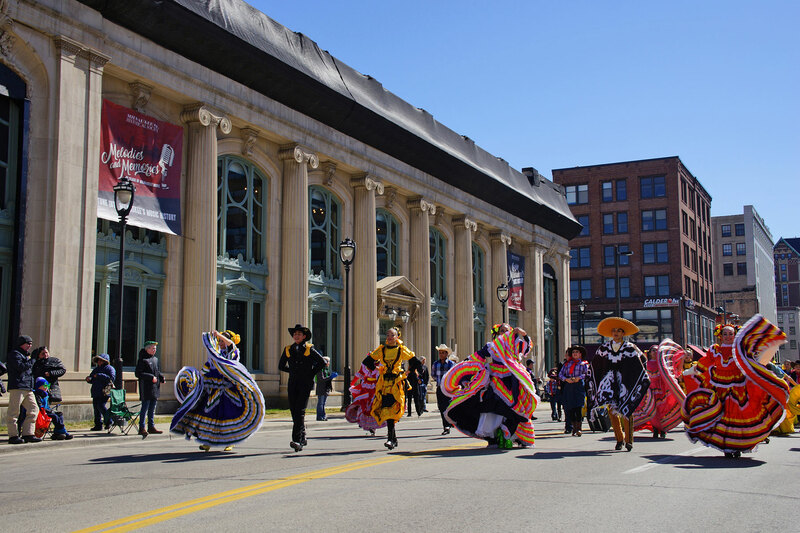 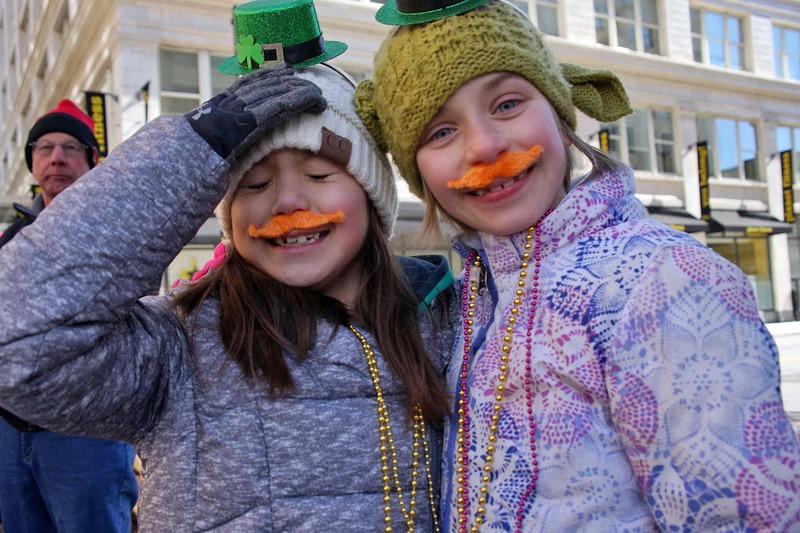 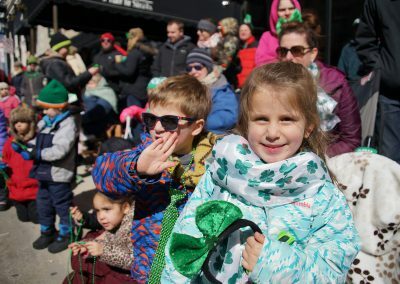 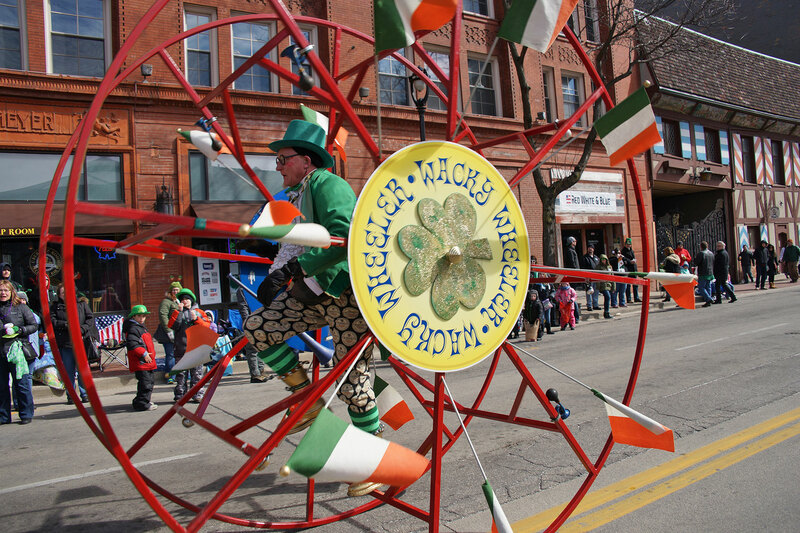 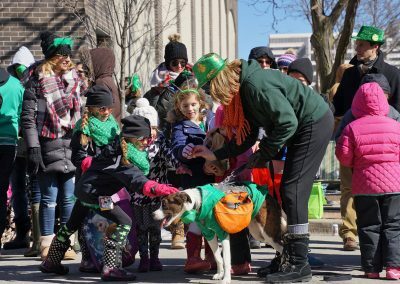 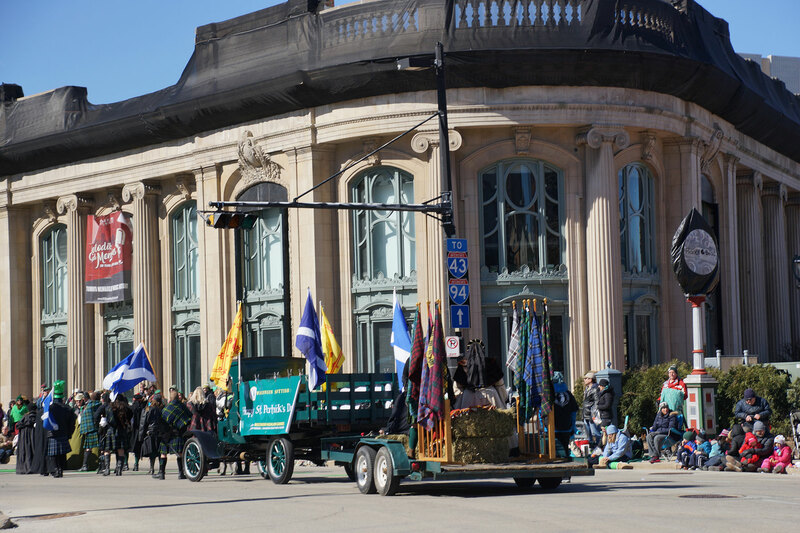 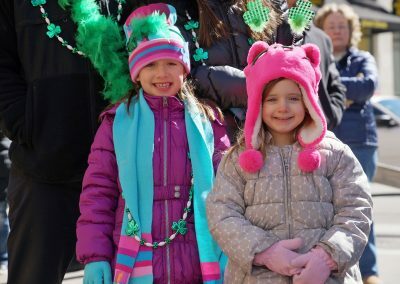 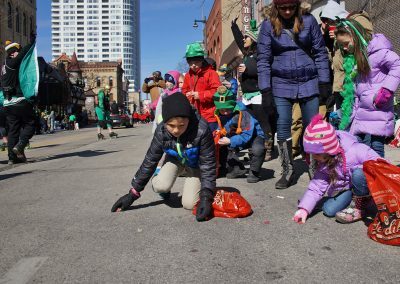 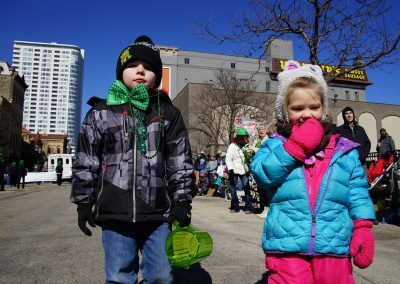 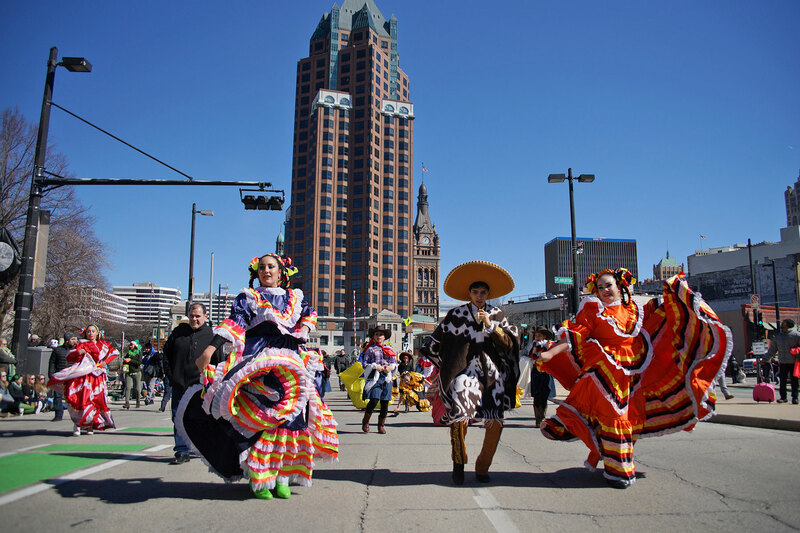 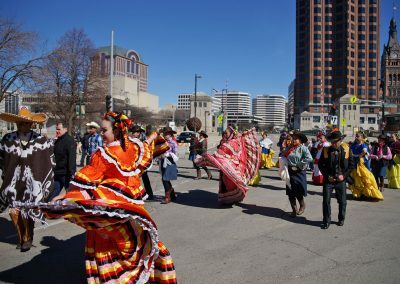 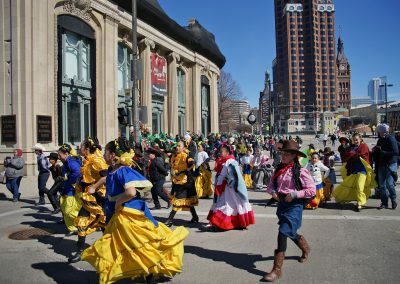 The parade featured local celebrities and dignitaries, including Mayor Tom Barrett and Milwaukee Aldermen Bob Donovan and Cavalier Johnson, and showcased dozens of Irish community groups, including all six schools of Irish dance from southeastern Wisconsin. 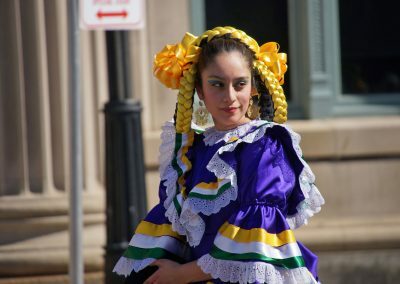 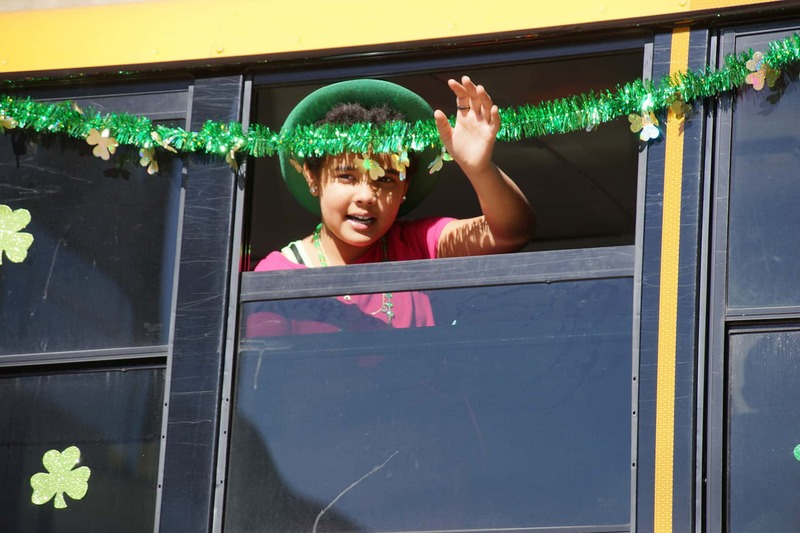 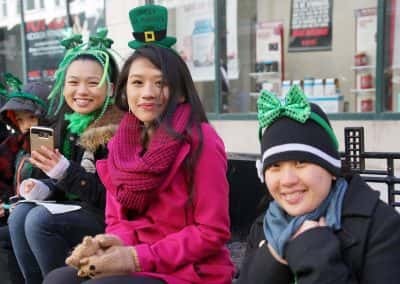 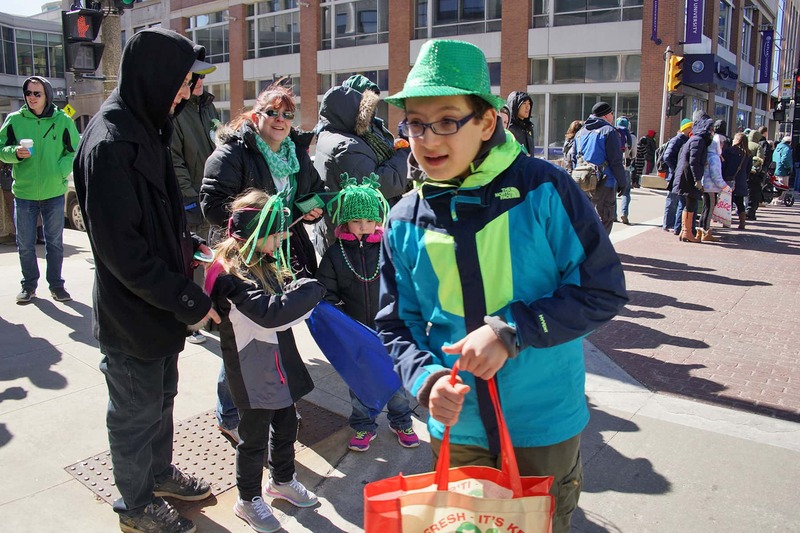 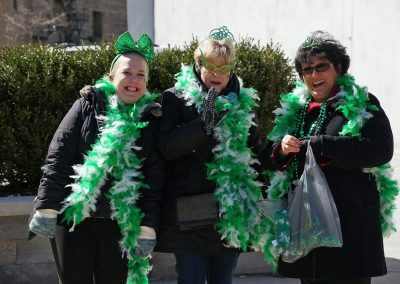 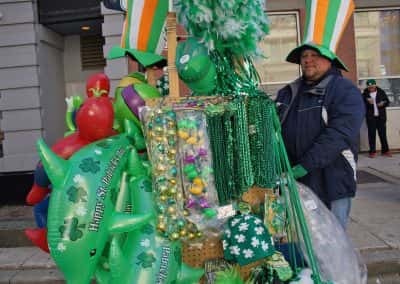 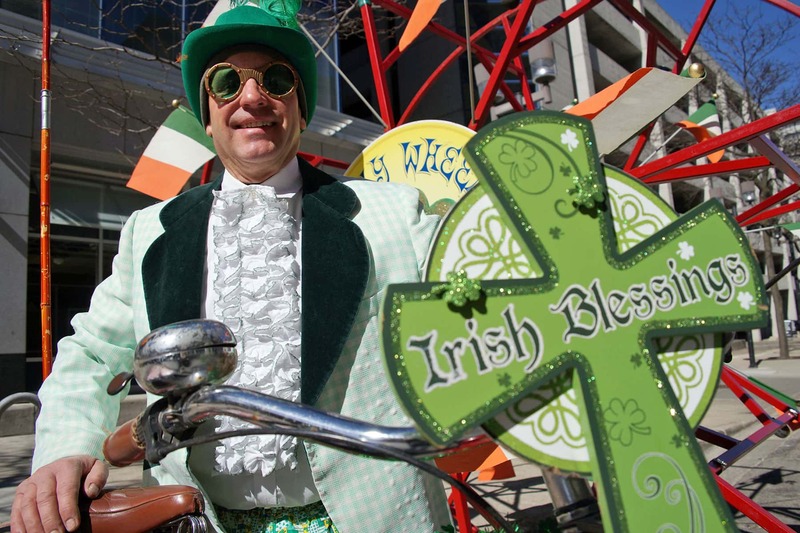 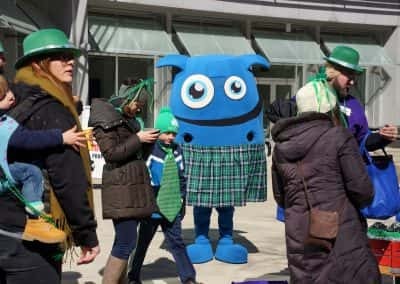 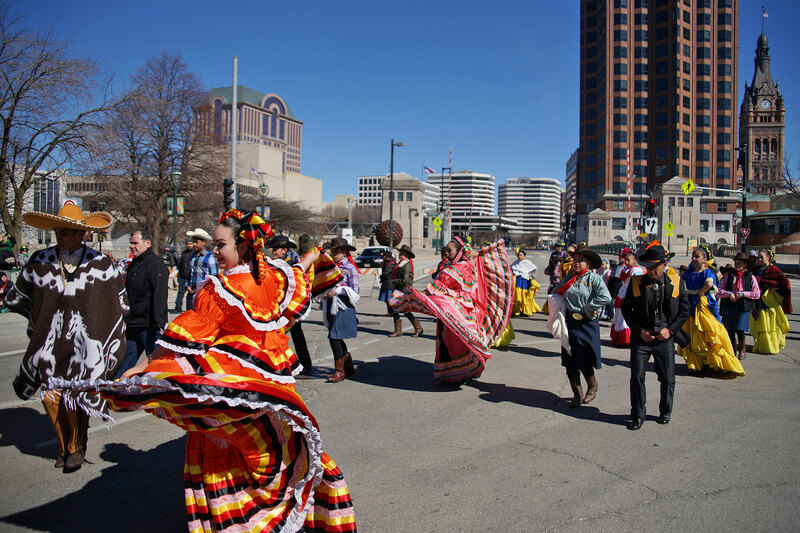 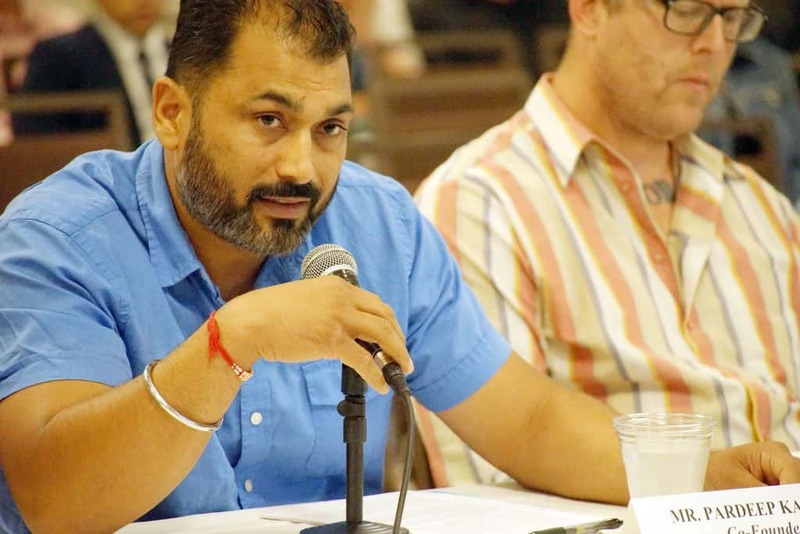 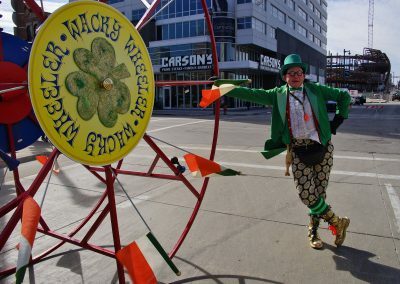 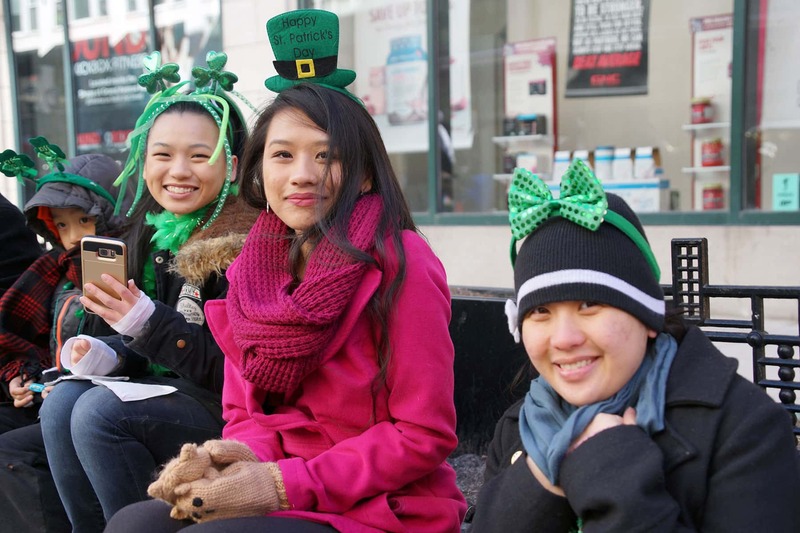 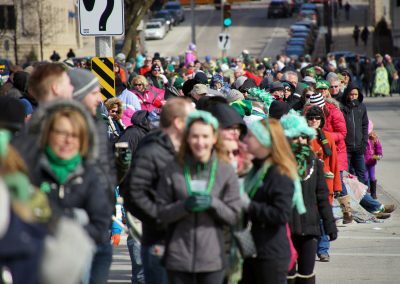 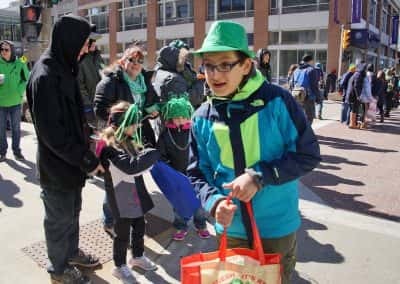 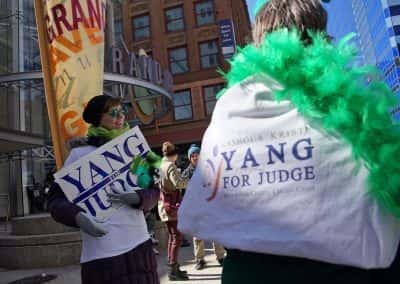 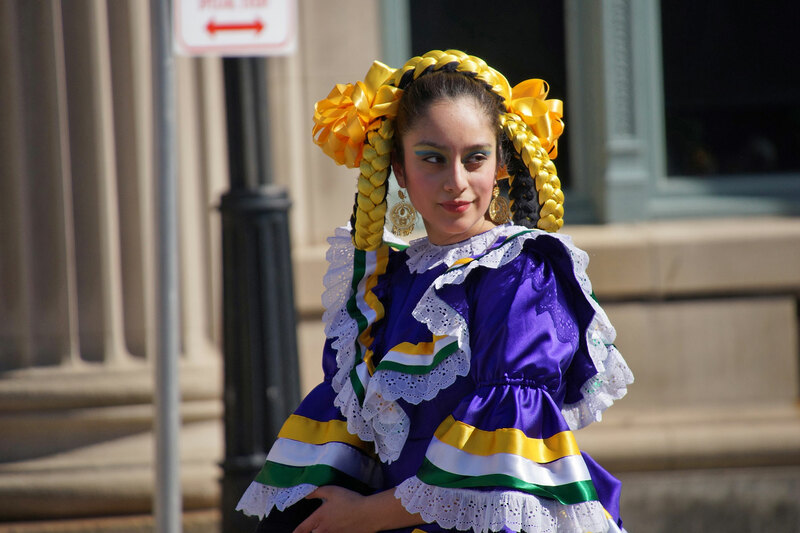 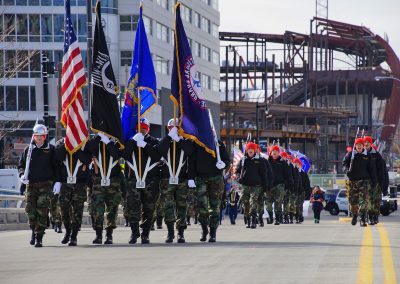 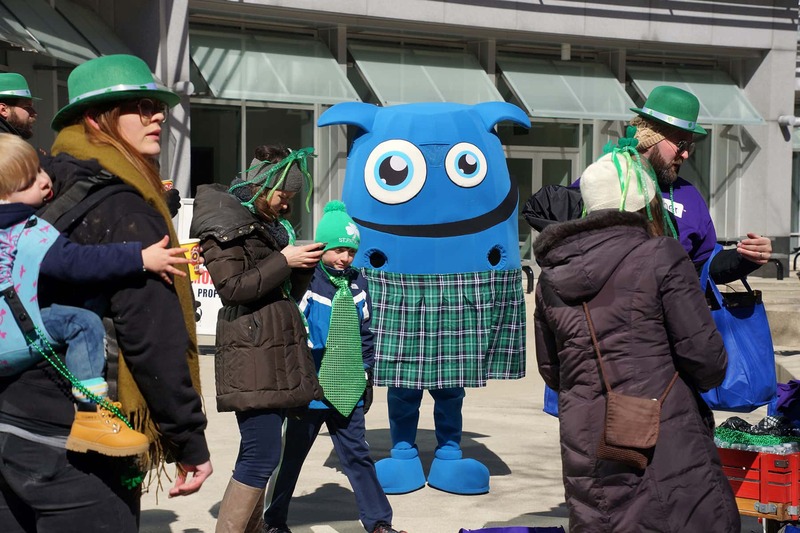 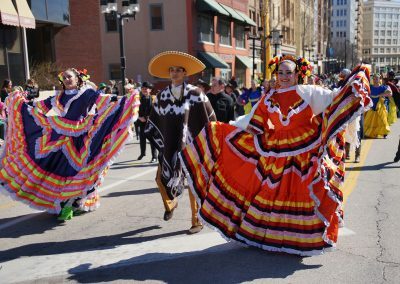 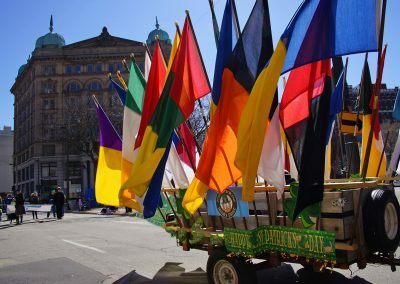 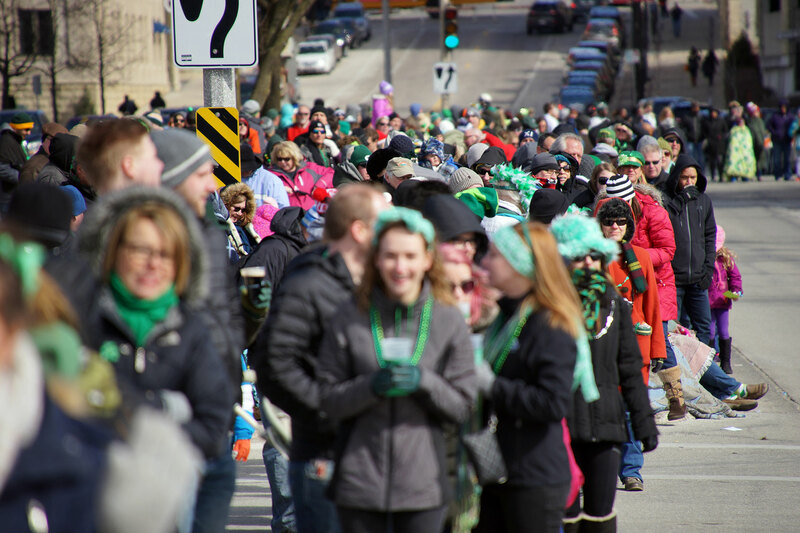 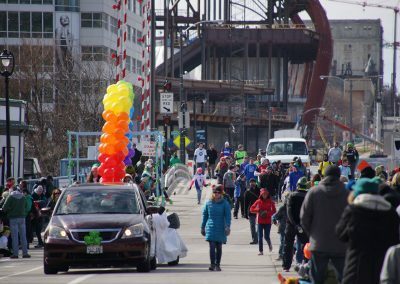 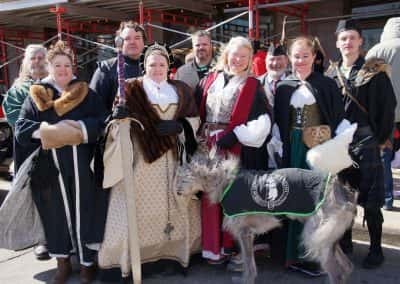 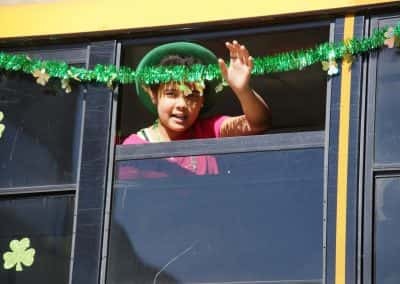 On a day when everyone is Irish, other ethnic and business groups joined in the parade, totaling more than 140 participant groups. 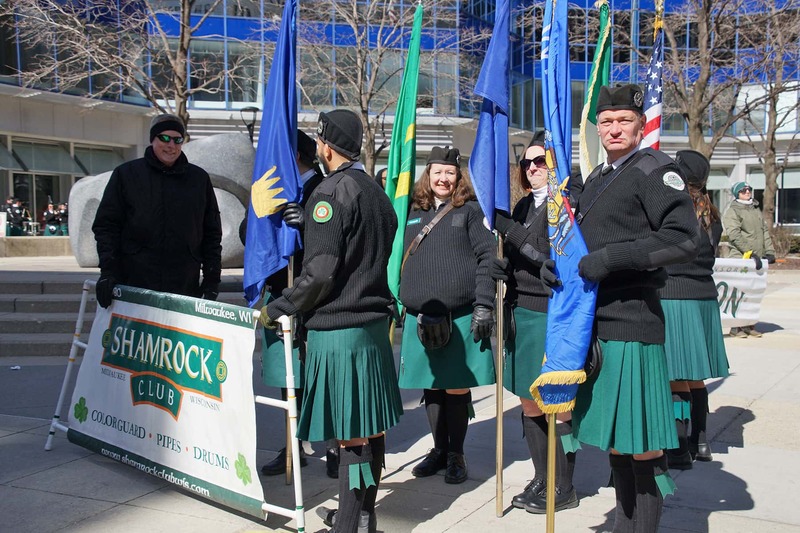 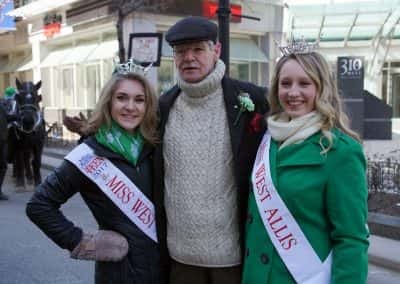 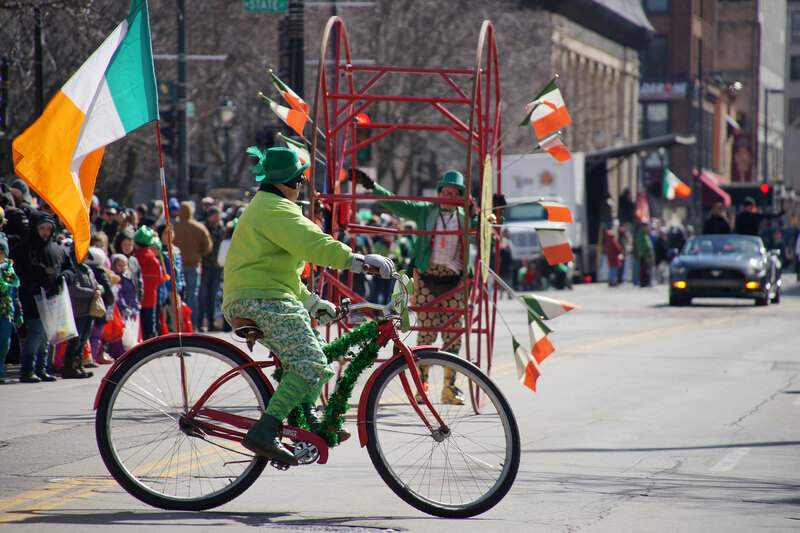 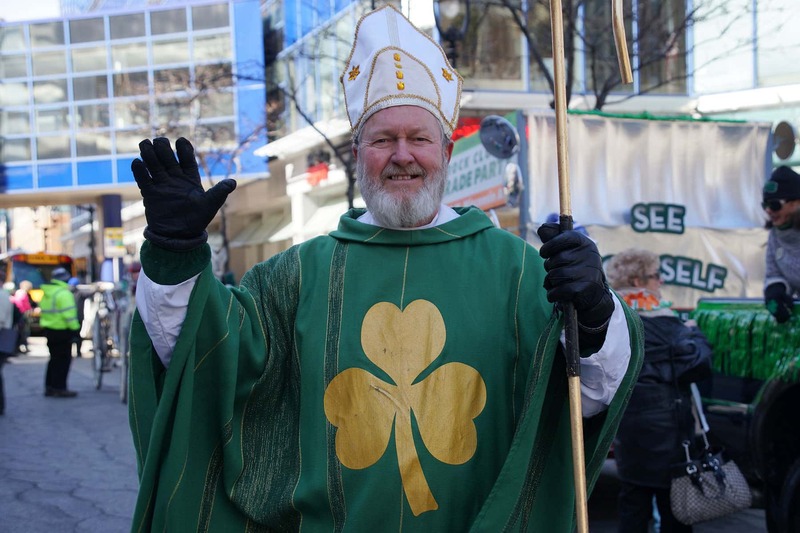 The Shamrock Club of Wisconsin has sponsored the Milwaukee St. Patrick’s Day Parade for 51 years, since 1967. 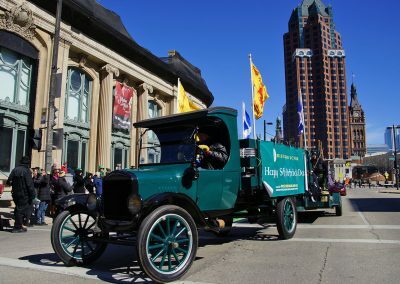 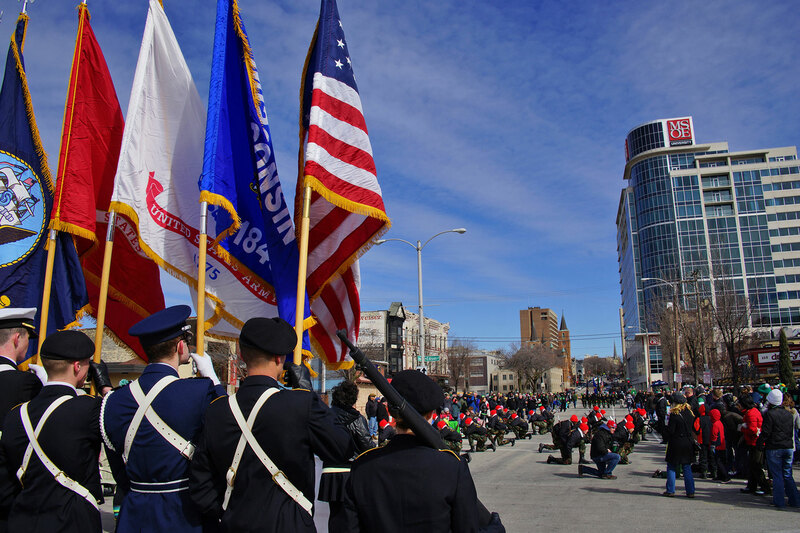 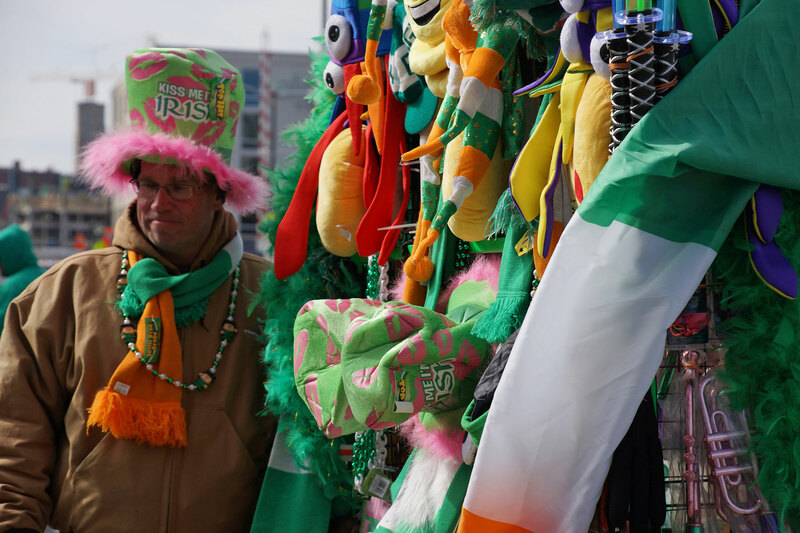 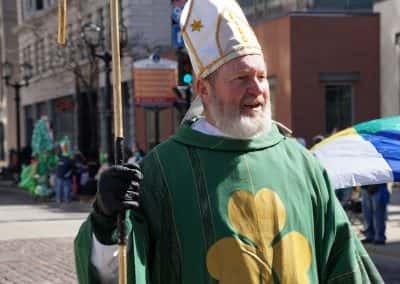 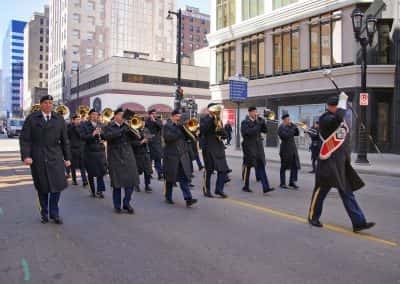 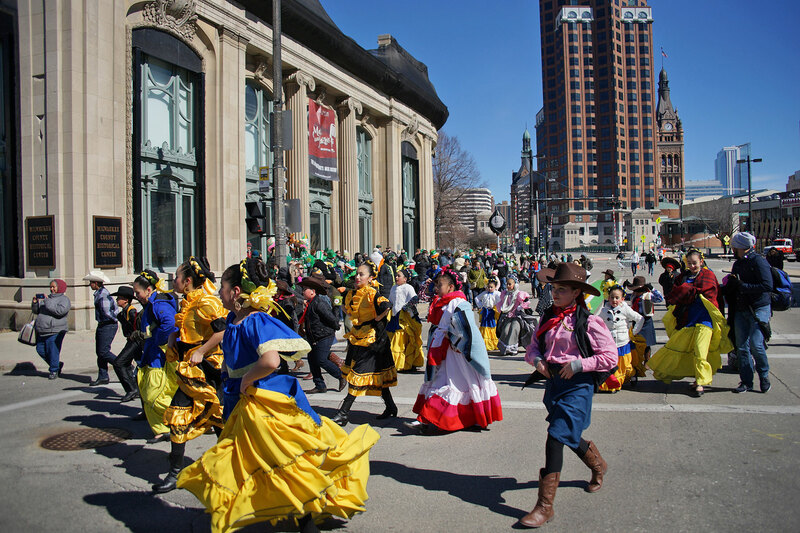 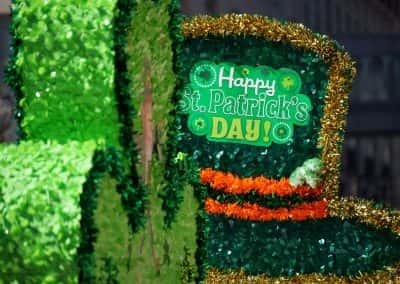 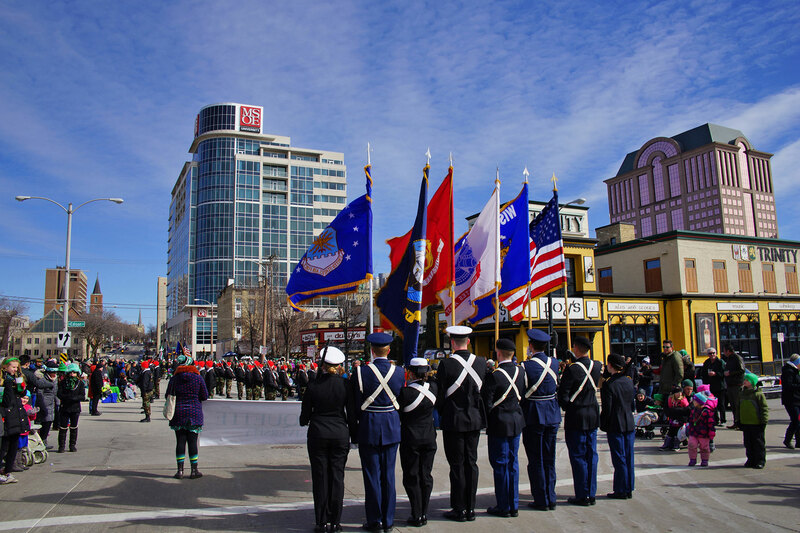 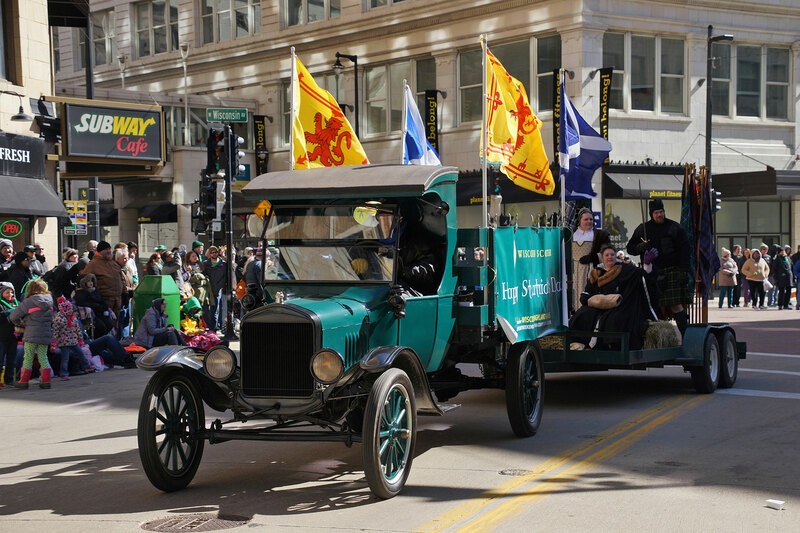 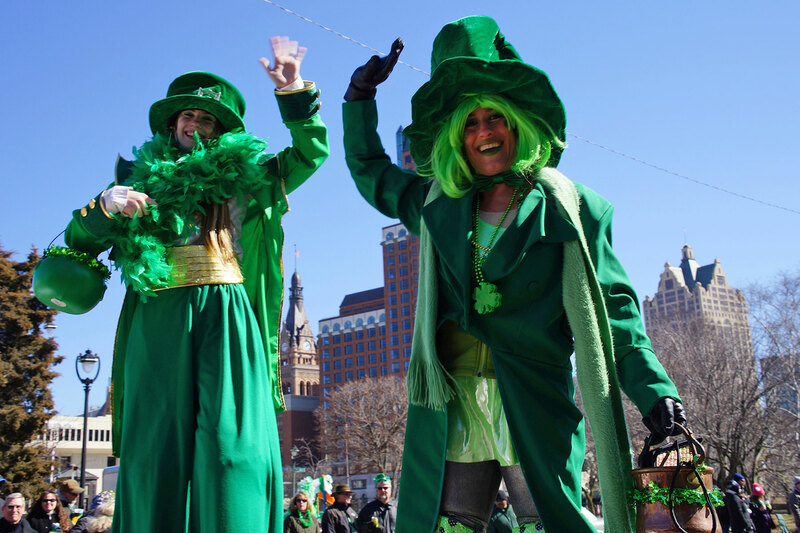 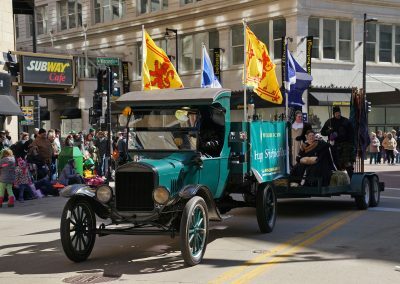 The first St. Patrick’s Day parade in Milwaukee dates back to 1843, making the city’s parade the sixth oldest in the nation, starting in 1843. 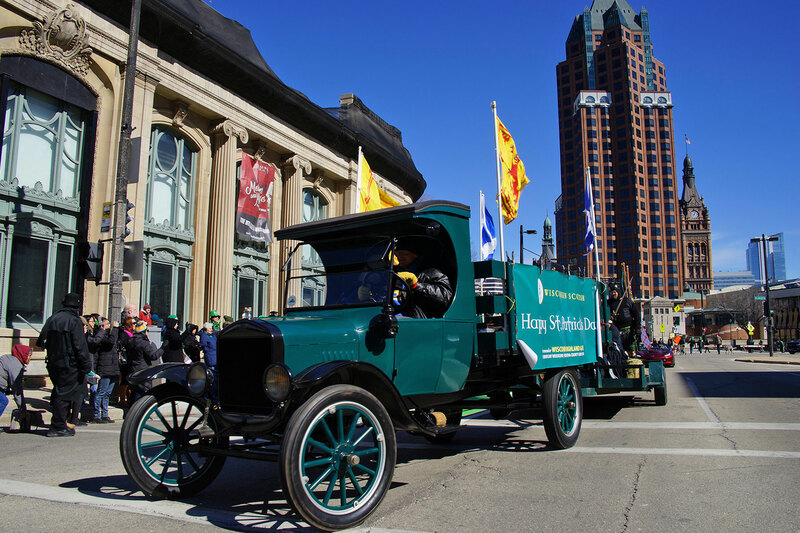 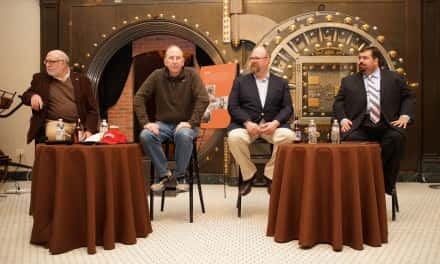 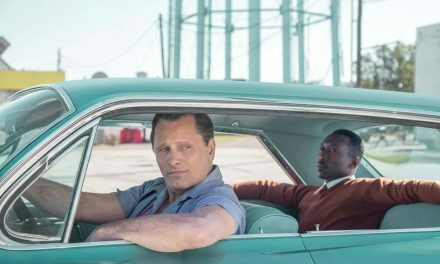 It predates the incorporation of the state of Wisconsin and the city of Milwaukee. 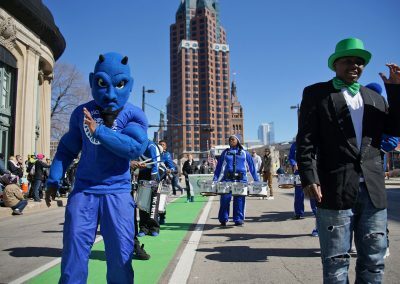 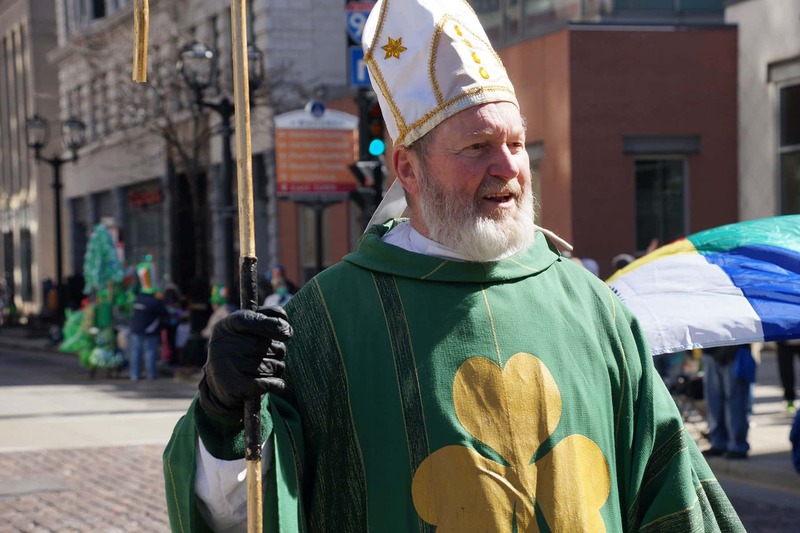 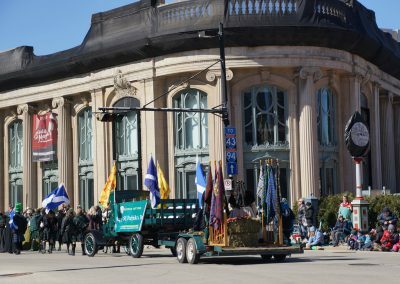 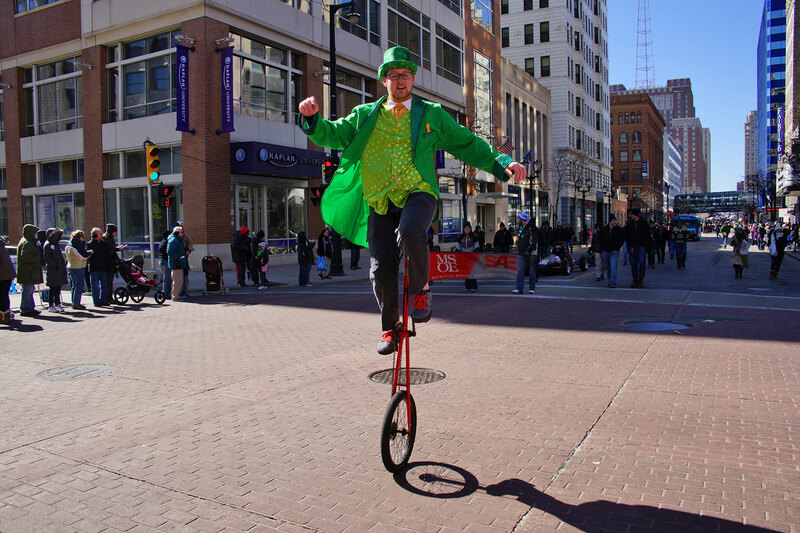 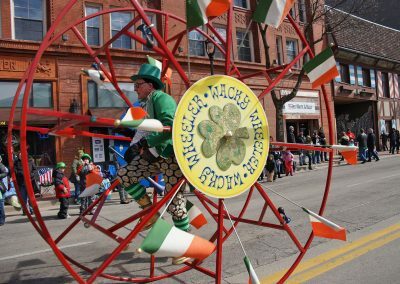 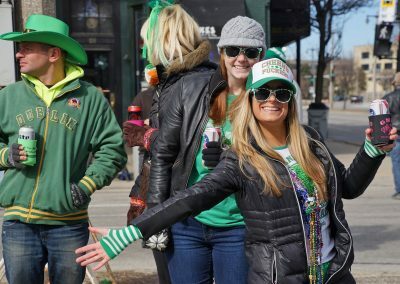 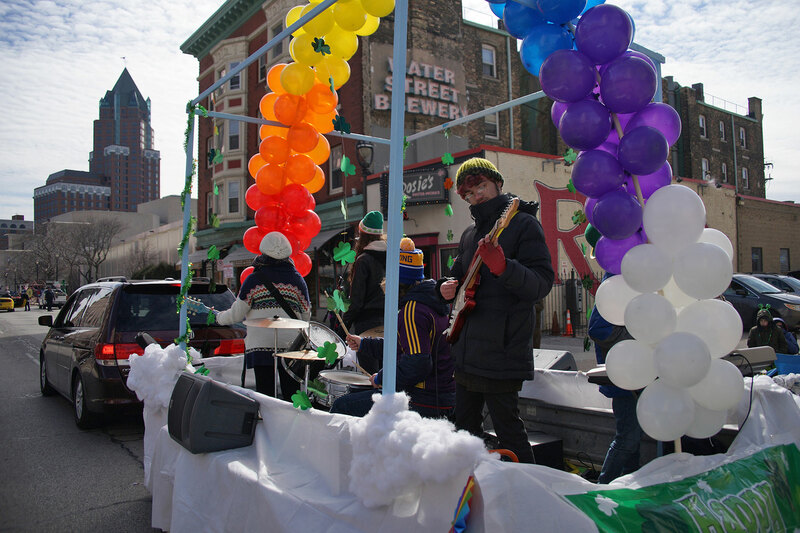 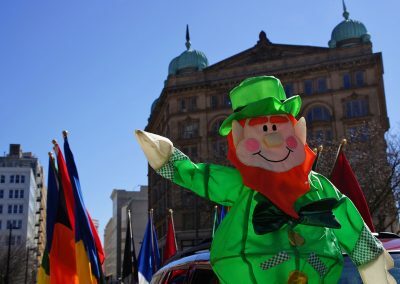 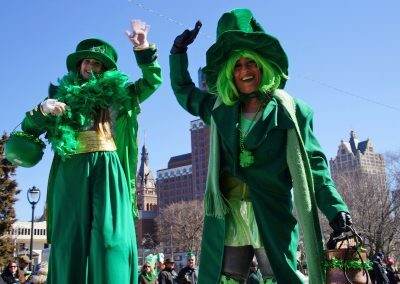 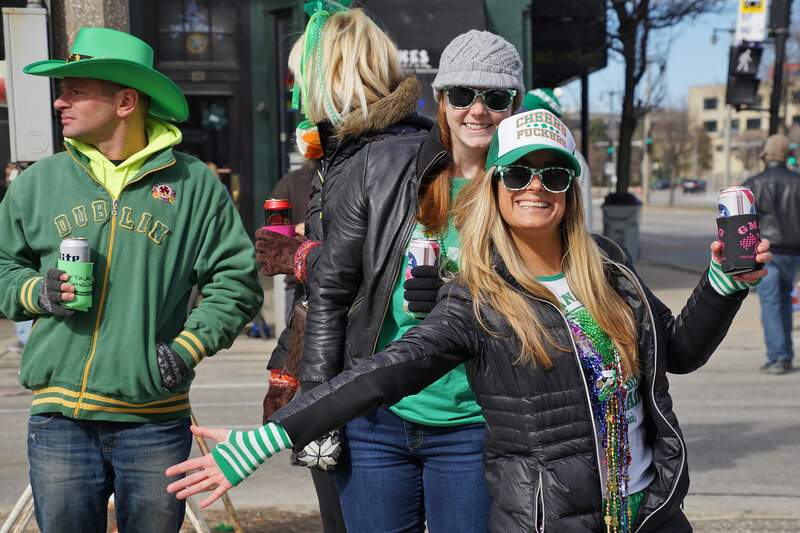 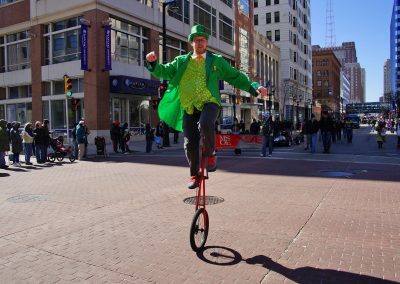 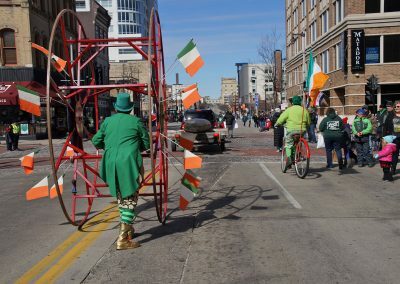 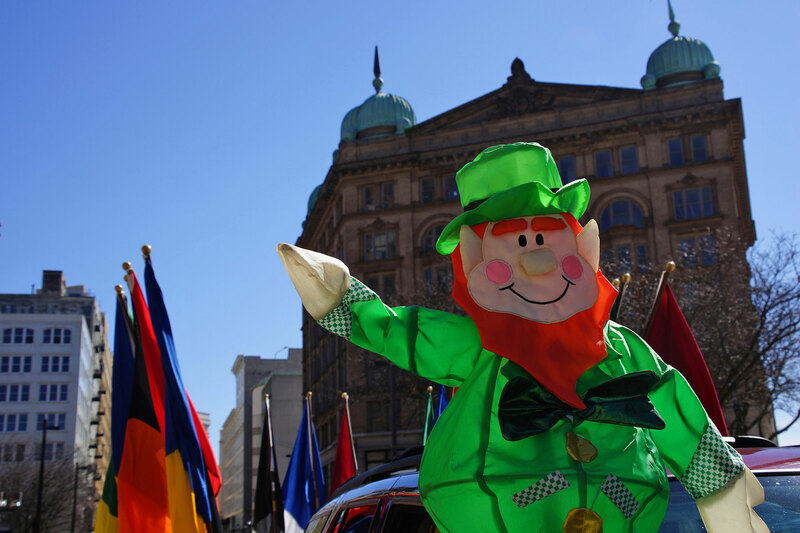 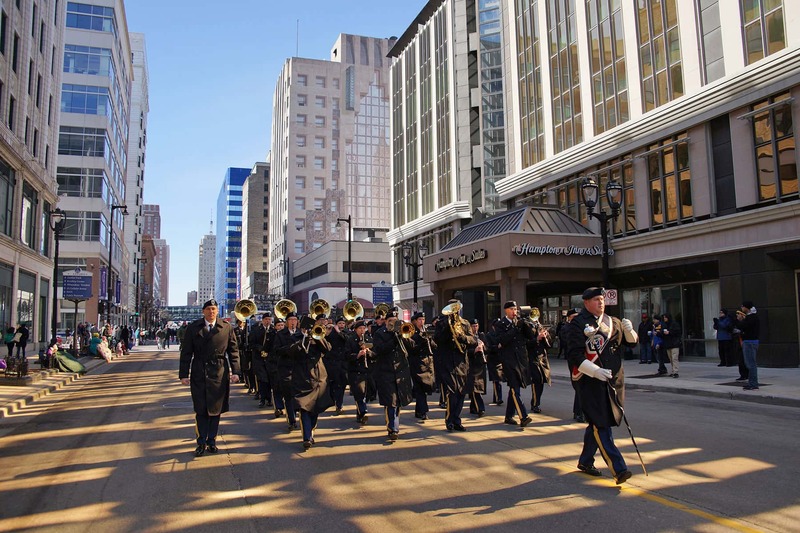 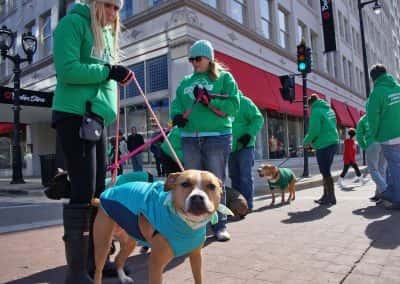 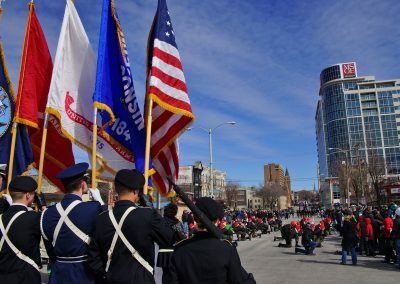 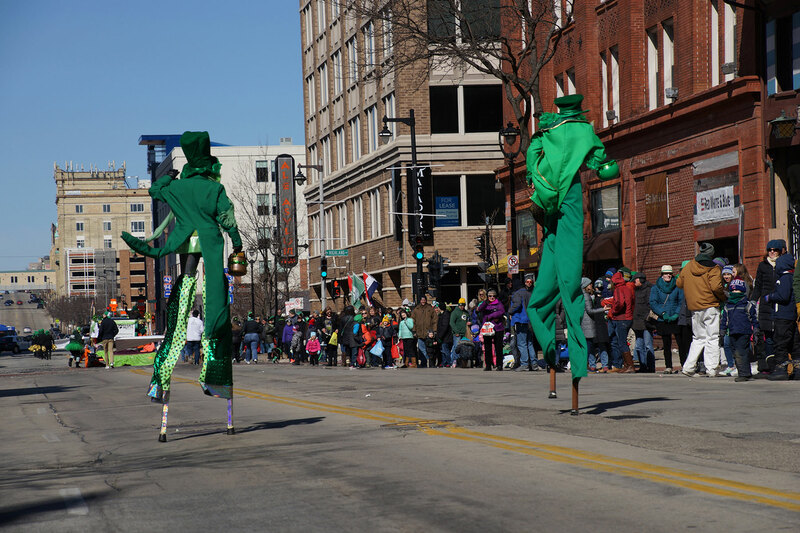 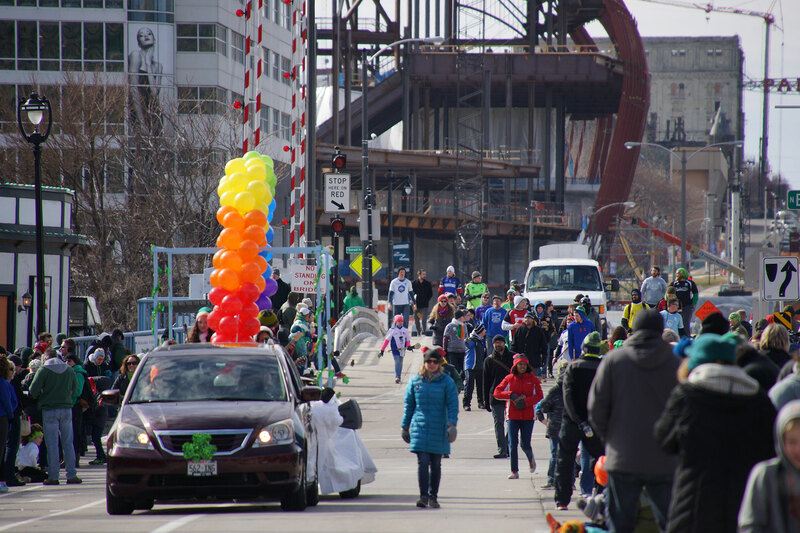 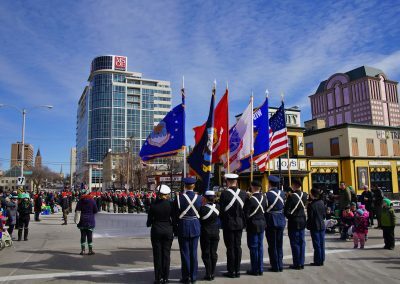 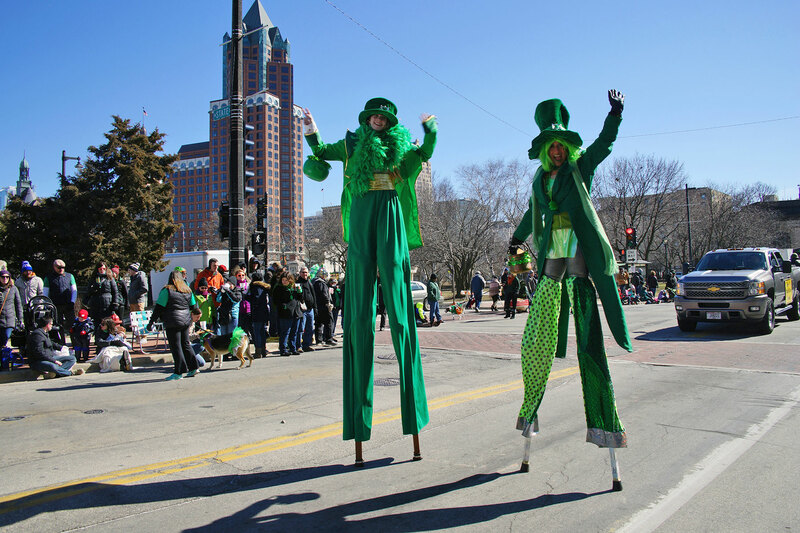 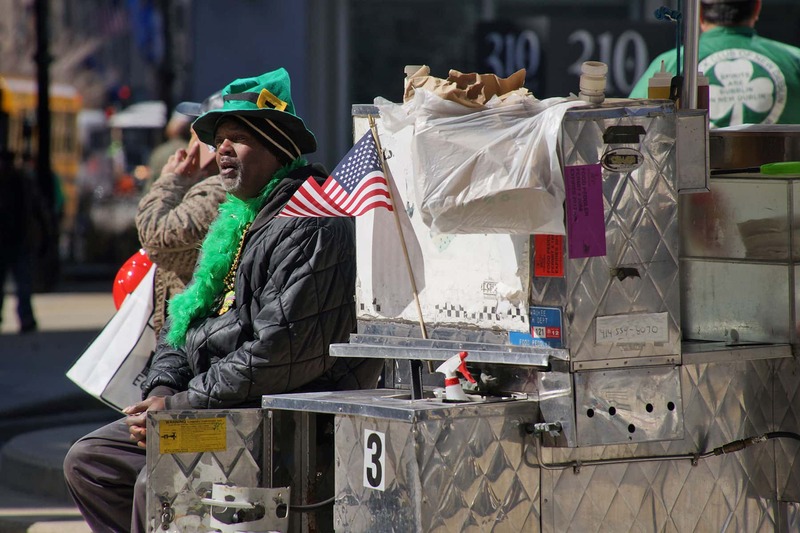 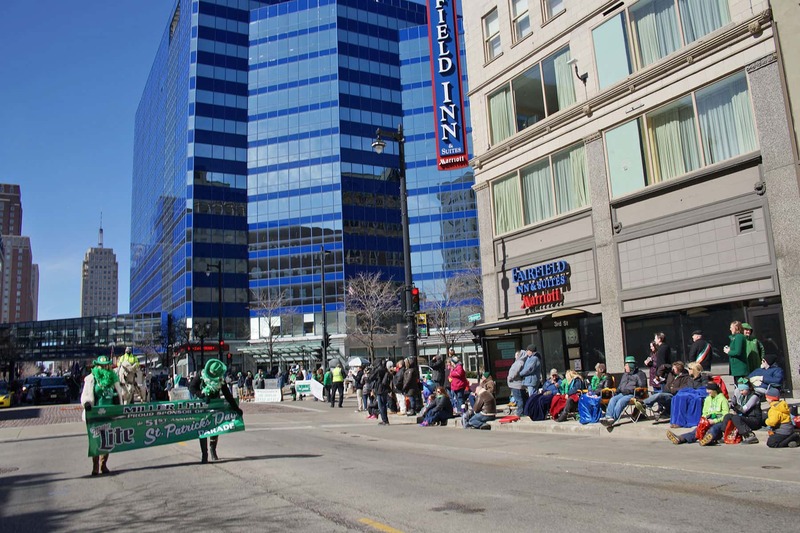 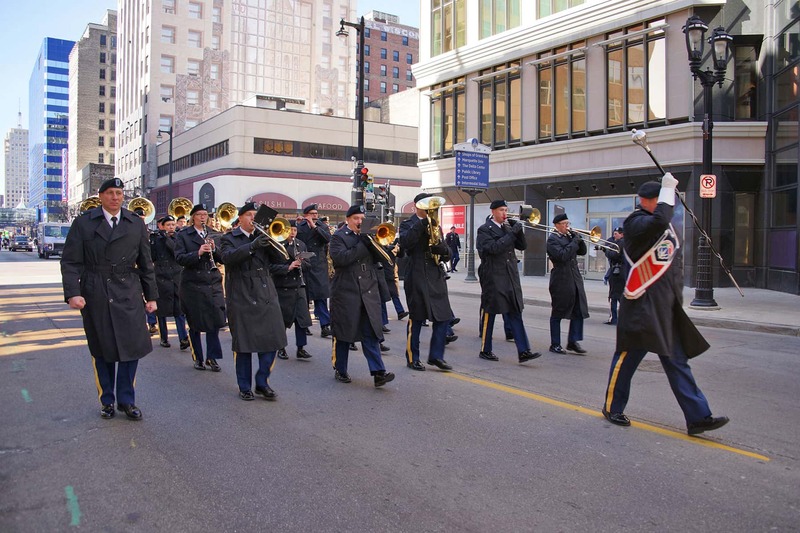 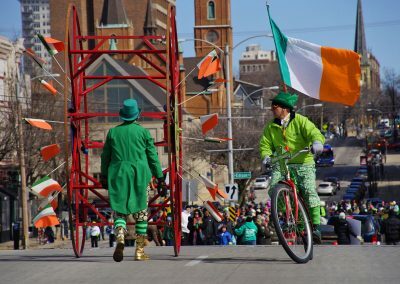 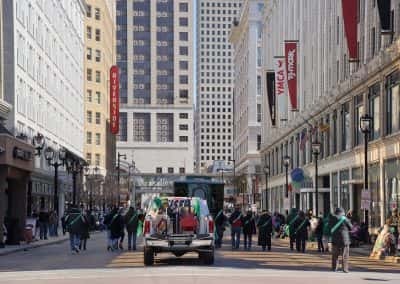 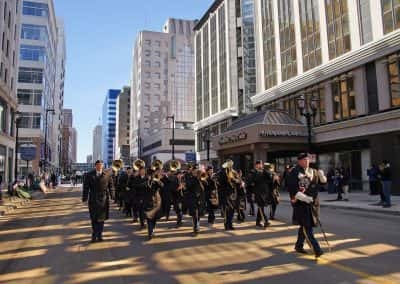 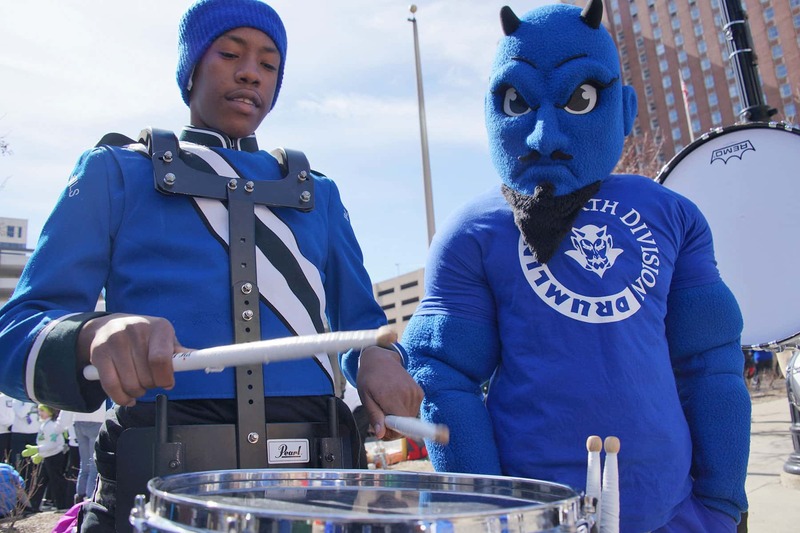 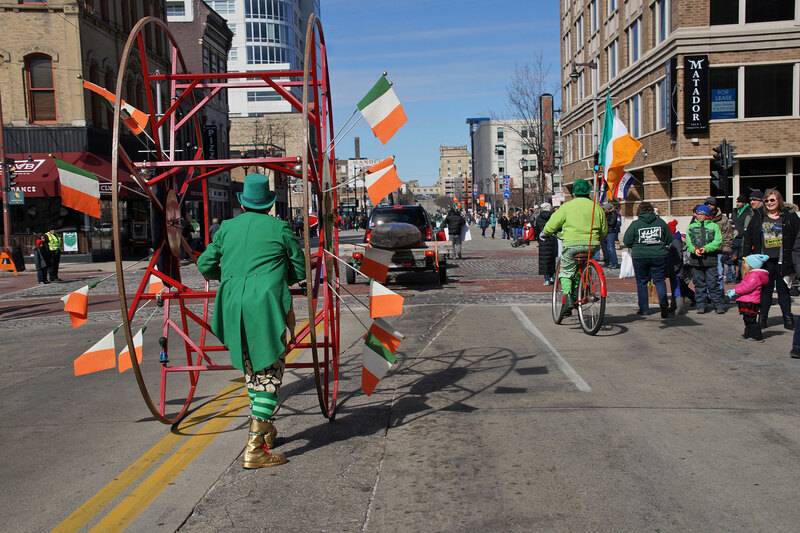 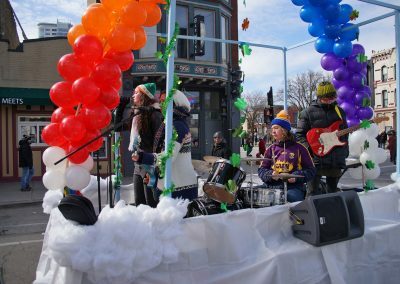 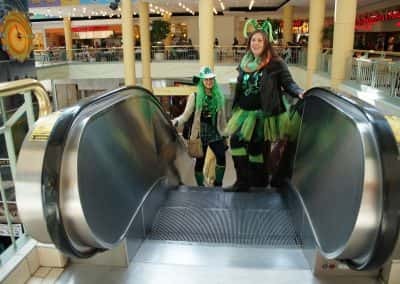 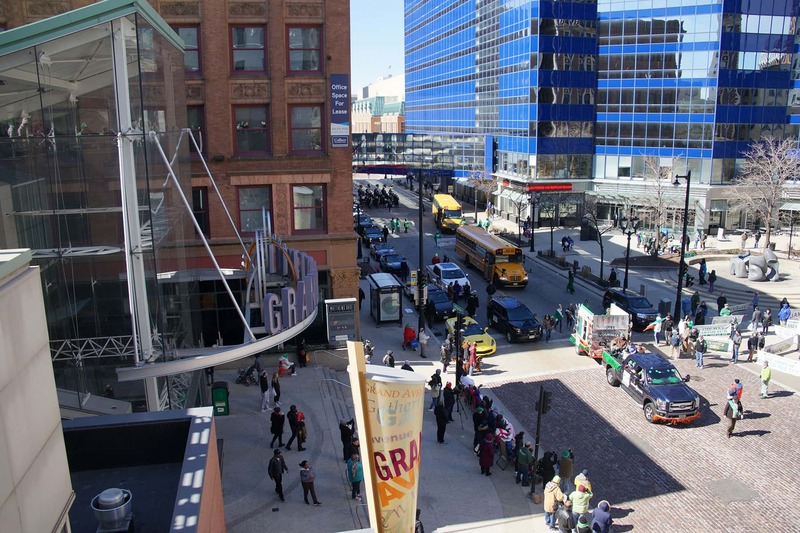 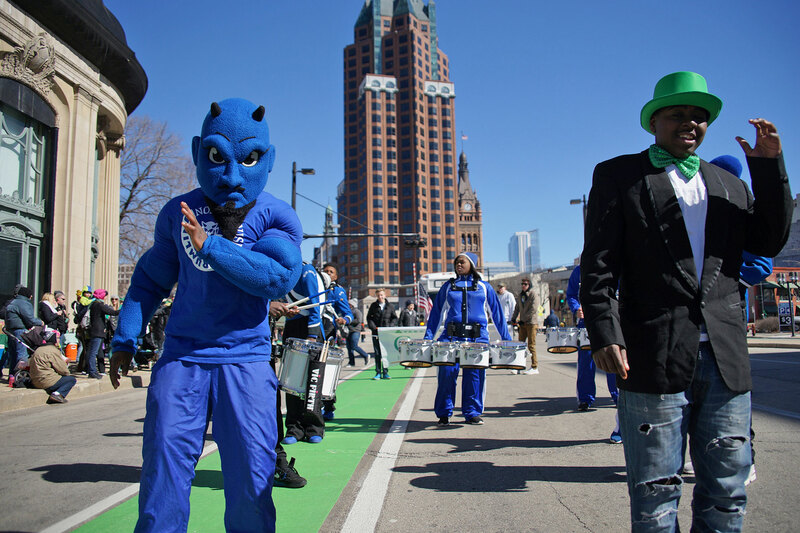 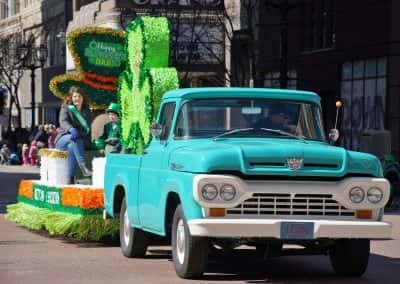 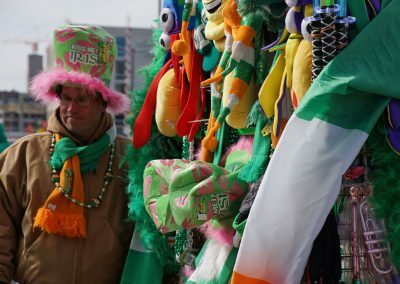 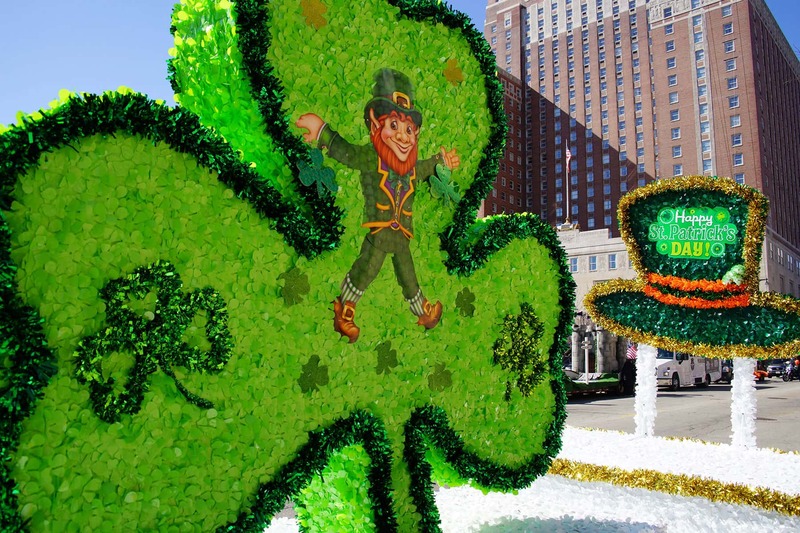 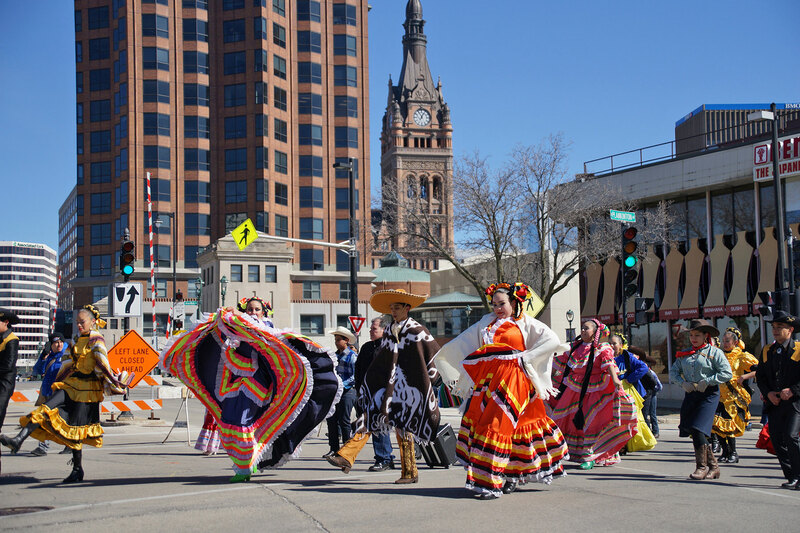 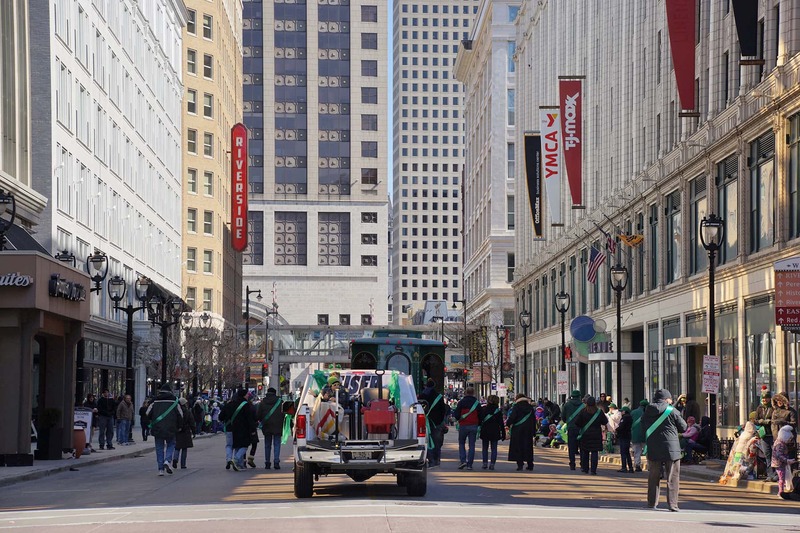 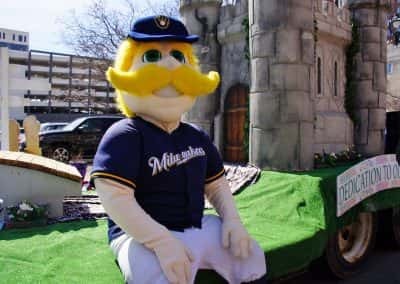 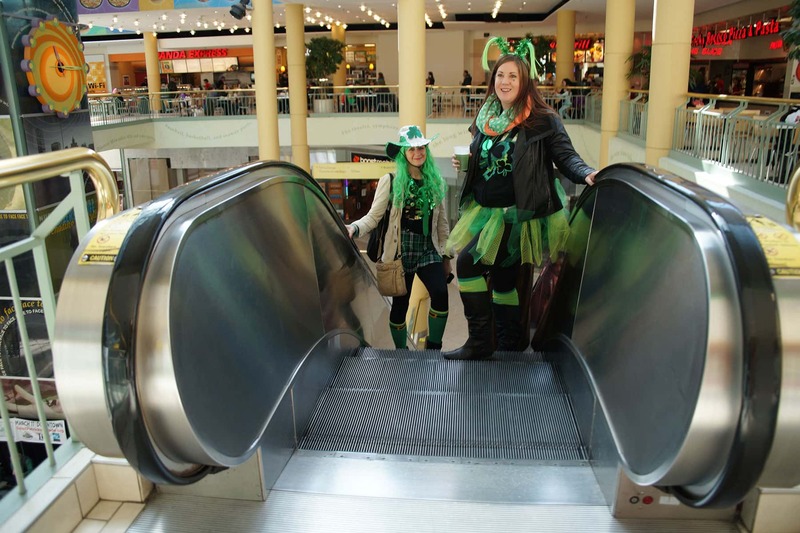 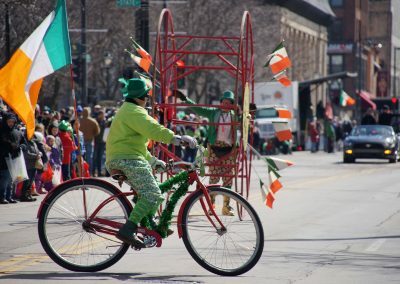 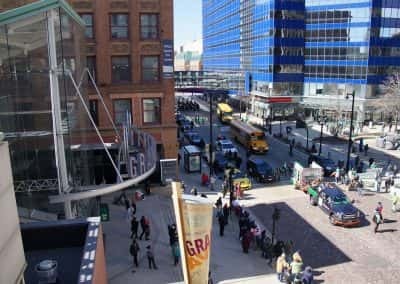 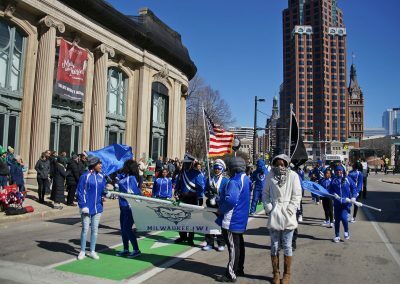 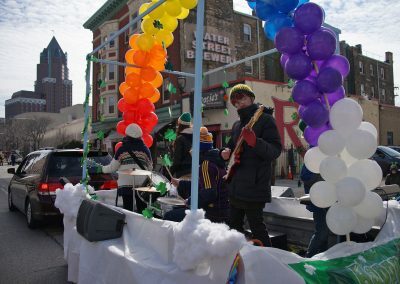 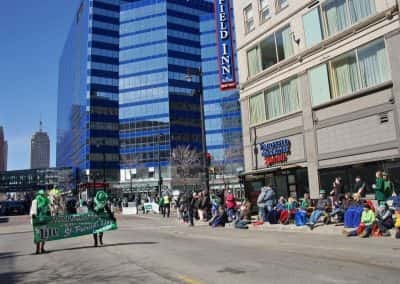 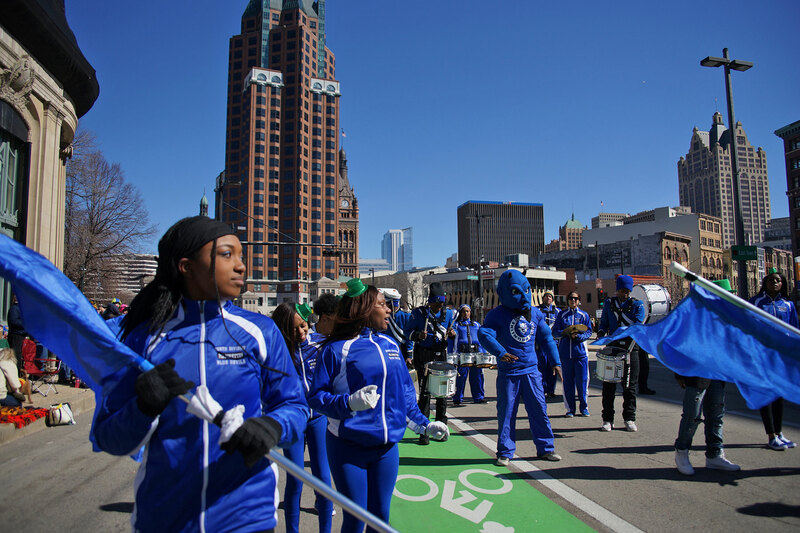 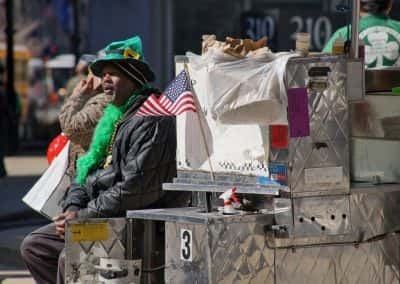 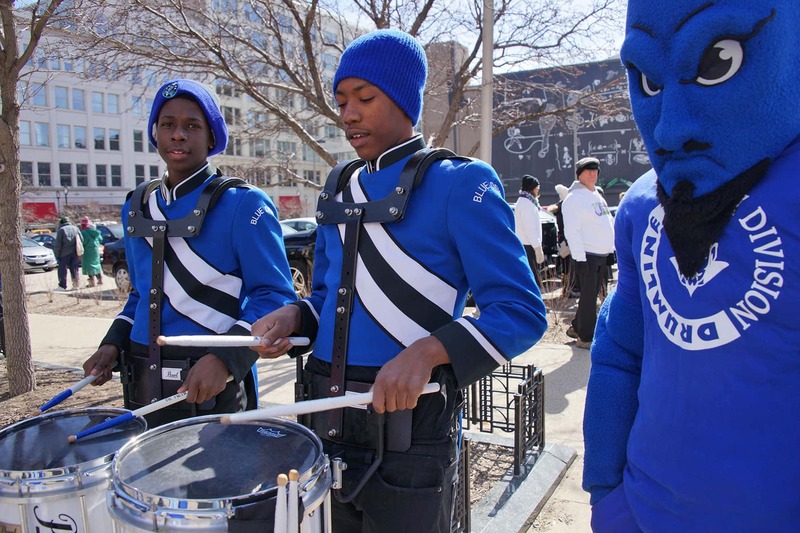 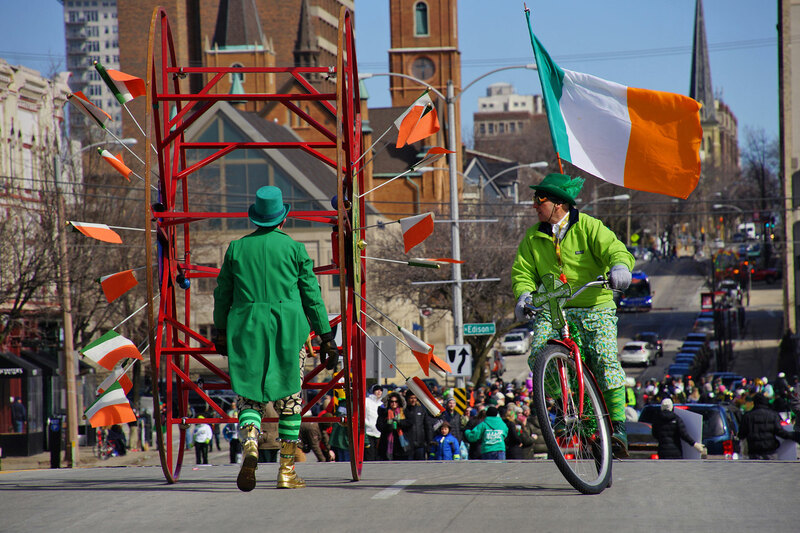 Milwaukee’s St. Patrick’s Day Parade was held in various locations over the past fifty years, including Wisconsin Avenue from 1967-74, Mitchell Street from 1975-86, North Avenue from 1987-2000, and Bluemound Road in 2001. 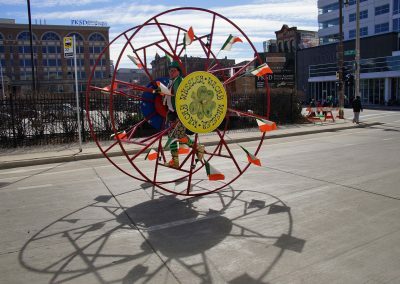 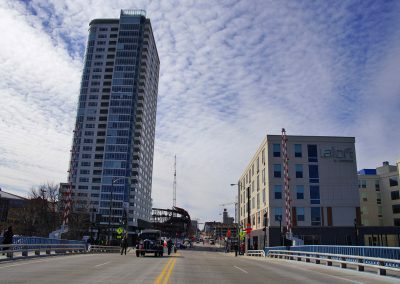 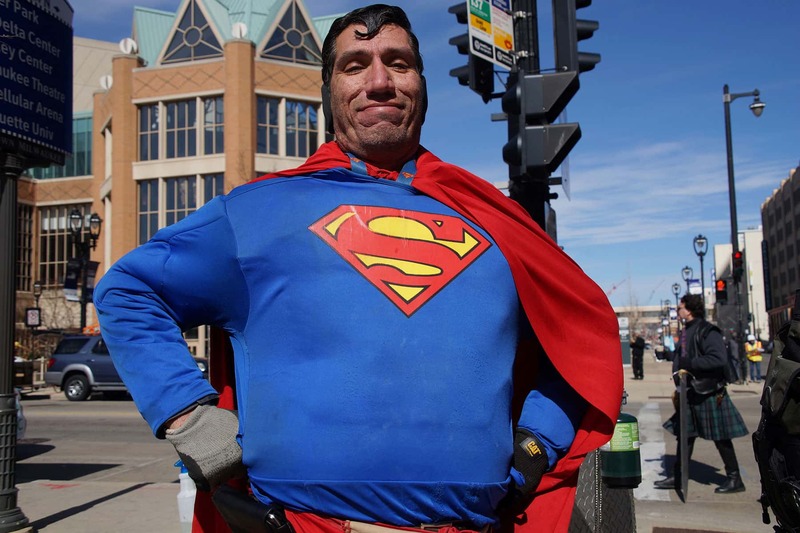 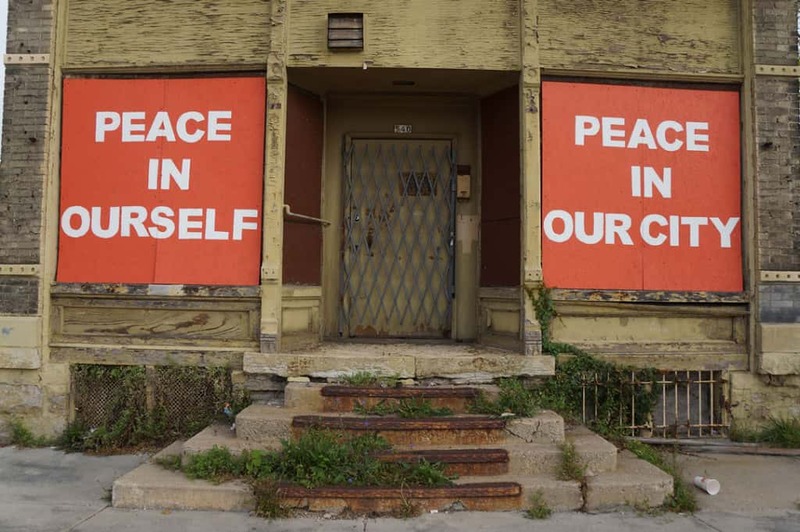 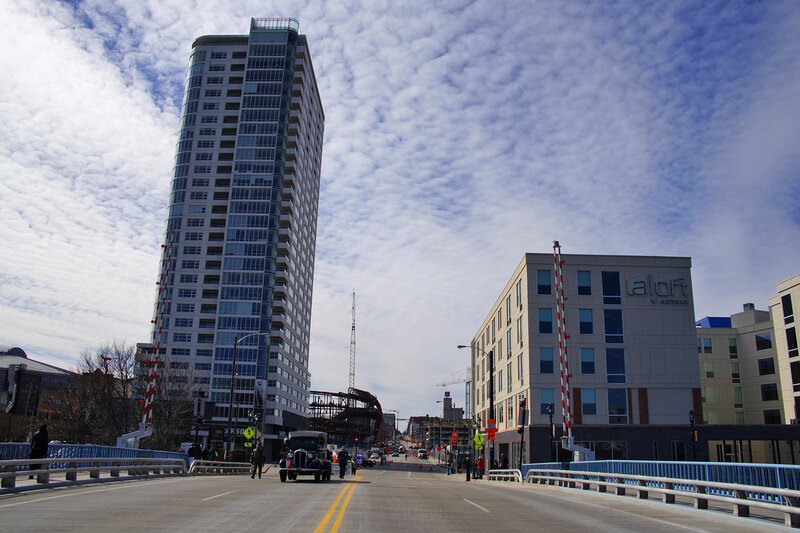 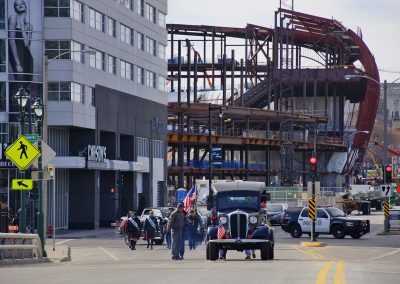 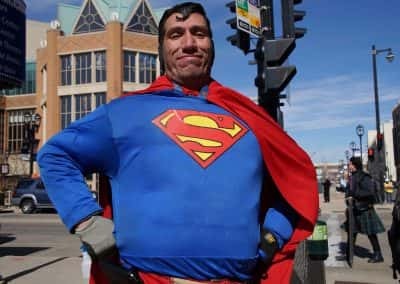 It returned to downtown Milwaukee in 2002, after joining forces with the Westown Association.